2018 Track Academic Awards 76 athletes earned a GPA of 3.5 or higher! Jacob Lopez 5th place in the Shot at 58-8.5. Discus 157-7. Angelee Berganio PR in 800 2:16.22. Travis Dyson Shot Put 48-11.5! It's time to register for our Summer Track and or Cross Country Programs! Make it a priority to get your returning players registered now. 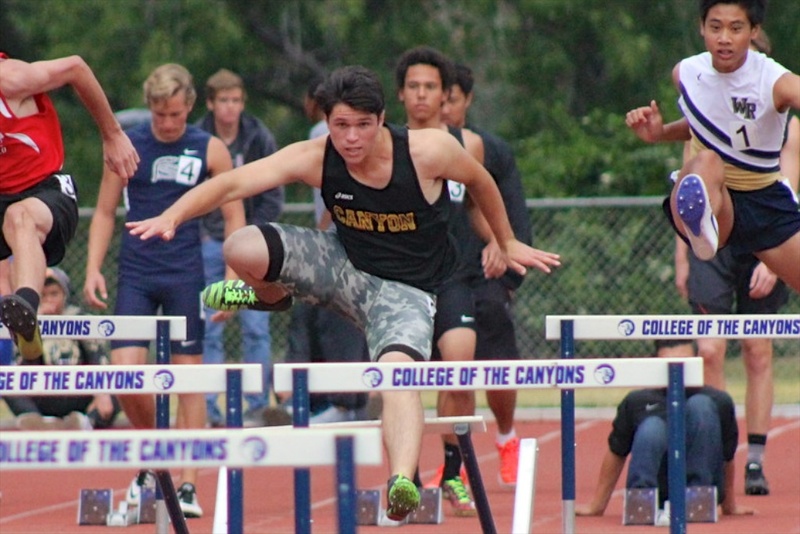 Go to the Athletics page of the Canyon website to register. Step 2. Obtain a Physical. Exer Urgent Care is hosting two Sports Physical Days for Canyon athletes. May 8th and 11th. Again...go to the Athletics page of the Canyon website to make an appointment. Cost of the physical will be $20 on those dates only. Step 3. Pay for Camp. 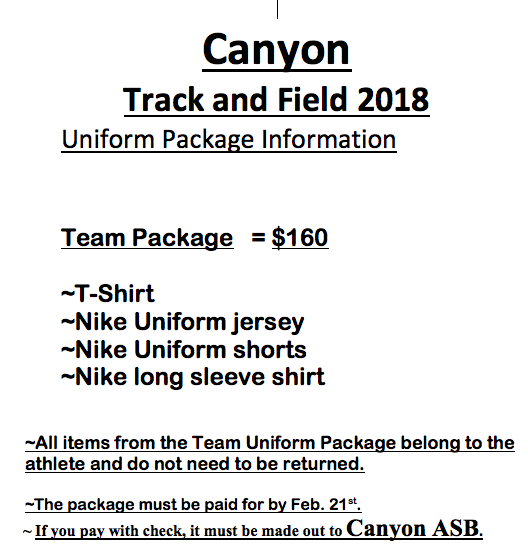 Cash or check made out to Canyon ASB, or online at the ASB web store. A big win over Valencia yesterday! born! The girls victory is big, as we haven't beat them in 3 years. Jacob Lopez again set two meet records: SP 54-2 and DT 155-10. Coach Dave Arellano and Family! Emily holding Asher, and Jace, and Lilly! be eligible to continue to participate. Last week I reported that we had 106 PRs. I thought that could not happen again. I was wrong! This week we had 119 PRs! these PRs. Every athlete (except 1) had a Personal Record! Angelee Berganio runs a 2:16.30 800 #3 AllTime! the High Jump at 6-3. Jacob Lopez wins the Discus Throw 173-9 and Shot Put 56-9. at the Nike Redondo Invite. Varsity boys won all 6 field events and all 3 distance races. 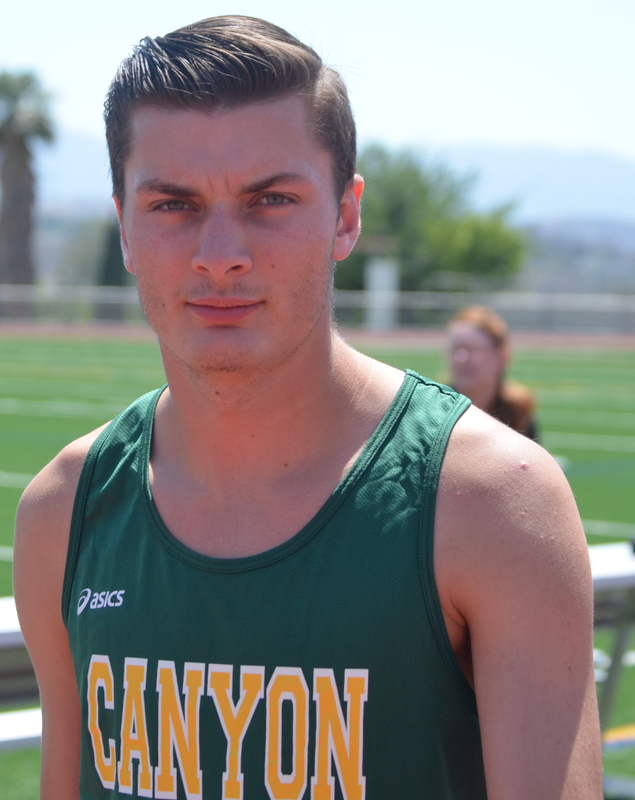 Tyler Cash won the HJ 6-2, LJ 19-6, and PV 11-0.
with a PR 177-2.5 He also moved up to #3 on the All Time Top Ten List. season ranks tied for 3rd in California. Travis Dyson won the FS Shot Put with a PR 49-8. 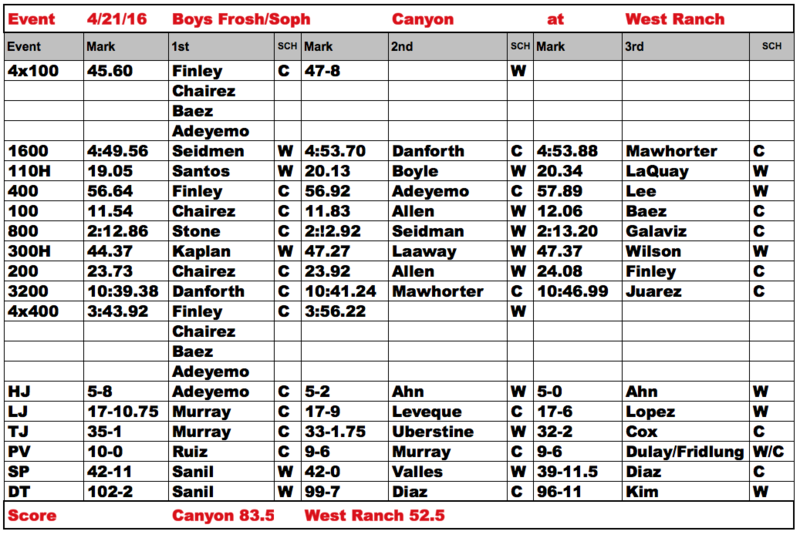 Below are the results of our Pre-Season Decathlon. 23 boys and 14 girls attempted the gruling 10 event competition. Austin Texas Marathon with a time of 2:20.22. 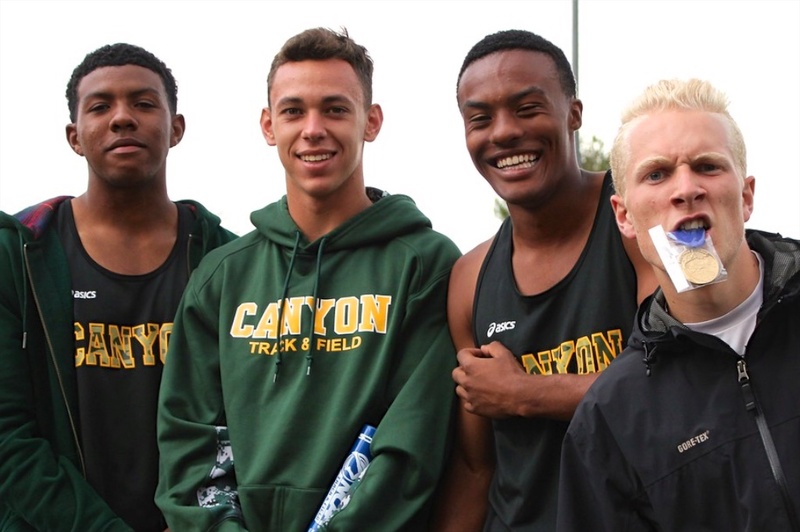 An interesting fact: Canyon has won 36 Track titles in the last 32 years. 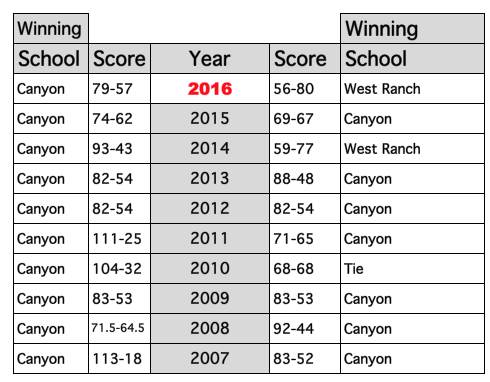 The rest of the Foothill league combined has won 28! Parent Volunteer page and email coach Broneer at paulbroneer@me.com if you can help our team in any way. 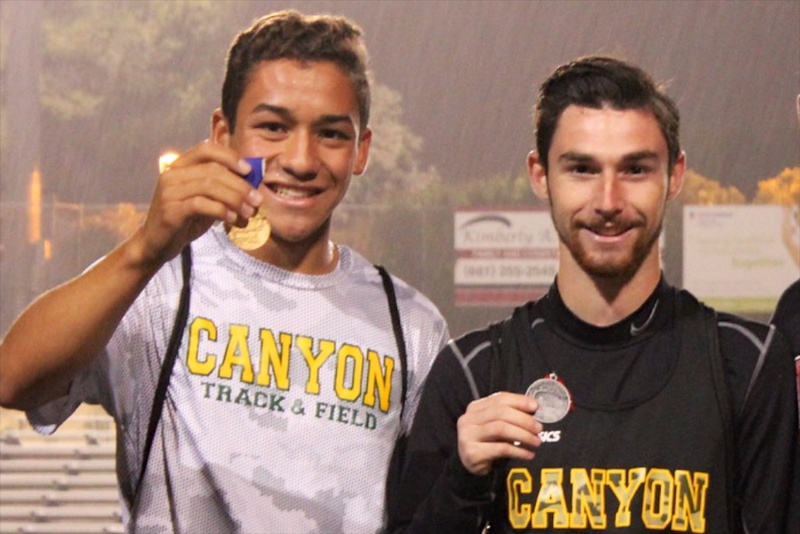 Please visit the new SCV Track website! last year when he won the Mt. 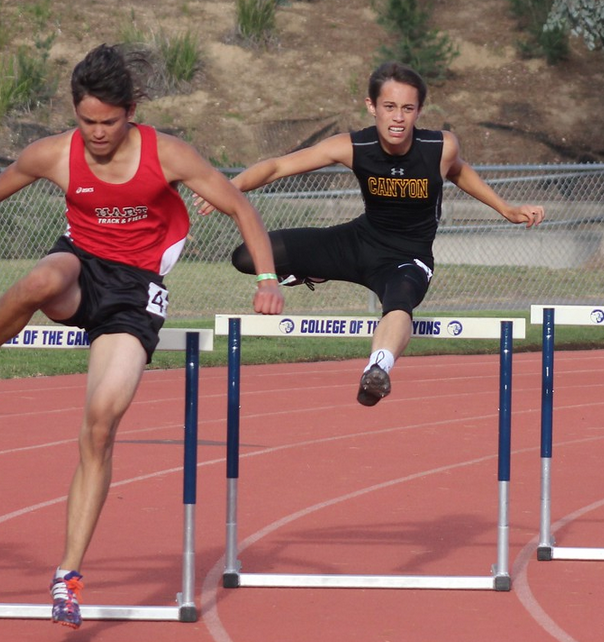 SAC Relays. 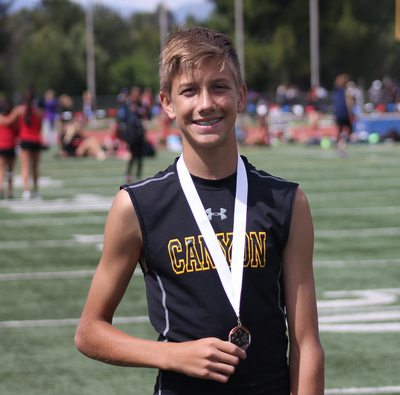 Tyler Cash wins the High Jump at the Junior Olympics . He's with Former world record holder Dwight Stones. 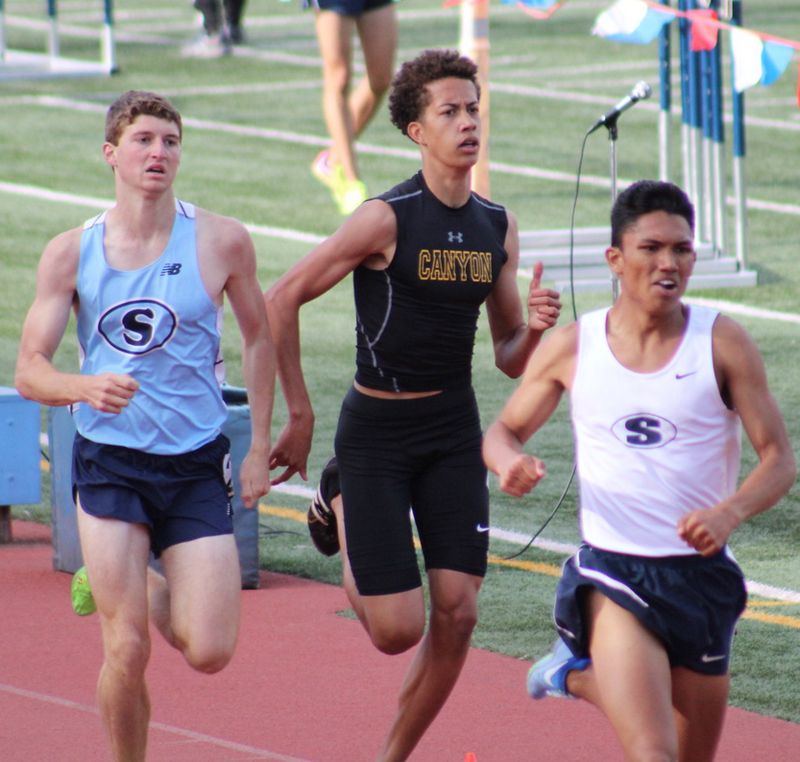 Ethan Danforth placed 4th at the State meet in the 3200 m with a PR 9:00.30. 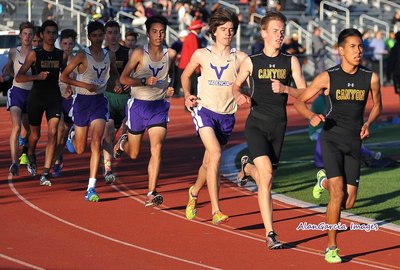 By Haley Sawyer Signalscv.com CLOVIS – By the last lap of the 3200-meter race at the CIF state finals at Buchanan High School on Saturday, Canyon’s Ethan Danforth had worked his way up to third place.With less than 600 meters remaining in the race, he still saw two runners in front of him.“I was just trying to conserve as much energy as possible for that, like, last 300 and then it was just all out pretty much,” Danforth said. “Just gave it everything I had.” The junior ended the event in fourth place at nine minutes, .30 seconds – setting a new record by three seconds, nonetheless. Danforth, who typically comes into races fairly relaxed, said that one of the hardest parts of the finals was getting dialed in. “It’s always harder to like, have your rhythm when you’re on the road,” he said. “Your pre-race rhythm, your rituals and all that and I just tried to stick to them as much as I could.” Valencia’s JaCore Johnson also reached the podium at the state finals, clocking 47.62 for fifth place in the 400-meter dash. 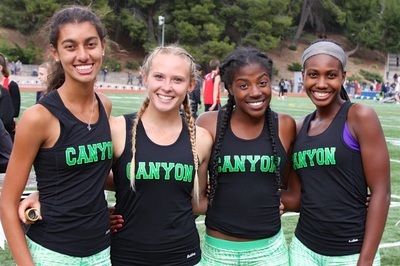 *Check signalscv.com later for more results from the CIF state finals. 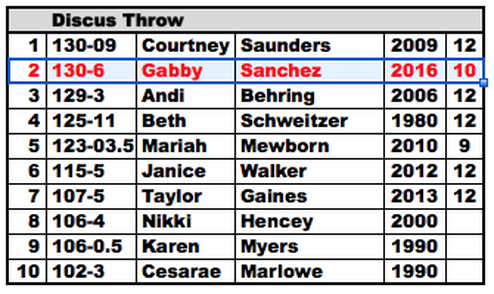 Girls Discus Throw: Gabby Sanchez threw 139-1 to place 13th. Only 12 go to finals. 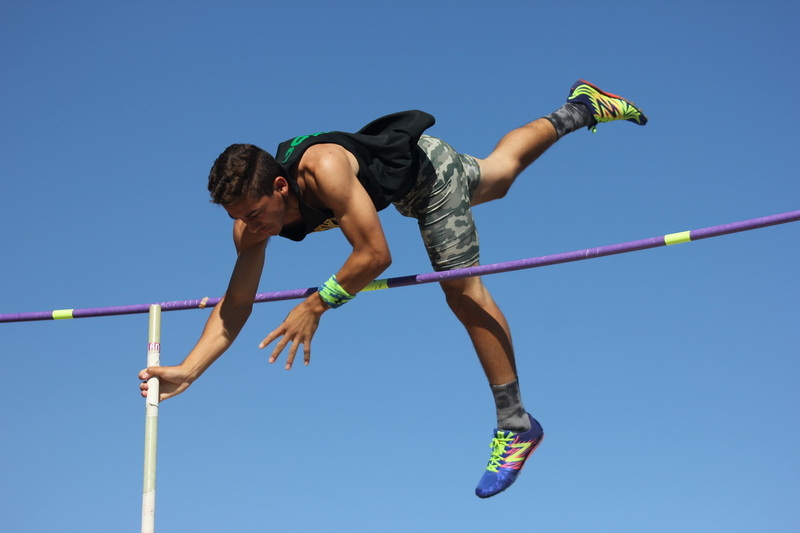 Boys Pole Vault: Christian Valles cleared 14-3 and 14-9 with no misses and qualifies for finals! Christian Valles Cleared 15-4 to place 8th in the Pole Vault. Gabby Sanchez with Coach Thaddeus Kline after qualifying for State placing 4th at the Masters Meet! 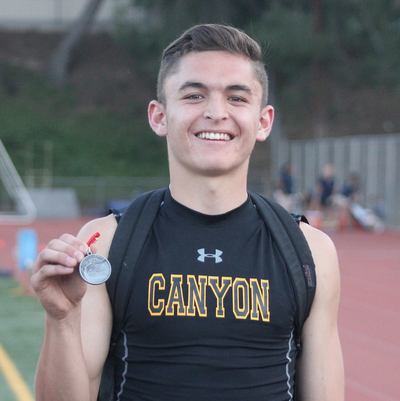 Christian Valles School Record Vault at Masters! 15-9 Click on Picture for Video! Ethan Danforth with Coach Velarde after qualifying for State with a 2nd place PR of 9:03.03 at the Masters Meet. Great Banquet - sorry is was so de LONG! had the courage to compete. This is the first year in my 23 years at Canyon that this has happened. Pole Vault, Javelin Throw, and 1500.
scored at least one point in a Foothill League meet). 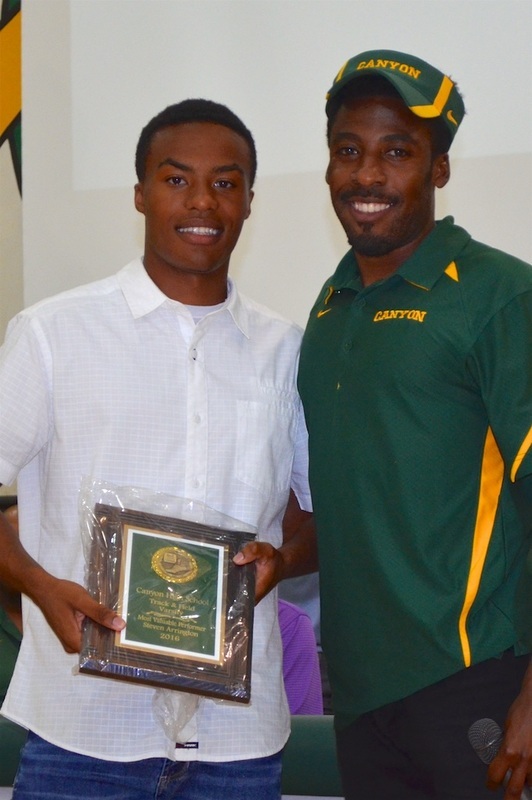 Academic Award (GPA of 3.5 or higher). If you do not come to the banquet, and do not first notify coach, you will not receive any Awards. 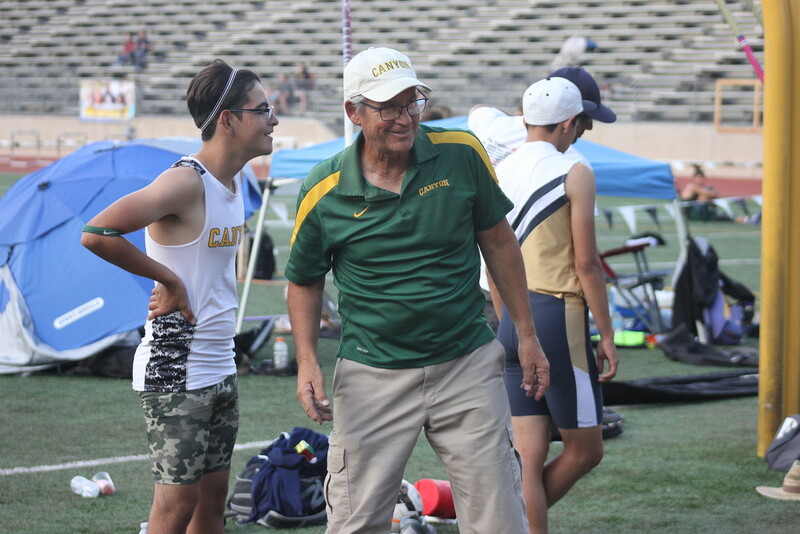 Our 2 time CIF Champion, Ethan Danforth with coach Velarde after winning the 3200 in a PR 9:07.47 last night! 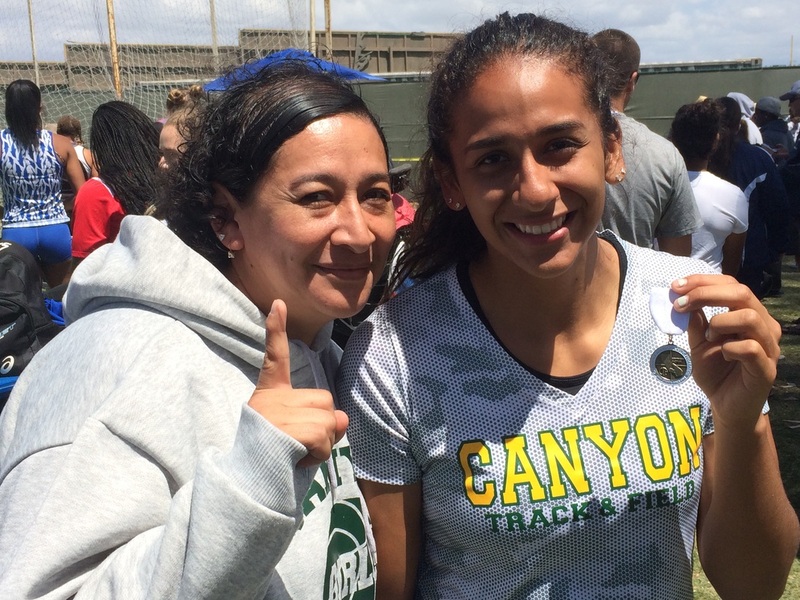 Gabby Sanchez with coach Richardson after placing 2nd in CIF and setting a new school record in the discus at 146-9. Christan Valles attempting a school record 16-0 last night! He placed 2nd at 15-6. Talia, Gabby, Selasi and Rachel The FAB FOUR Seniors will be missed by the Track team and Basketball team. Best of luck at the next level! Gabby Sanchez 1st Discus Throw 144-3 New School Record! Christian Valles 1st (tie) Pole Vault 14-2. Over 500 More PHOTOS of League Finals by Jacob Velarde! and Talia will play basketball for Redlands. 15-8 for Christian Valles in the Pole Vault which is a new Foothill League and School Record! Sophomore, Tyler Cash 6-4, and Senior, Max Wright 6-6 have big PR's in the High Jump, going 1-2. Gabby Sanchez and Jacob Lopez each qualified for CIF. 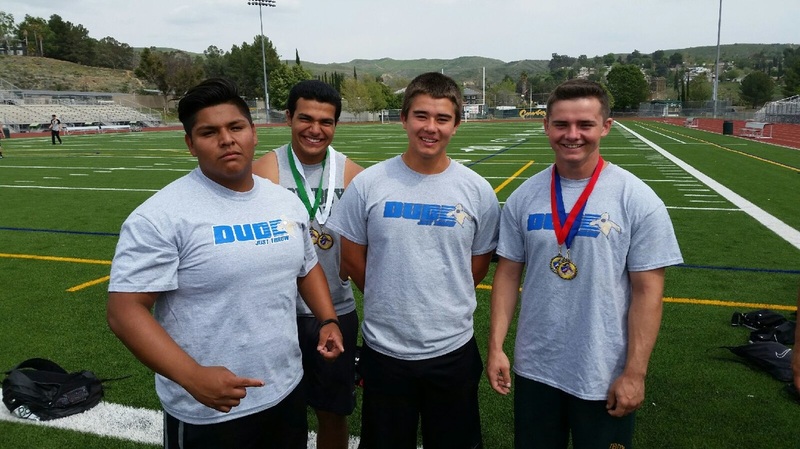 They boys earnd Silver Medals in the Discus, and Jacob also a silver in the Shot. 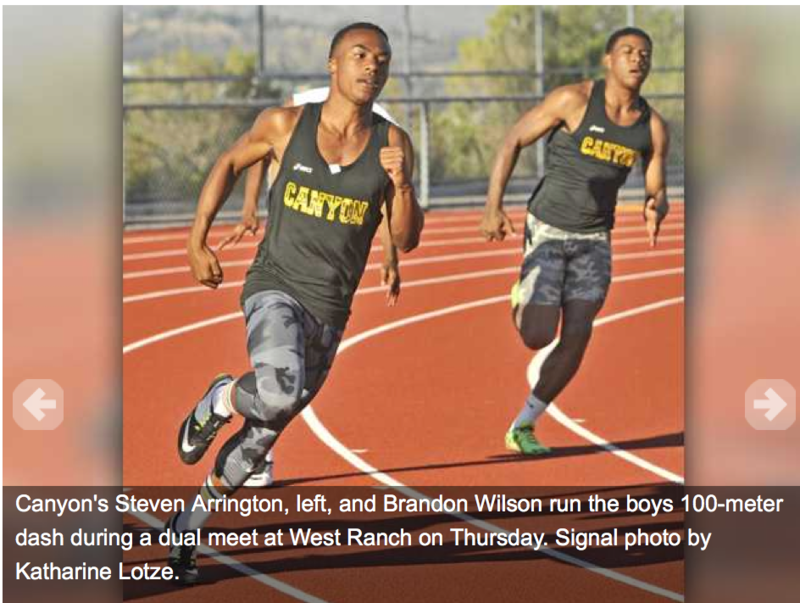 League Finals Meet Program "Draft"
Fri. and Sat. 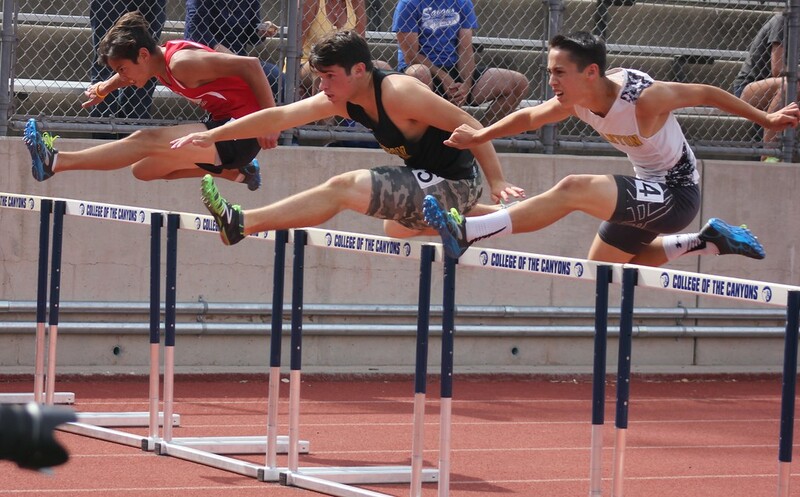 June 1st and 2nd State Championships at Buchanan HS. 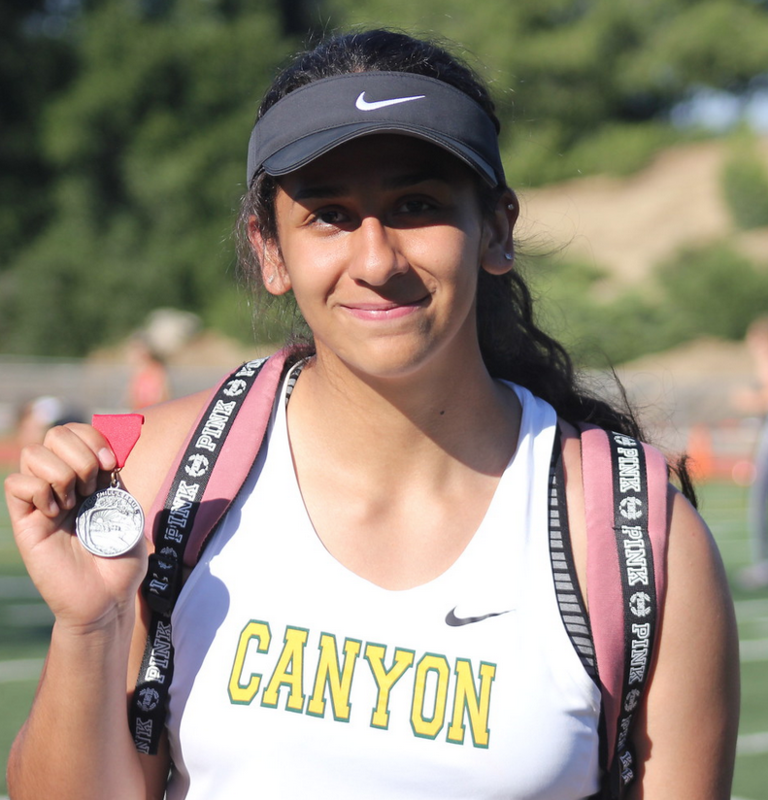 Karicia Gallegos placed 2nd in the Girl JV Discus with at throw of 77-0. Frank Escobar placed 3rd in the Boys FS Discus with a throw of 94-4. Frank also placed 4th in the Shot. 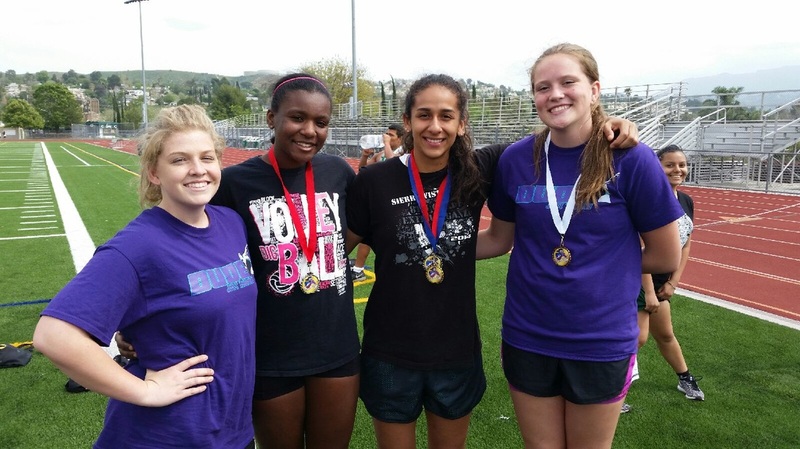 Our Girls JV Throwers today at Saugus. The team van will leave at 12:30 with all of our JV and FS field event athletes. Meet by the track and make sure that your vaulting pole in in the van. Friday is prelims for all FS and JV field events, and all running events except relays and varsity 3200. Tonight at 6:00 pm is a Pot Luck Pasta Night at Patrick's house: 24759 Choke Cherry ln. Please bring pasta, bread and salad. Glad to report that Coach Rock is out of ICU after his surgery and doing well. 2:00 pm and Running Events at 4:00 at C.O.C. Here are the Entries. coach. If there is a "Scr" next to a name, that runner is scratched. few days there will be many changes, so this is not the final list. at 2:00 pm this Thursday. 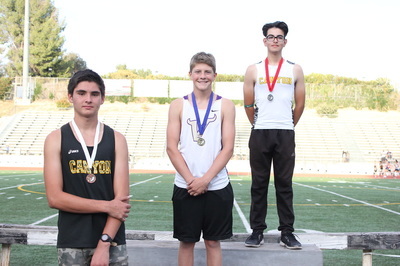 Christian Valles placed 3rd in the Pole Vault with a 15-0 performance. 1600 Ethan Danforth (4:14) for at 10:24.66 for 8th place. Jacob Lopez has a huge PR at Mt SAC Relays in the Shot Put throwing 57-7. He threw 154-3 in the Discus. 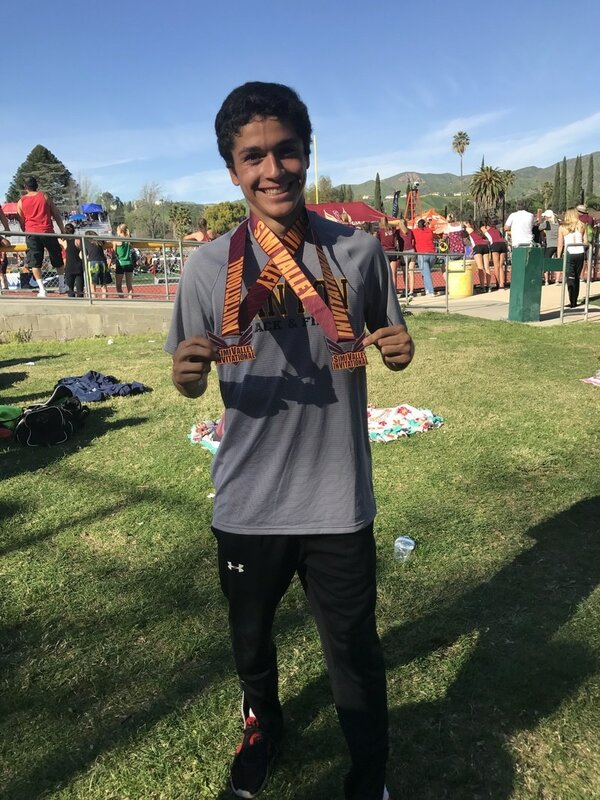 Freddy DeAnda (4:35) ran the 4x1600 Relay last night at the Mt. 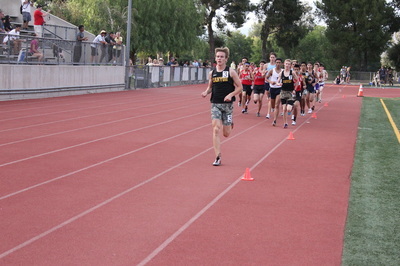 SAC Relays. The total team time was 18:58 which was good for 8th place. next Friday at C.O.C. Only some of these athletes will qualify for the meet. Only the top 3 athletes from each school are guaranteed a spot in the meet. the rest of the field will be based on PRs. I will post the qualifiers Sunday evening. 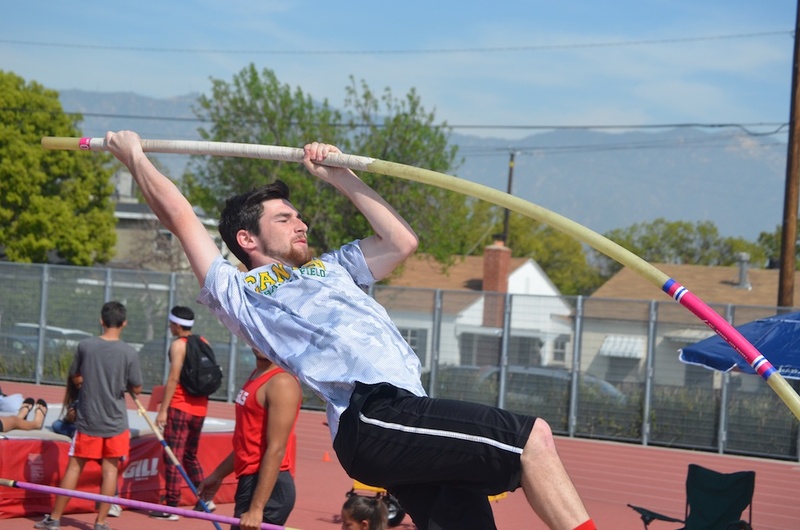 Field Events for all Boys Frosh/Soph and Girls Junior Varsity will begin at 2:00pm. FS/JV will be conducted at Saugus HS on Thursday, April 26th at 2:00pm . 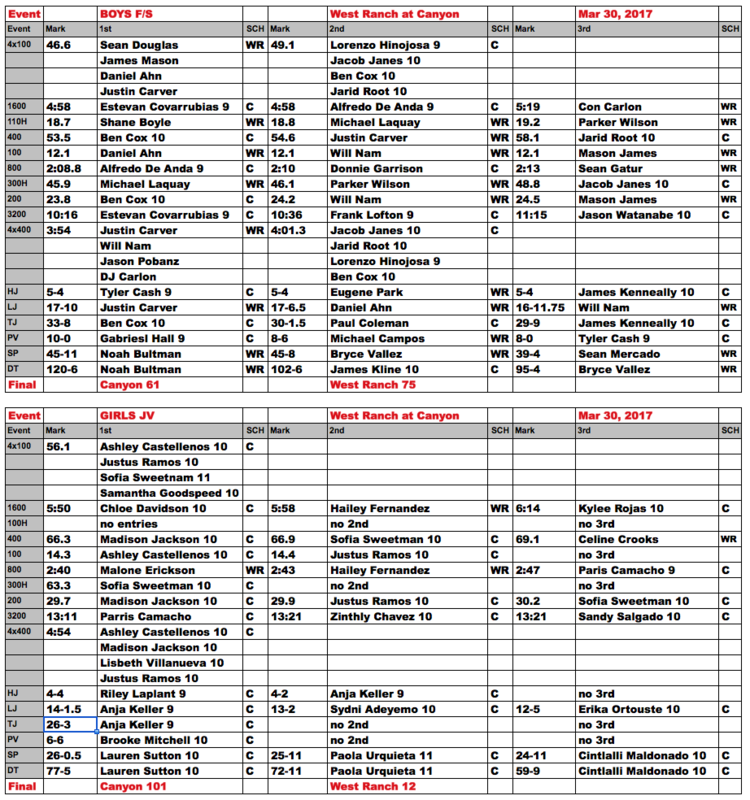 Varsity Shot and Disc will also beat at Saugus on Wed. May 2nd at 2:00pm. Canyon Sweeps Hart! Boys Varsity goes 5-0 in Foothill League and 7-0 overall. Hank Baskett with Tyler Cash, Max Wright, and Micah Adeyemo. at U of New Mexico and played for the Philadelphia Eagles. Wednesday, May 23rd in the gym. our Boys are in first and will face Hart at home on Thursday. This marks our 9th consecutive title. Congratulations Boys! FS Boys are tied for 3rd. New PHOTOS by Jacob Velarde. 15285 Saddleback Rd, Sand Canyon. Turn LEFT onto Condor RidgeTurn, RIGHT onto Saddleback Road. 15285 Saddleback Rd will be on the LEFT side. have some good bonding and team spirit building! Go Cowboys! 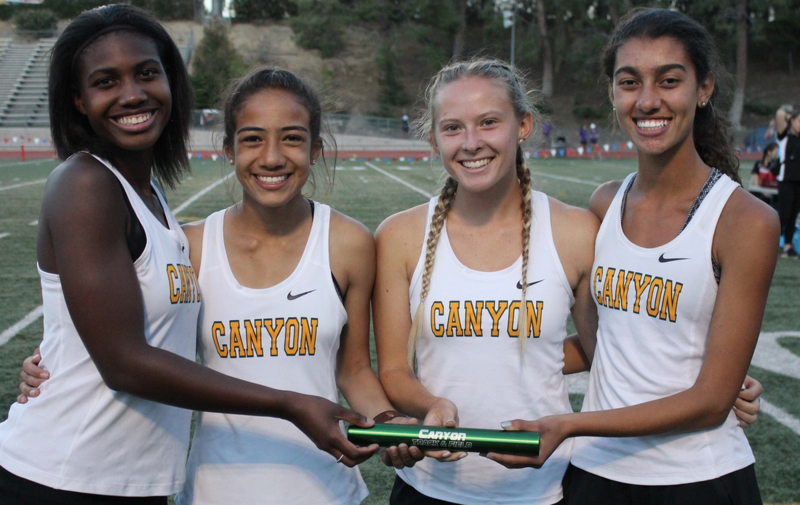 Canyon Track defeated Golden Valley on all 4 divisions Thursday. Jake Ortiz (of Golden Valley) record of 50.3 set in 2014. 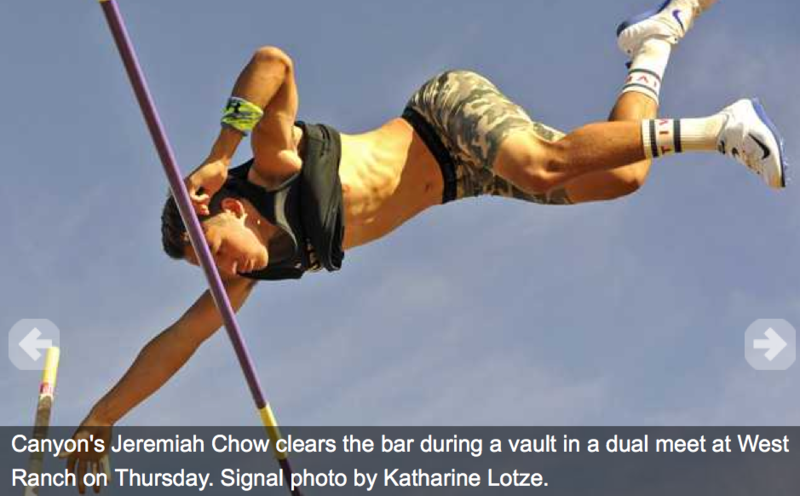 Jeramiah Chow's 14-3 mark set in 2016. Here are our accepted entries for Mt. SAC Fri and Sat. April 20 and 21st. Troy Chairez Inv DMR 400 ??? Here is the complete SCHEDULE of Mt. SAC events. out of the 48 teams in the tournament. and taking 5th place. He was the top athlete from California. 4x1600 15th place 18:10 Patrick King, Frank Lofton, Alfredo DeAnda, and Ethan Danforth. Signal Article 2001 about Eric Johnson. I like his advice in the last sentence of the article! 17 inches - 4 lbs 5 oz. 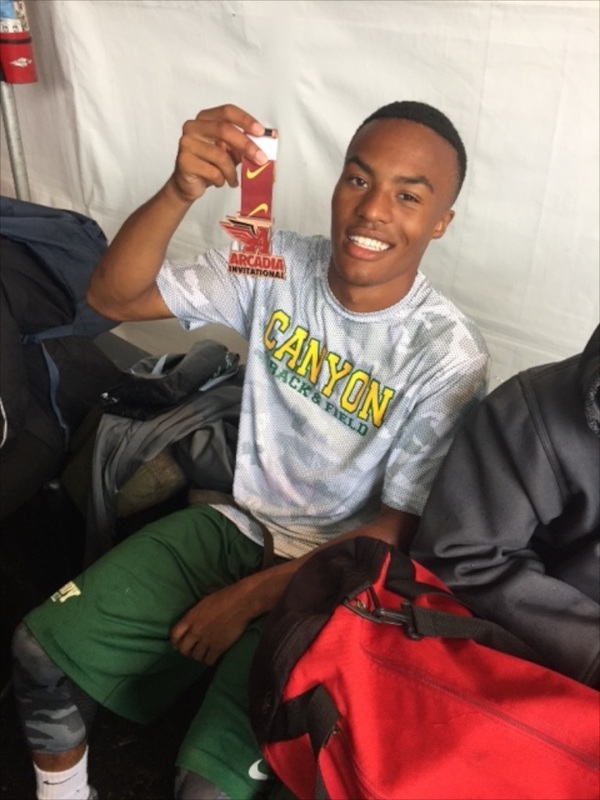 Steven Childs long jumped a PR 25-5 today at UC Davis. 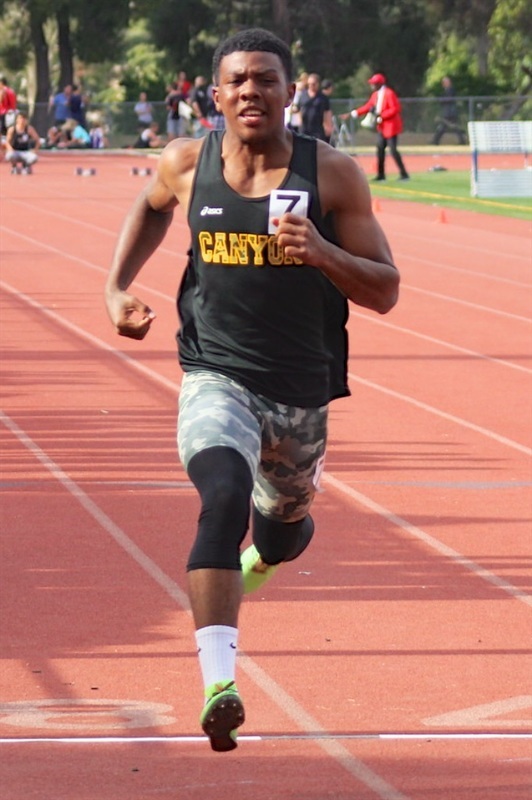 He also ran a PR in the 100 meters at 10.74 Steven named "Athlete of the Week"
place would only give us 68 which would assure us of at least a tie. 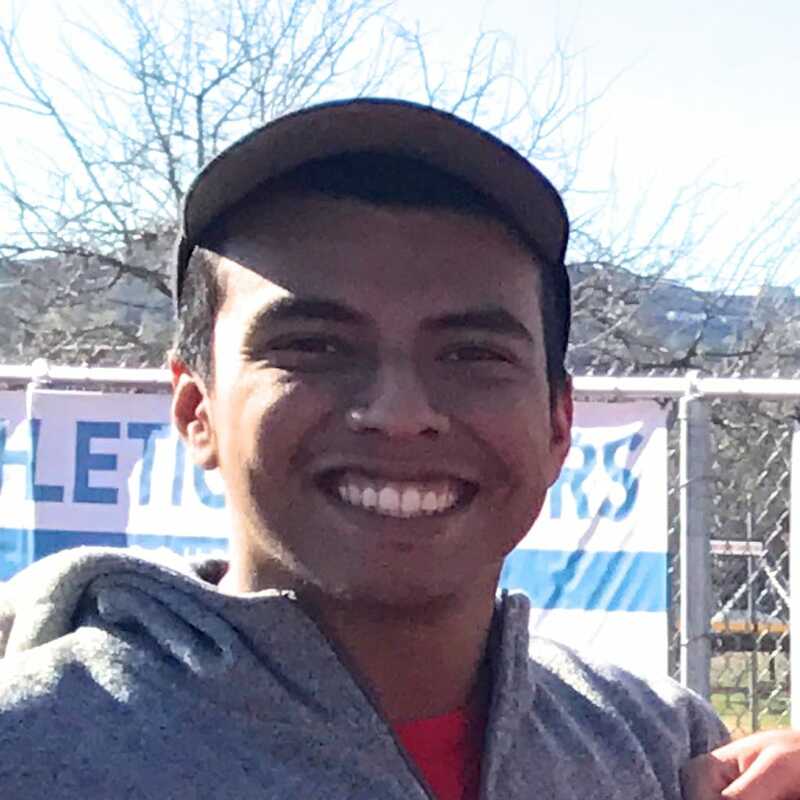 Jun ior, Jacob Lopez, was in the lead with a mark of about 50-6.
delivered a final throw of 53-9.5 to give us the win. Jacob also won the Discus Throw with a season best 155-4. 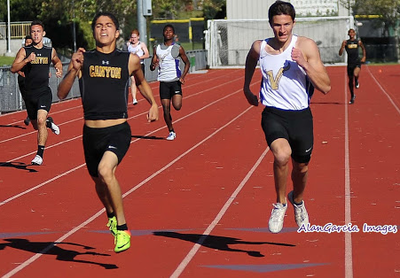 Chairez, also won the 400 at 50.0 with Taylor Tepesano right behind in 51.1. Both season bests. 6-2 and nearly cleared 6-4 for the second week in a row. 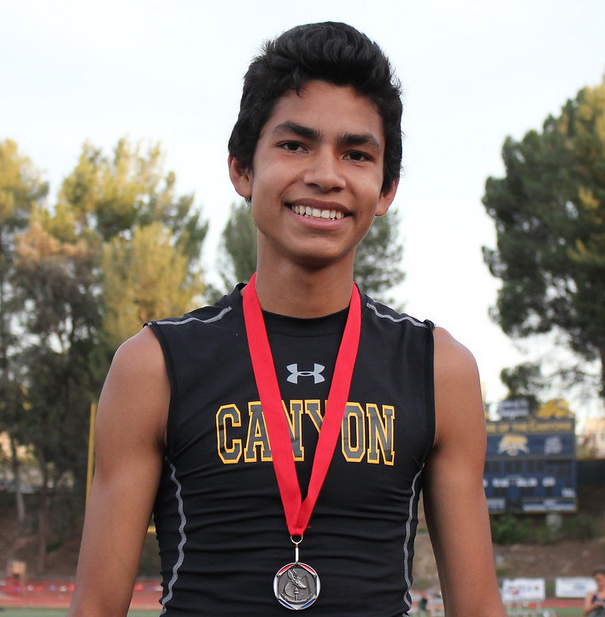 Gerardo Ruiz won the vault at 12-6.
and the High Jump 4-8. 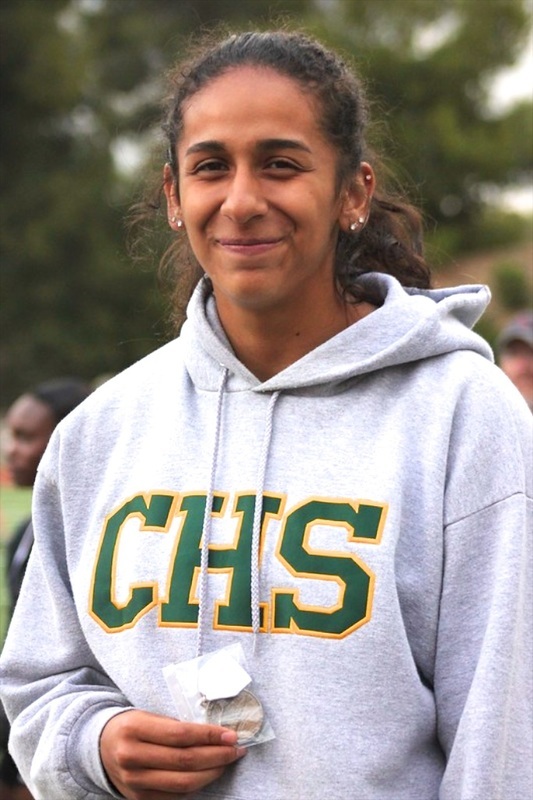 Justus Ramos won the 400 61.0, and Gabby Sanchez won the discus throw at 130-5. 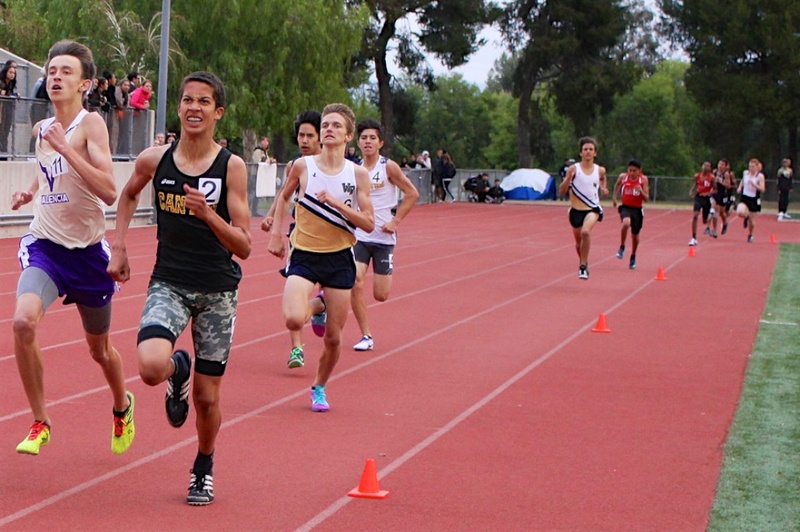 West Ranch Boys beat Hart 86-50.
participate in the prestigious Arcadia Invitational on Aprils 6th and 7th. to improve after a hamstring injury and wins the 200 22.82 and 400 52.58. 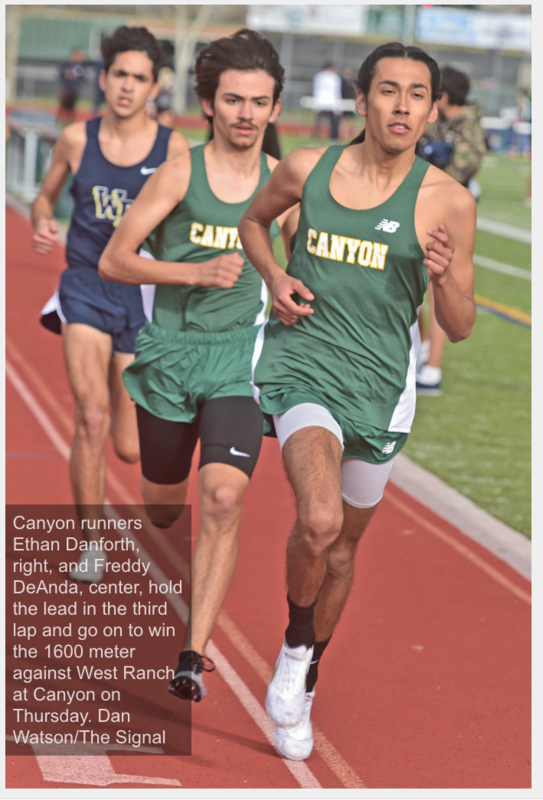 Ethan Danforth ran the fastest 3200 since 2003 and now ranks #6 All Time! News Flash!!! The West Ranch Meet has be cancelled due to the forecast of heavy rain this Thursday. Below are our entries into the Arcadia Invitational, which will be on Friday and Saturday April 6th and 7th. on April 5th - 9th. We wish him good luck and pray for no injuries! 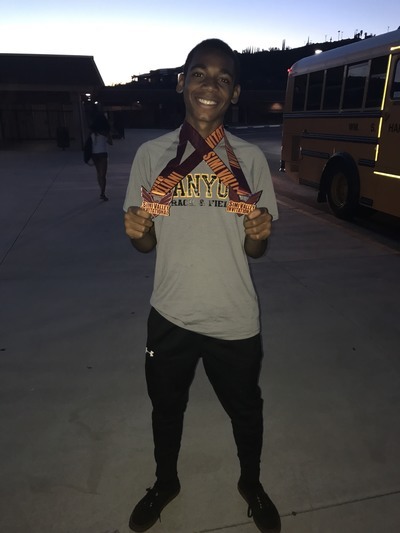 13-0, and 3rd in the long jump and triple jump. LJ 15-3.5, and TJ 32-10.75. 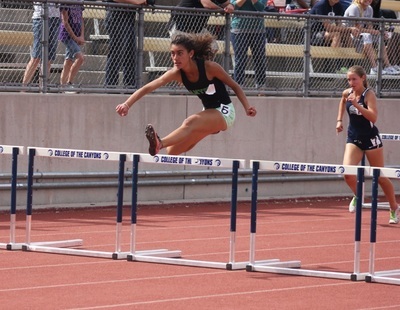 She also had a PR in the 100 Hurdles or 18.51 for 3rd place. and print. 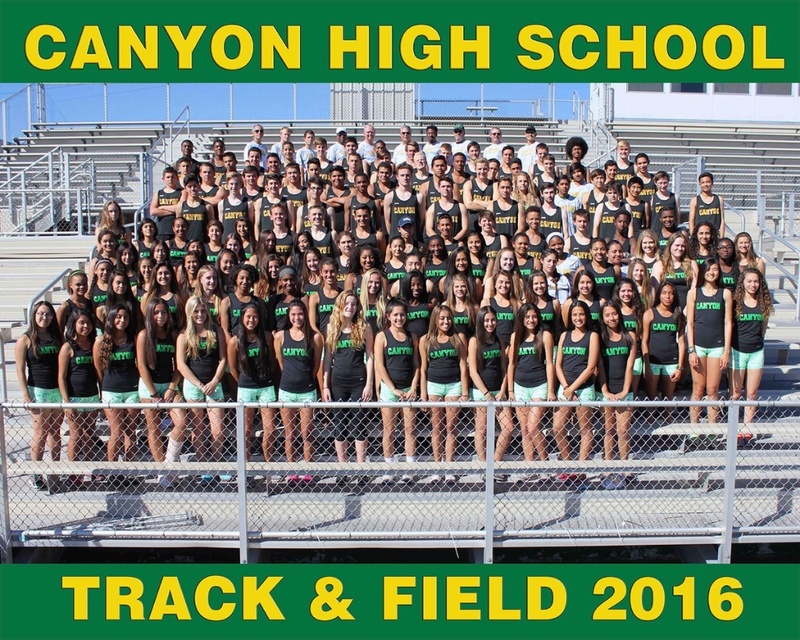 I will also take orders to print the team photo with "2018 Canyon Track"
on the bottom. Large and small and charge what COSTCO charges me. bring CASH in an envelope with your son or daughters NAME on the envelope. 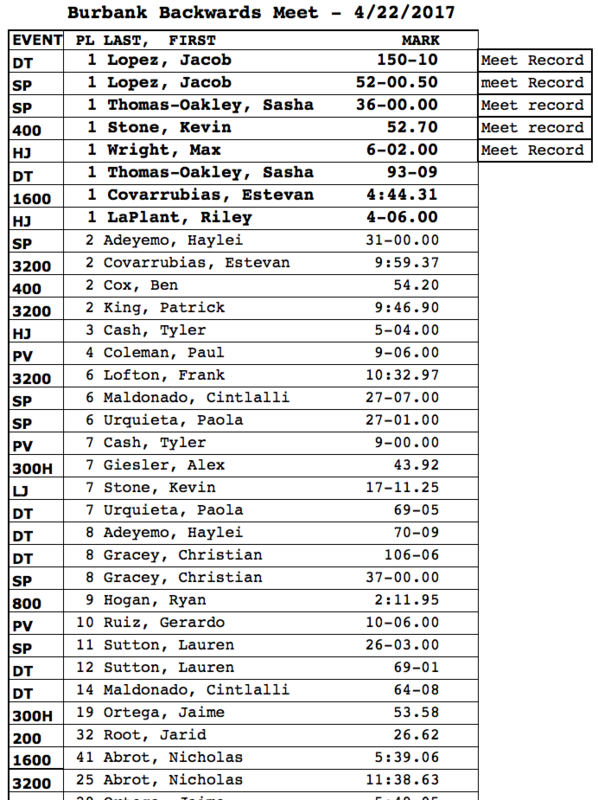 Below are the meet records and history of this rivalry! Jacob Lopez 54-5 SP and 152-0 DT at Redondo! 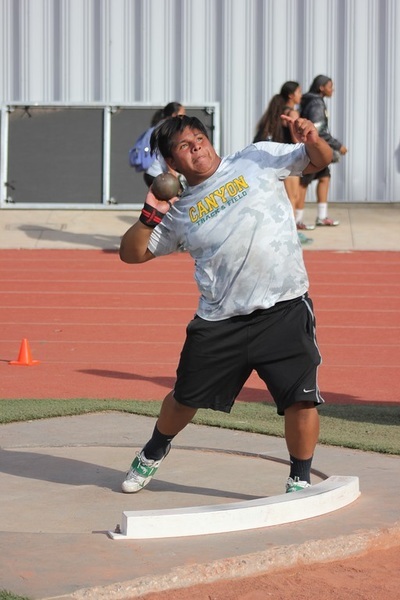 in the discus at the Nike Redondo Track Festival! Jacob Velarde signs his letter of Intent to attend Master's College! Today at practice we will hand out medals to our Trevor Habberstad Invite winners. 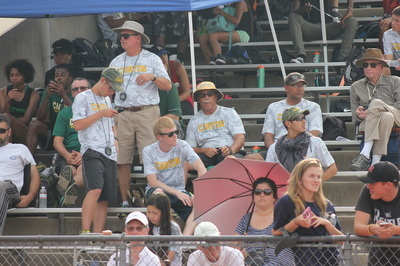 And hand out meet t-shirts to athletes to give to their parents who volunteered at the meet. 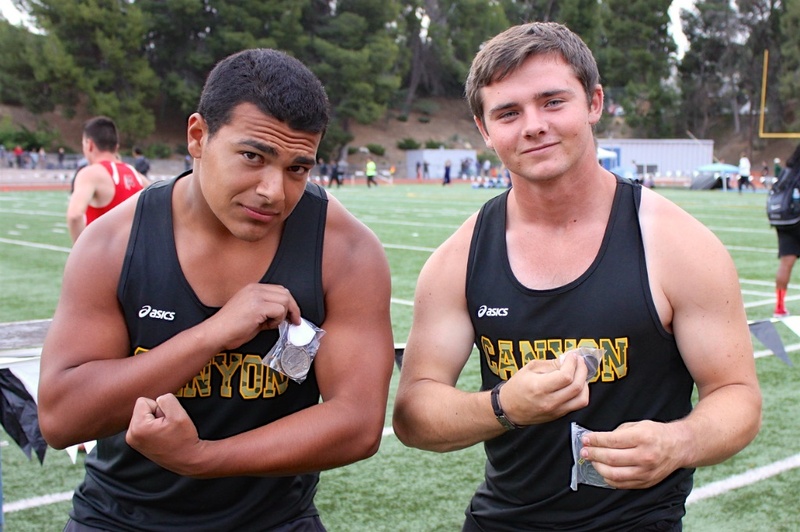 Our throwers will not be going to Redondo this Friday. at 6:00 am and return about 7:00 pm. 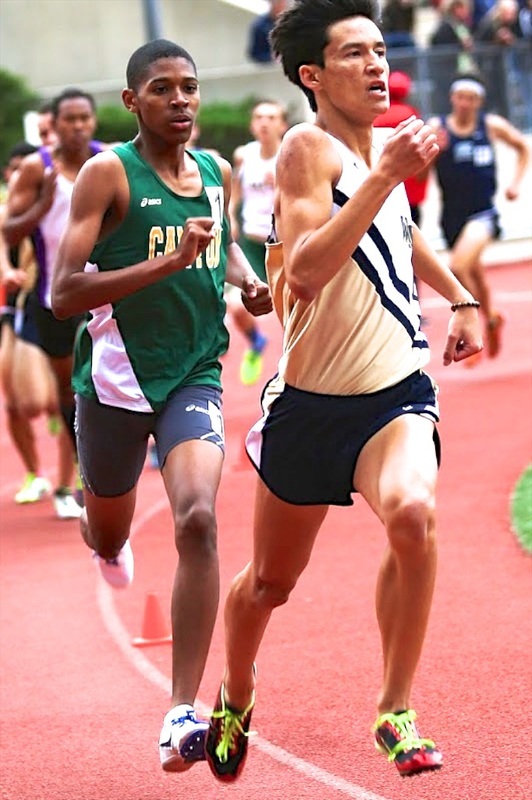 Distance runners will hold a mandatory Saturday Workout. attending. We will be at Valencia on Thursday, March 15 to open league competition. Debbie and Jeff Habberstad joined us at their son's Invitational! 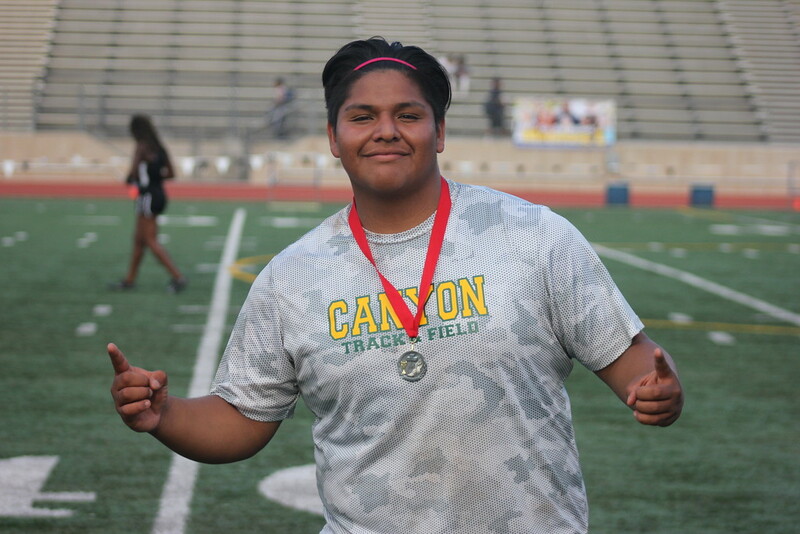 Jacob Lopez won the Shot Put 51’2” and Discus Throw 147’11” which is a new Meet Record! Max Wright won the High Jump 6' 2" and placed 2nd in the Long Jump 18-1. 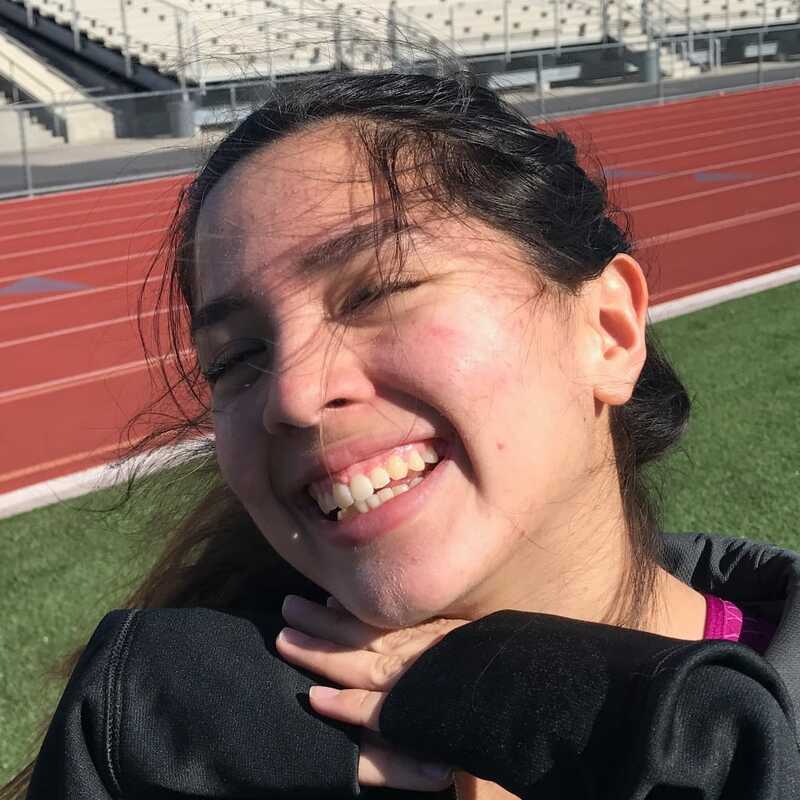 Gabriela Sanchez won the Shot Put 32-9 and Discus Throw 109-0. 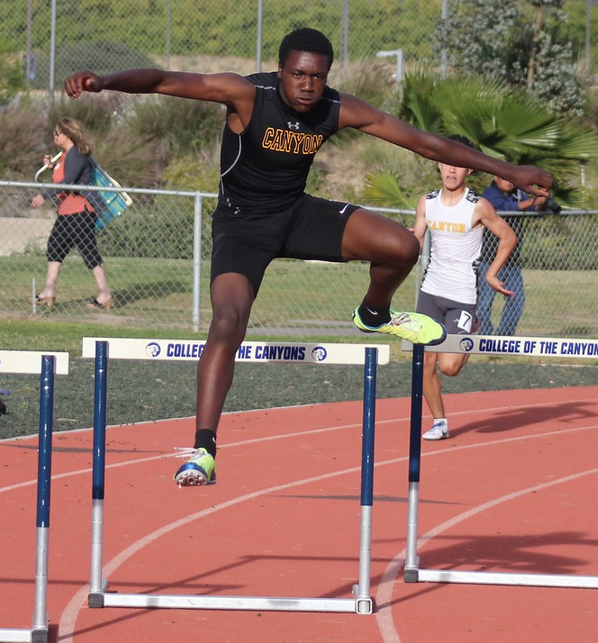 Selasi Mawugbe won the HJ 4-8, LJ 14-7 and TJ 31-6.
hurdlers and field events. Spend extra time warming up to prevent muscle pulls. 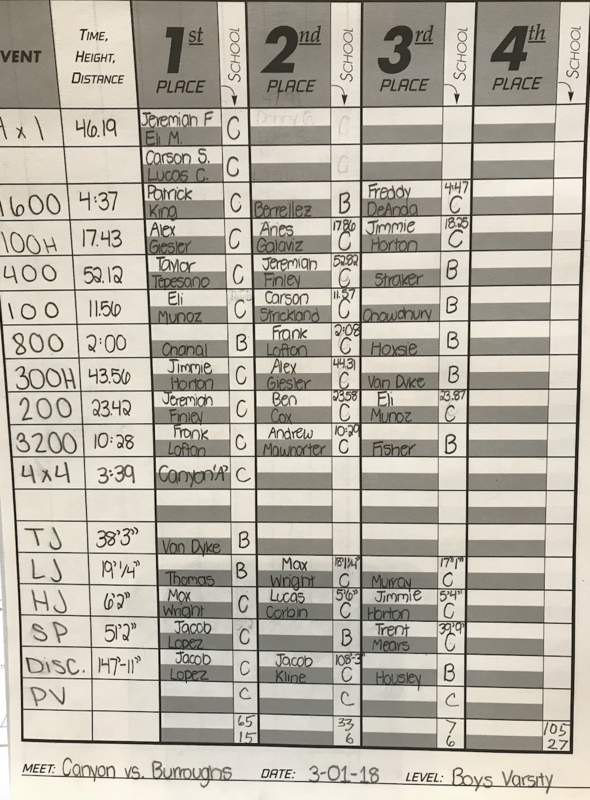 Our meet entries are below. we need to improve to prepare for league competition. Varsity Boys won 78-56 without our top two sprinters, Troy Chairez and Taylor Tepesano (out with hamstring injuries). Varsity Girls lost 50-84 without our athletes from Girls Basketball and Soccer (both is CIF Playoffs). Saturday's, Mar. 3rd, Trevor Habberstad Invitational at Canyon. Amber Kashay, Selasi Mawugbe, and Gabriela Sanchez. Green Boys won 242-161, the Girls competition was VERY close! Green Girls 166 Gold Girls 165. Total Points Green beat Gold 408-326! Save the Date: Thurs. Feb 22nd, 6:00 PM is our Parent Meeting / Meet the coaches night. Field Events will begin at 8:30. This is a MANDATORY "Practice" meet, so "ineligible" athletes must also participate. 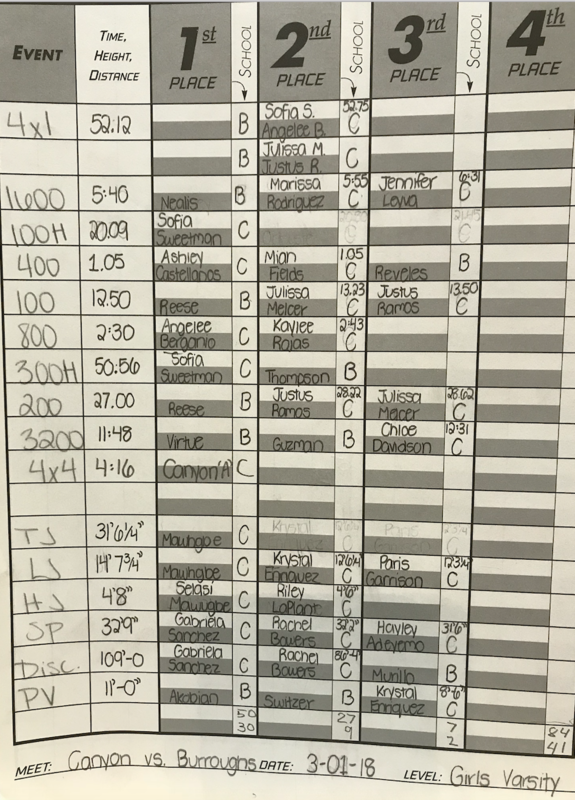 Below are tentative entries for Distance, Field Events and Hurdles. 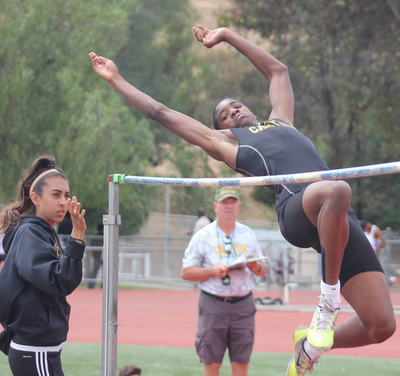 at this time we have NO girl High Jumpers, or Triple Jumpers!!! Here are the results of our pre-season Heptathlon. and will earn a Decathlon T-Shirt. very impressive early season marks. is a few All Comer Meets. 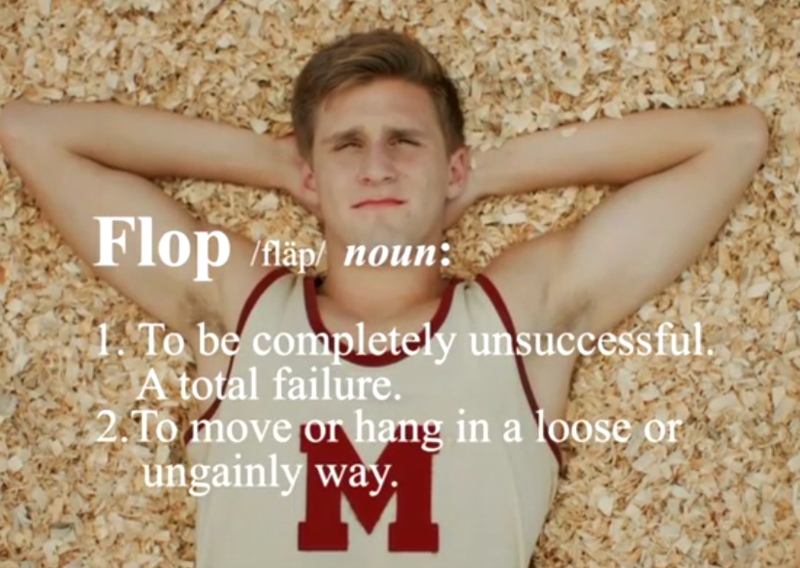 However, these meets are optional and athletes will compete "unattached." Most of these Soccer Alumni also ran TRACK. Can you name them? 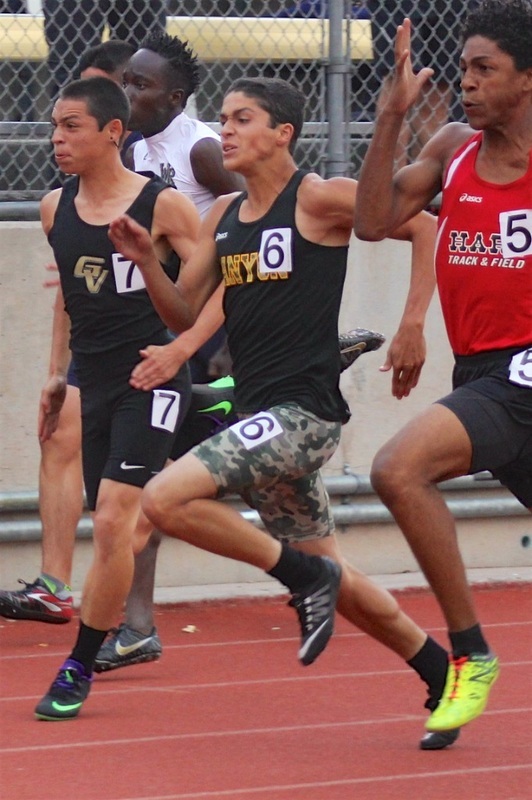 Alumni Update: Chris Low (2010 grad) 800m PR of 1:46.40. Gabby Sanchez posing with Coach Kent Richardson after her new school record 139-9 qualifying her for the State Meet Finals tomorrow evening in Clovis. Good Luck Friday! 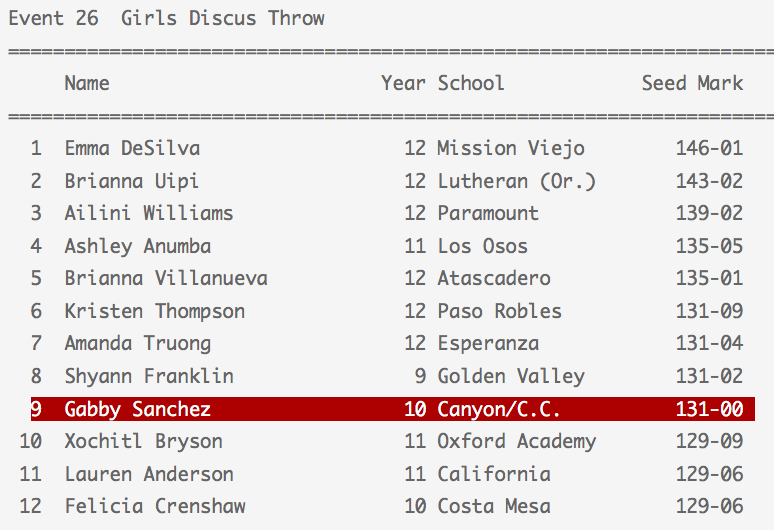 Gabby is ranked 11th. 12 make the final on Saturday! Memorial Day Holiday no school! Tue May 30 Minimum Day Finals - No Track Study for finals Clean Out your Locker! Wed May 31 Minimum Day Finals - No Track Study for finals Clean out you locker if you haven't all ready. Thur June 1 Minimum Day Finals Track Final 10:30 Last Day of School. Your lock was just cut off and your stuff has been given away. Signal Article - pre-Masters scoop. 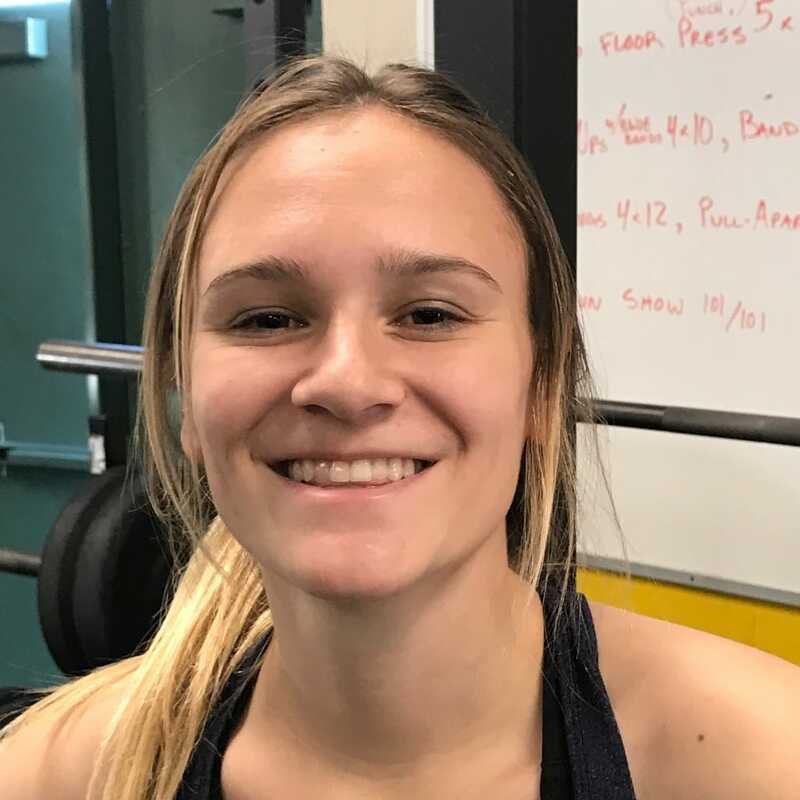 9 Gabby Sanchez 11 Canyon/C.C. I'm very proud to say that I coached them all. Our Banquet will be Monday, May 15th, at 7:00 pm in the Gym. 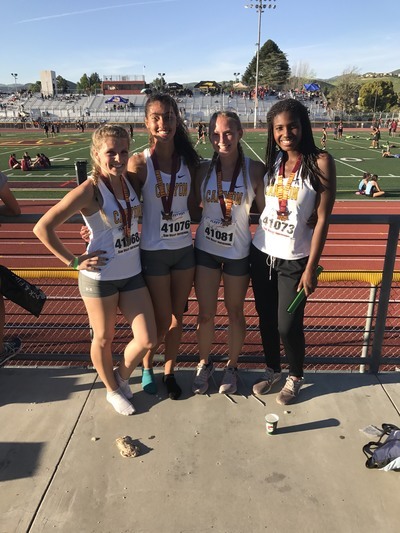 It's time to register for Summer XC and Track! Mon. May 15 Awards Banquet Main Gym 7:00 pm - dessert only FREE! Alumni Update: May 2, 2017: Congratulations to Canyon Sprinter, Drew Wolitarski, Canyon class of 2013 for this next step to the NFL. 105-5 for COC last Friday in Bakersfield. 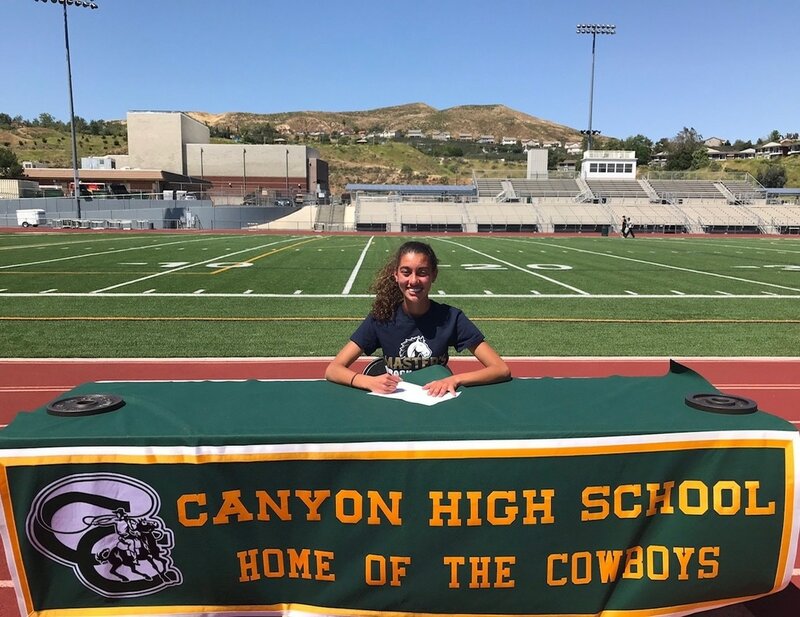 Seanna Nalbandyan signs her "Letter of Intent" to attend The Masters' University. Great day to be a Cowboy at the Burbank Backwards meet. 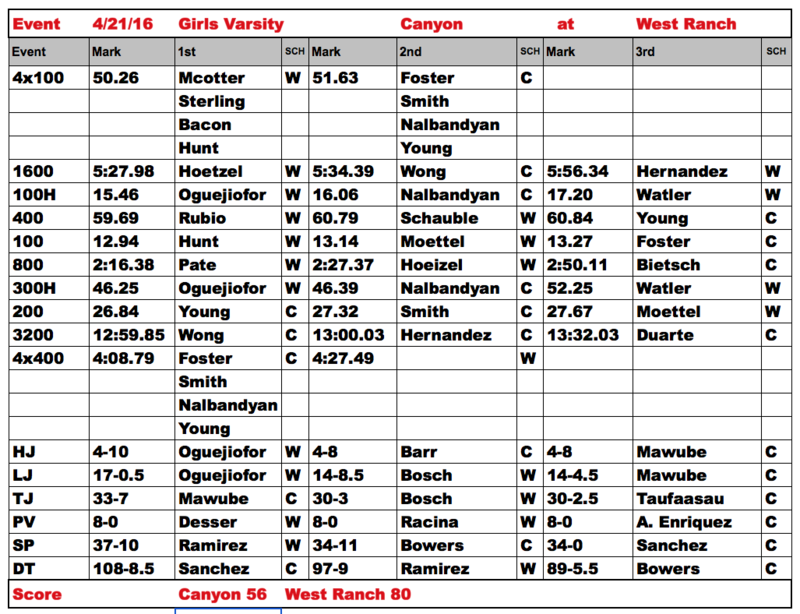 We had 8 event winners, and 5 of these were Meet Records! 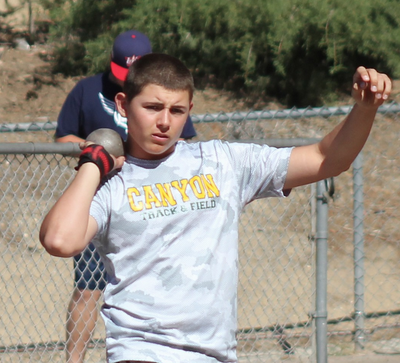 Jacob Lopez set 2 of the MRs in the throws. on our "All Time Top Ten" List. 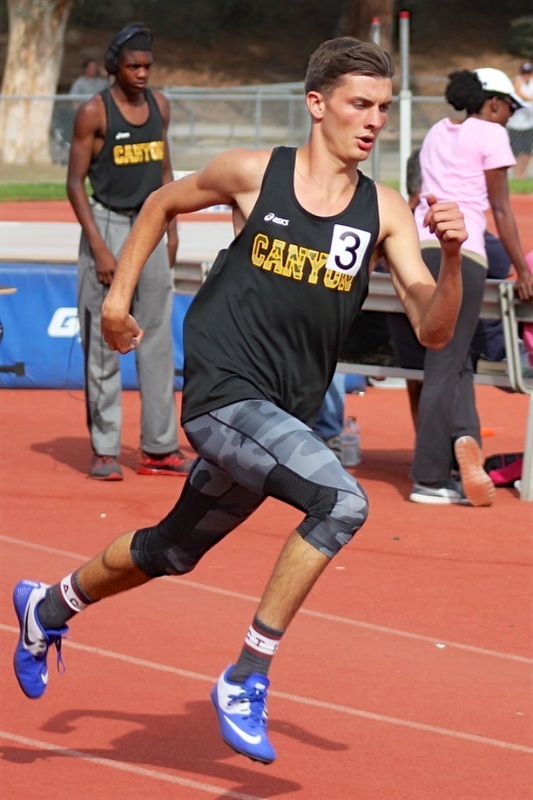 Kevin Stone ran a PR 52.7 in the 400 to set a meet record. Max high jumped 6-2 to set the 5th meet record. Congrats to John Elam who threw the discus 149-8 for 7th place at Mt. SAC in the Seeded division. for a wire to wire win! 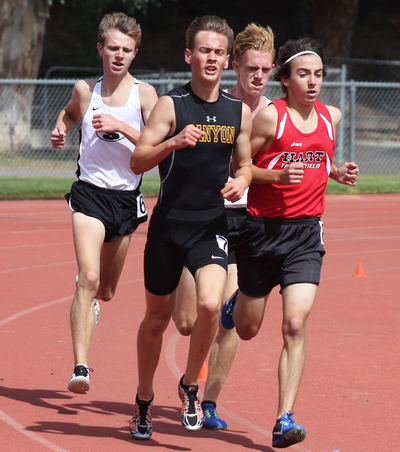 Zach Wims ran the 5,000 in 14:30.
during our week long "break"! the Museum of Tolerance Field Trip must take the EARLY bus!! !, or you will be late to the meet). 200 Steven Arrington 5th Place in 22.10. 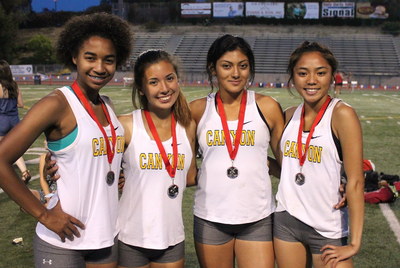 4x4 R Keashon Foster, Angelee Berganio, Brittney Young, and Seanna Nalbandyan. 2nd Place in 4:01.11. 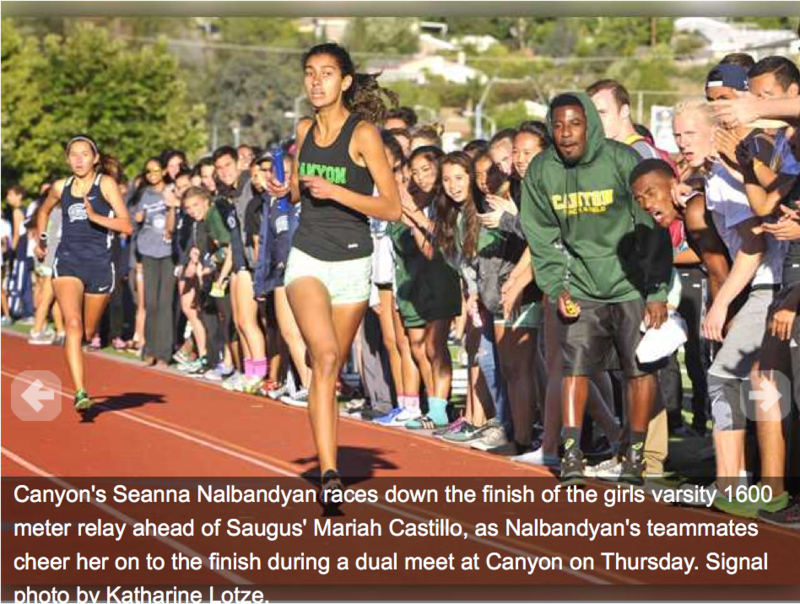 Seanna's anchor leg was timed in 57.7. 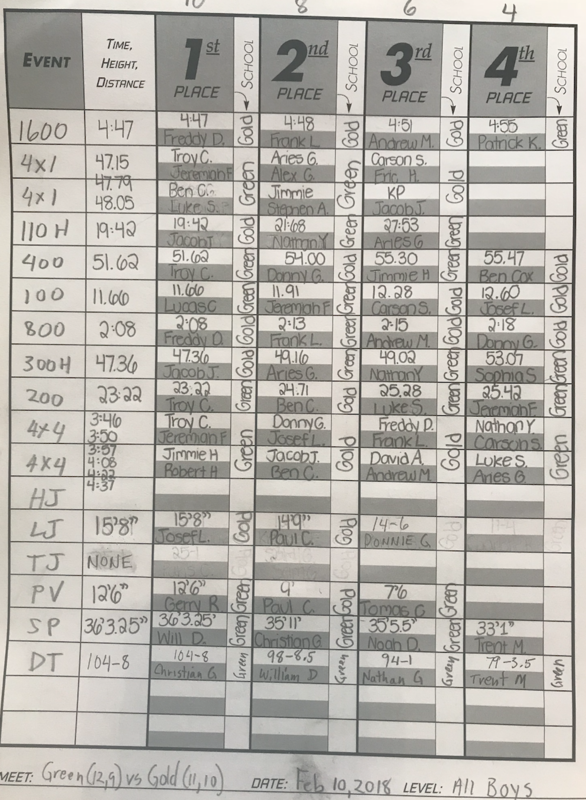 The old school record was set in 2000 by Daunte Davis, Landen Llamas, Sean Ballek and Max Bellissimo at 1:30.19.
and 7th place in the Discus Throw with a throw of 155-5. 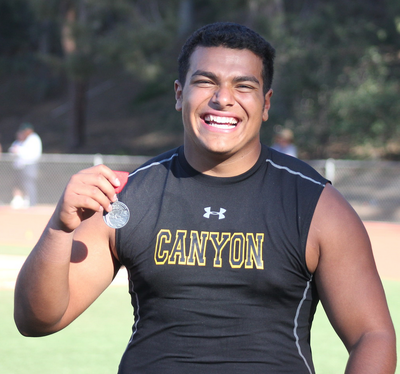 Jacob Lopez 52-6 was the top throw by a sophomore at Arcadia! Shalyn Mabritto ran a 12:6 Steeplechase and a 20:45 5k at the Glendale College Invite for COC. Dana Bowers won the shot put with at throw of 40-0.5 (ranked 3rd in State) and the Javelin. She also high jumped 4-9. Stephanie Martinez evidently quit the team. 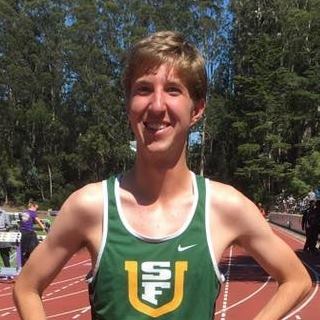 USF's Caleb Mc Clain PR'd in the 10,000 meter run with at 31:03.73. This ranks #8 on the University of San Francisco's All Time List. 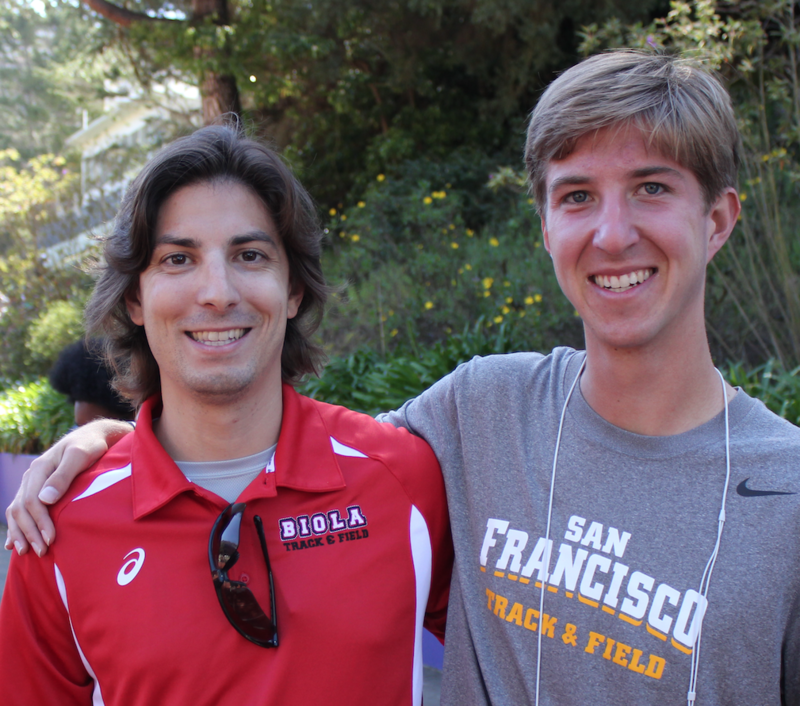 He is pictured with Anthony Pizzo, now a coach at Biola University. 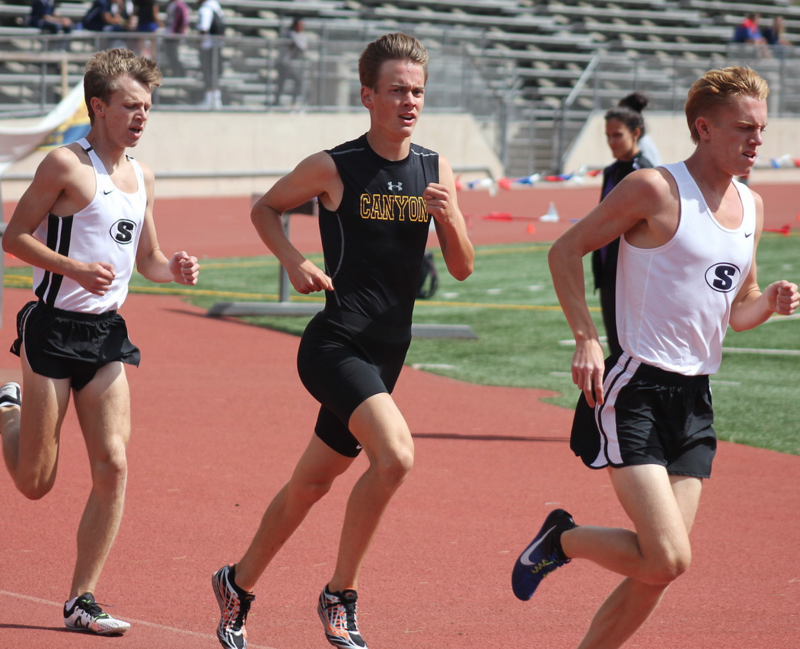 Zac Wims ran the 5,000 meters in 14:42 for Cal Poly SLO and placed 4th. A dominating day yesterday vs West Ranch by our boys varsity winning 93-43. 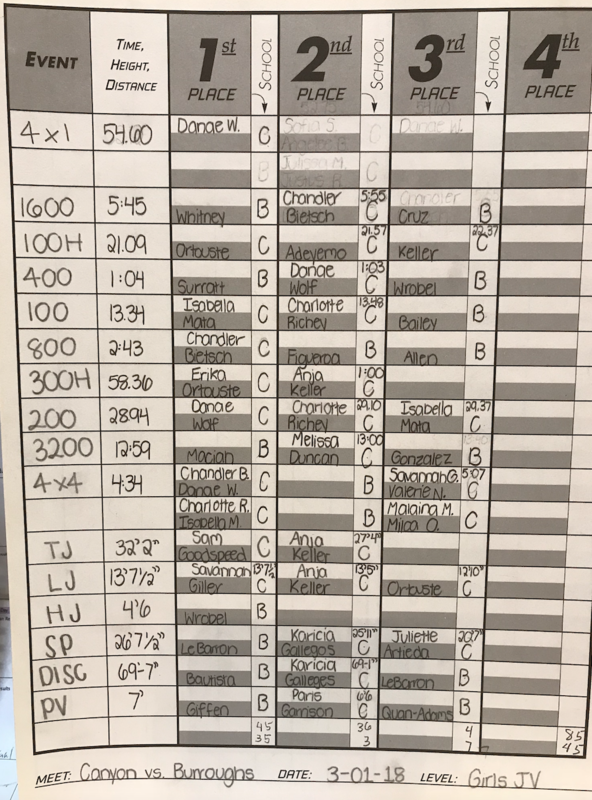 Our field event team outscored WR 42-9, our sprinters out scored them 28-3. That's 70 points to 12. So, to those who were heard to say that WR lost because they "rested their distance team" are clearly mistaken. The scores. John Elam, Jacob Lopez, and Phillip Carillo. 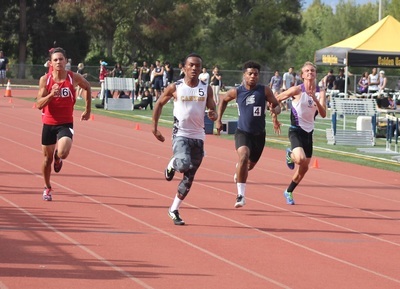 29-8 by our sprinters: Steven Arrington, Troy Chairez, Taylor Tepesano, and Micah Adayemo. 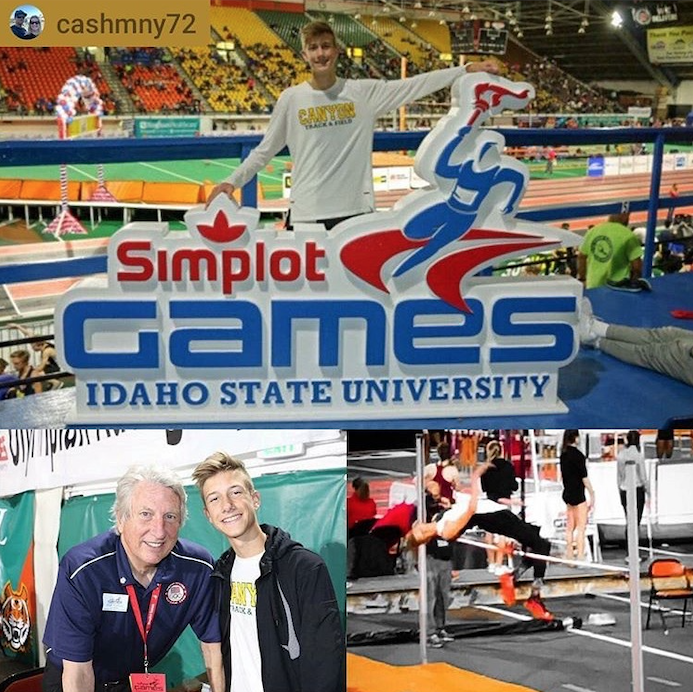 10 points by our jumpers and vaulters: Max Wright, Lucas Corbin, and Camden Apsay. 8 pts from our distance team: Patrick King, Ethan Danforth, and Kevin Stone. scoring four critical points to clinch the meet. 4. Troy Chairez beating Sam Pica in the 400 with a meet record 48.9. 5. Steven winning the 100 defeating Valencia's Tanner Berney. 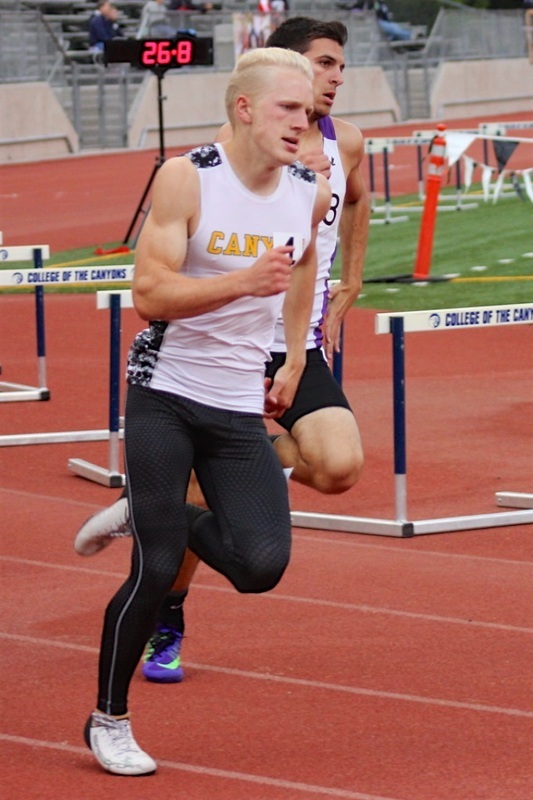 Wednesday, March 29th at 7:45 am The Boys will take the the California State Fitness Test in the Gym. The test will be given by our PE Teachers and is REQUIRED! Please come dressed in athletic attire and be on time. 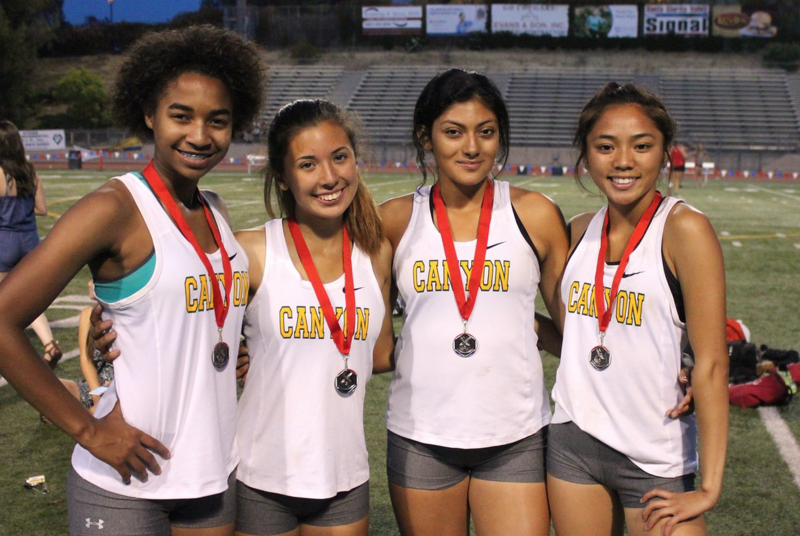 A good start to our Foothill League season. Lots of PRs and 4 wins yesterday! Our girls beat Hart for the 10 year in a row and our boys won their 9th straight. 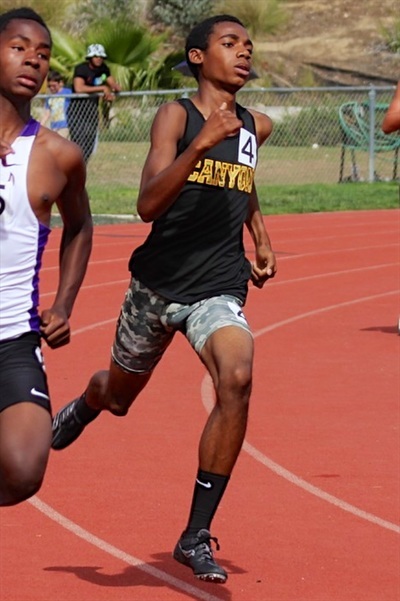 Steven Arrington tied 2 meet records 10.5 100m and 21.8 200m. Keashon Foster tied the MR in the 100 with at PR 12.2. John Elam broke a 10 year old record in the Discus Throw with a big PR of 169-3. A few of these records could fall this Thursday. 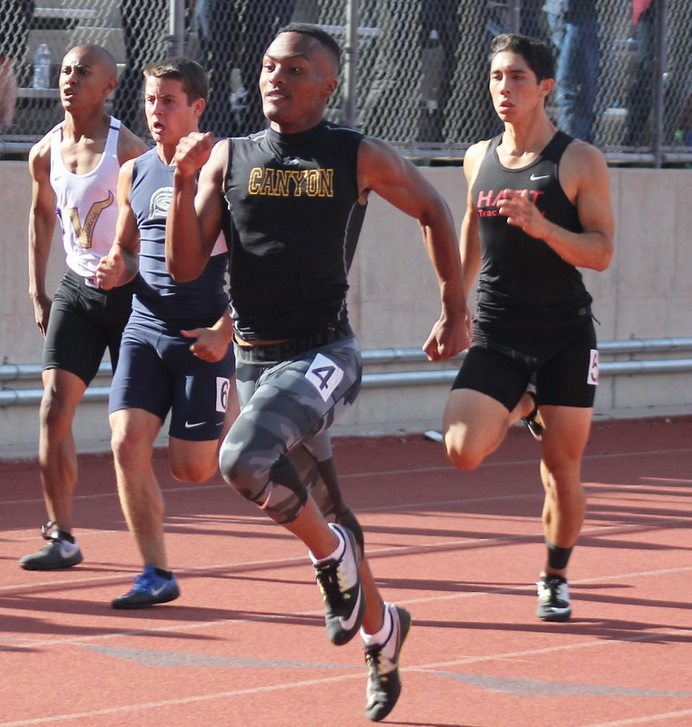 Steven Arrington ran the 200 in 21.96 Saturday, Sophomore, Jacob Lopez threw the Shot 53-0.75 at the Redondo Invite Friday Night. Seanna Nalbandyan ran a 46.32 in the 300 hurdles. Alumni Update: Steven Childs opened the season (Sat. 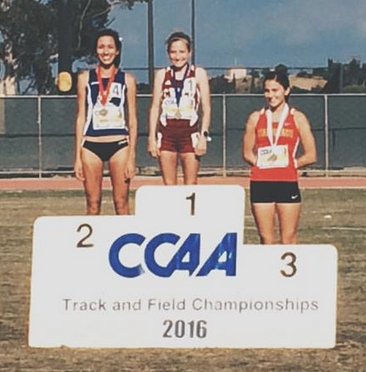 3/4) with a PR 23-2 in the long jump for UC Davis. (Say. 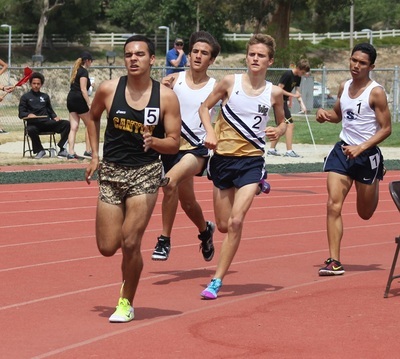 3/11) Caleb McLain won his first collegiate race by winning the 1500M in 4:05.03 at the UC Davis Aggie Open. 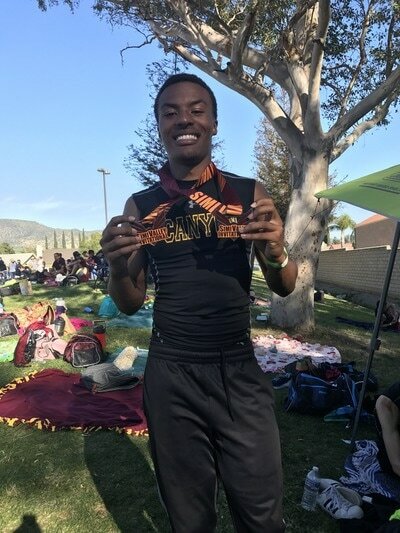 Steven Childs was also at the meet and ran the first leg of the winning 4X100 relay team in 41.68, he won the Long Jump with a new PR 23-08.75, and finished 2nd in the 100M in 11.13. Caleb McLain wins the 1500 in a meet between USF and UC Davis. 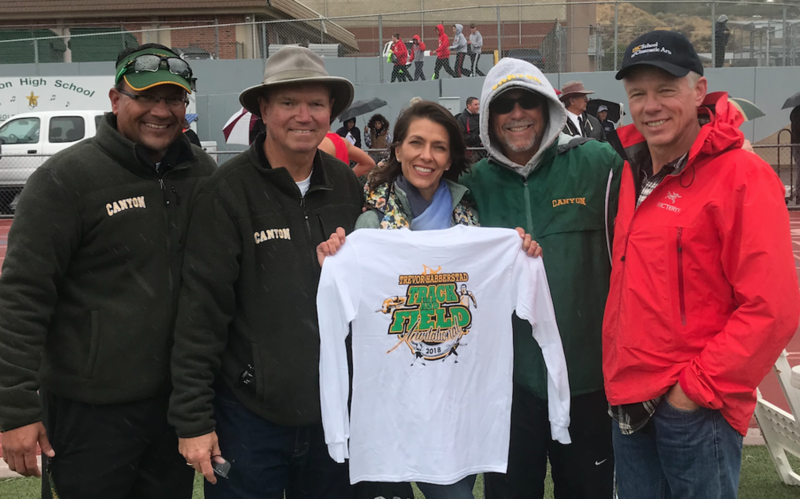 Debbie and Jeff Habberstad joined (Coach DeLong and Broneer) to honor their son, Trevor at his meet today. sophomore Jacob Lopez set a new meet record in the Discus Throw. 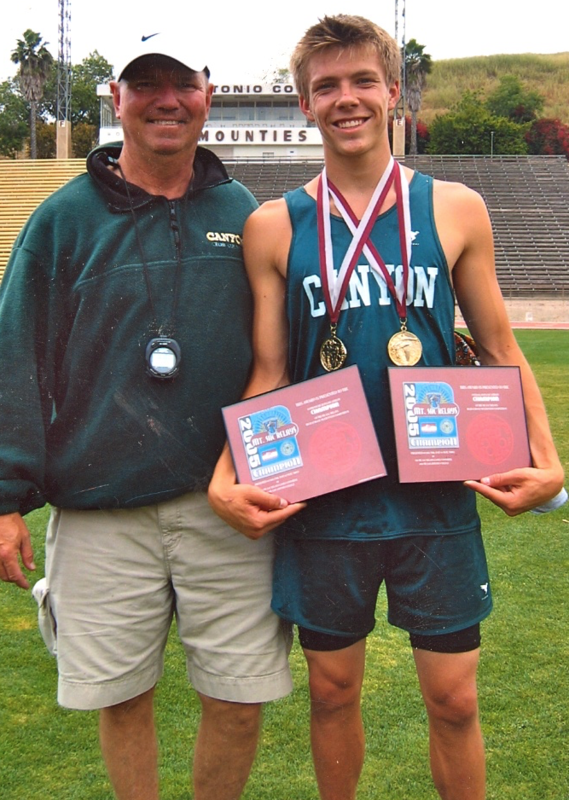 We are sad to learn that Trevor Habberstad, class of 2007, and our school record holder in both hurdles, lost his battle with cancer yesterday. He was 27. RIP! 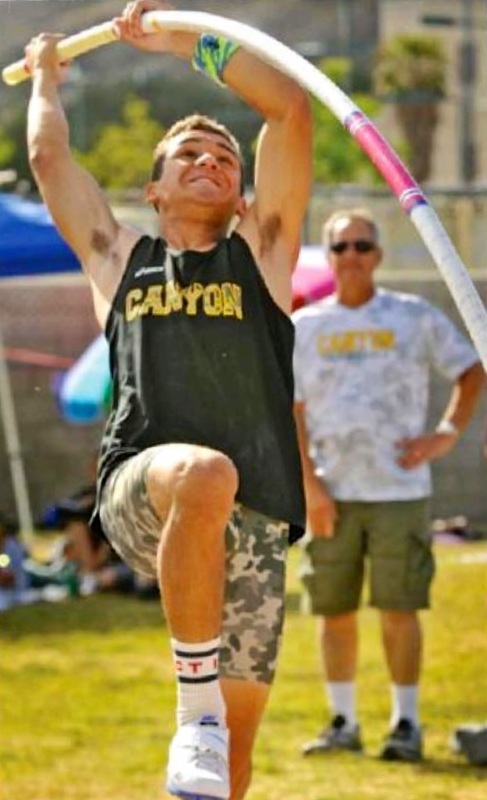 Trevor was a successful actor and stunt man and he supported our SCV Invitational financially for the past several years. Here is Trevor's IMDb page. Our thoughts and prayers are with his family. KHTS News Story. Albuquerque for the meet on March 3-5. He will be entered in 600m. and ran with our distance runners. 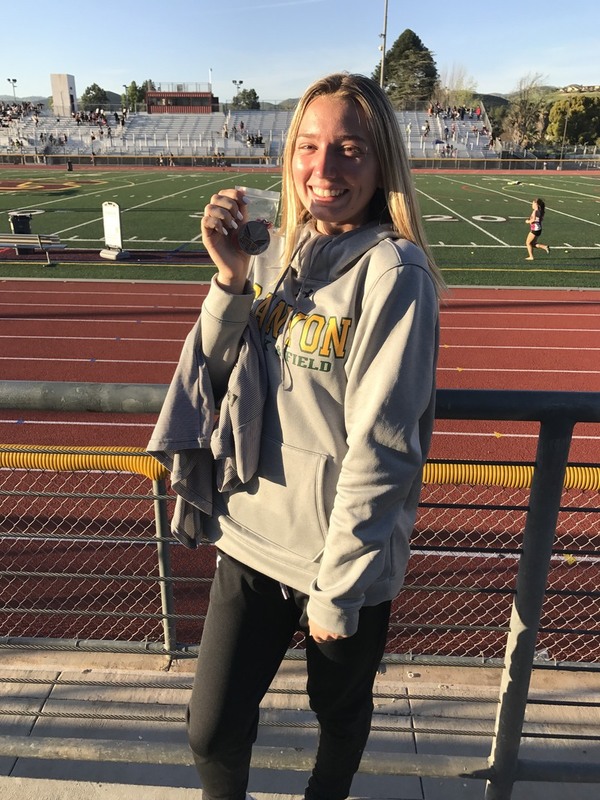 As a Senior, at CIF Finals, she won the 800, 1600, AND 3200! She was also the State Champion in Cross Country. professional racing. She is now a board member on the USATF and is on a personal mission to help rid our sport of doping. I counted 20 alumni at this morning's workout (not counting Coach Johnson). It was good to see all of you and catching up on your latest news. Congratulations to Johnny Scarpitta '02 who informed me that he was getting married TOMORROW!!! 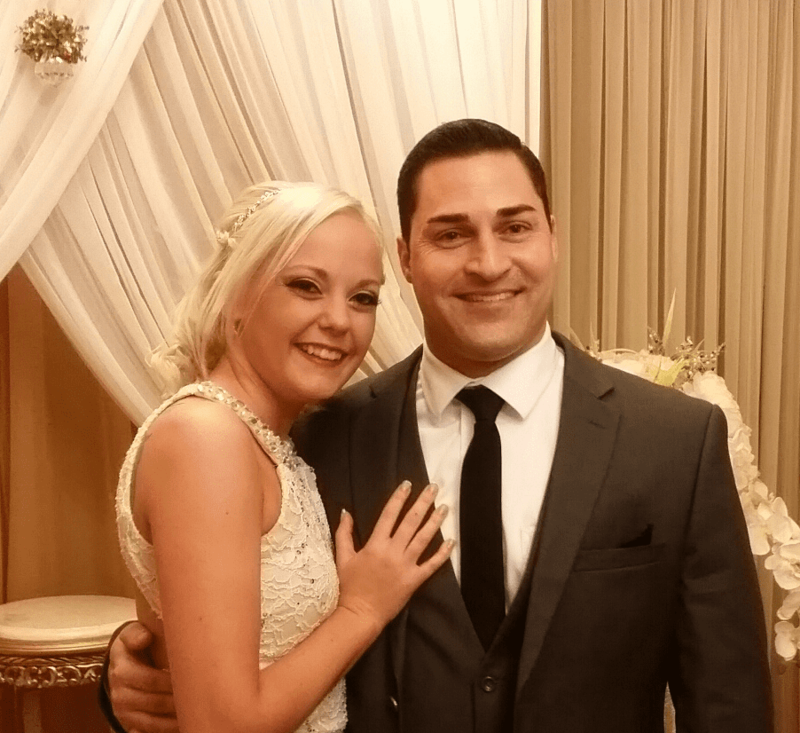 Congratulations to Hunter Awsum (formerly Johnny Scarpitta - class of 2002), on his wedding Wednesday. 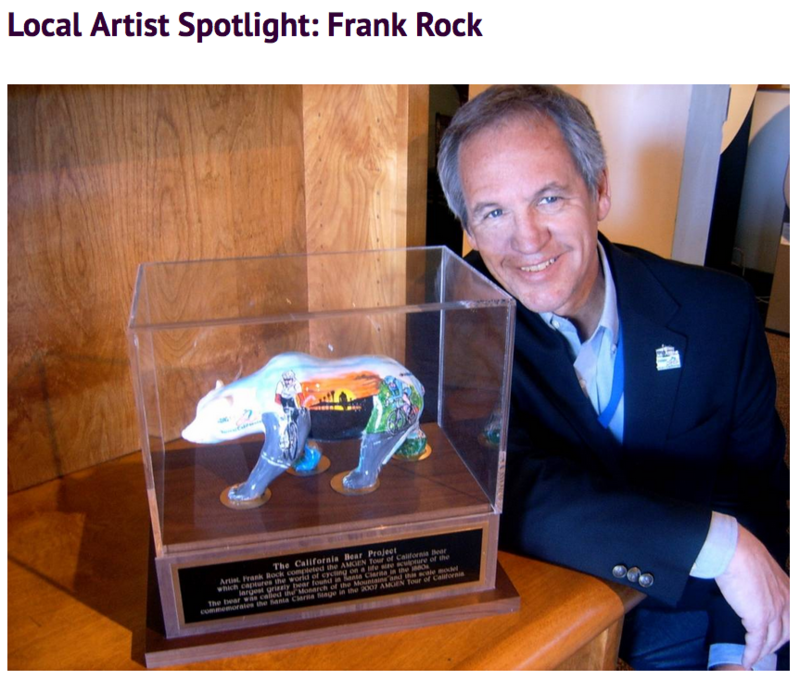 He and his bride live in Tempe, Arizona and he is pursuing a career in law enforcement. 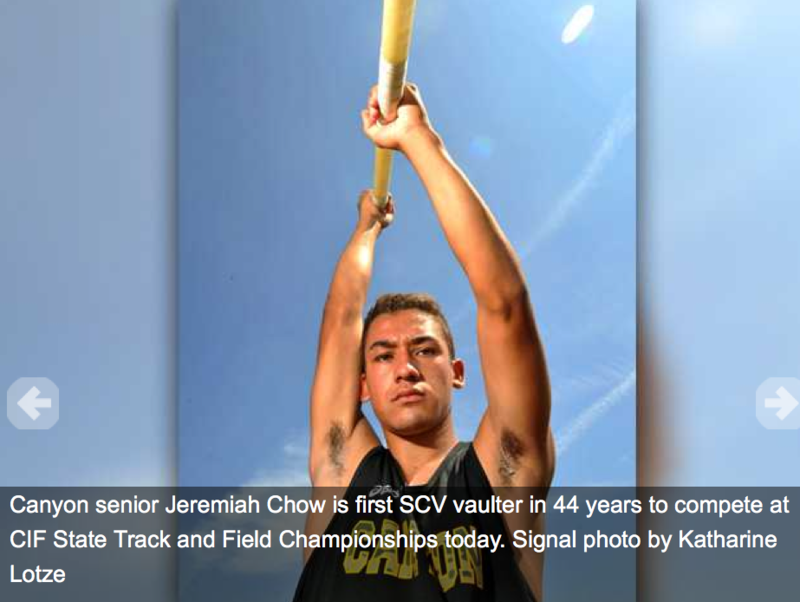 Jeremiah Chow SCV Male T&F Athlete of the year! The Olympic Trials start TODAY. Chris Low runs the opening round 800 trials at 4:15. This is streamed live on the NBC Sports app. Monday, June 27th our 4 week Summer Track & Field Camp begins at 9:30 am. All ATHLETES MUST Register on-line HERE! and must have a physical, and pay the $90 fee. Go here for more info. 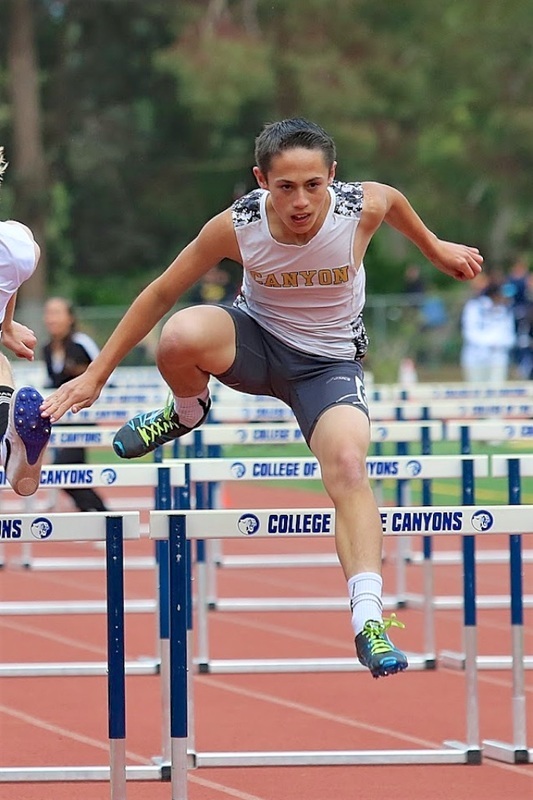 Time Warner Cable will provide a live web stream of the running qualifying events on Friday, June 3 and Championship finals on Saturday, June 4 on www.cifstate.org/sports/streaming/live. 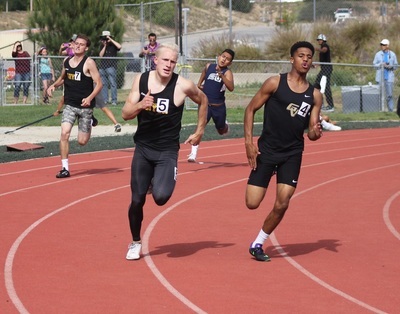 Justin Gallegos from Hart, will compete in the 200 and 400 at the State Meet. 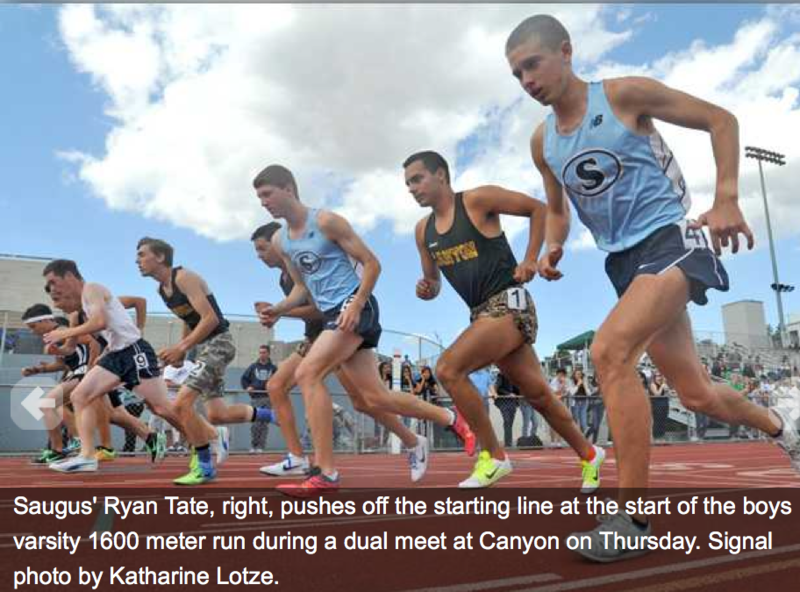 Saturday - State Meet Finals. Jeremiah Chow is going to the State Meet! He cleared 15-0 and took 6th place. 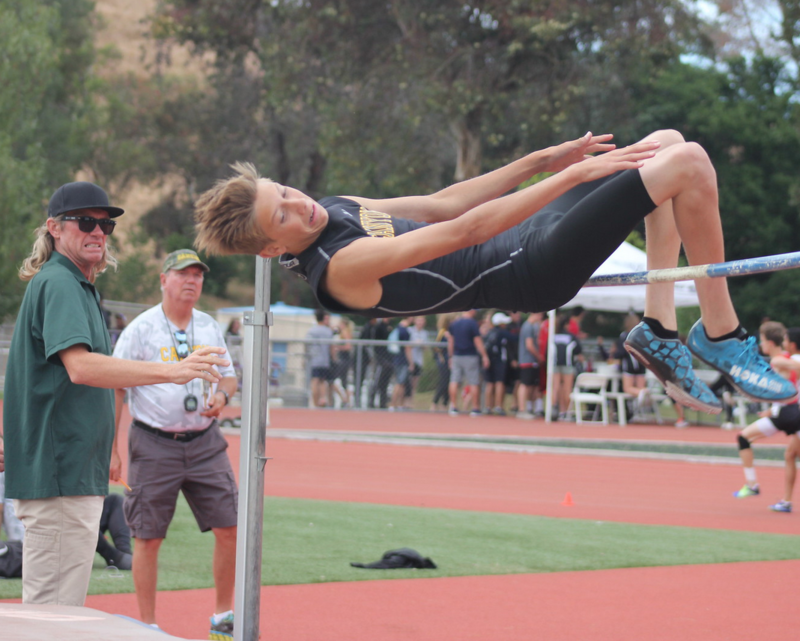 Jake Bennett did not clear the opening height of 14-0. Gabby Sanchez threw 127-0 to place 11th and John Elam threw 155-5 to finish 12th. We are proud of all 4 of you and congratulations on a great post season. 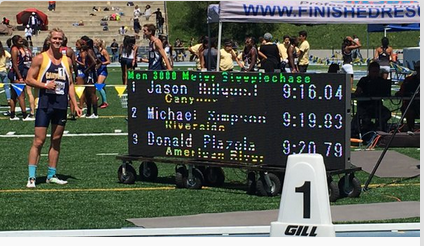 Jason Hillquist #1 (COC) earned All American honors for his State Championship in winning the 3000 Steeple Chase in 9:16.32. 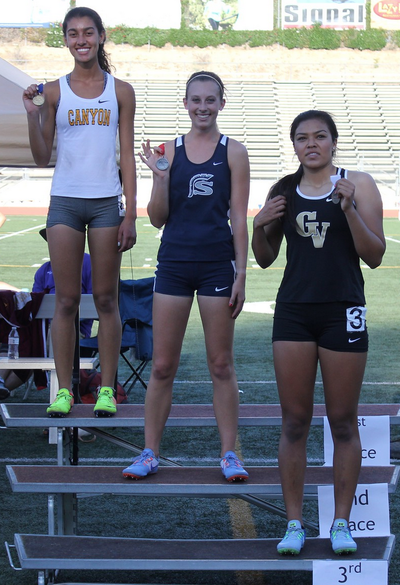 Mari Kneisel (COC) placed 5th in the Long Jump going 18-4. 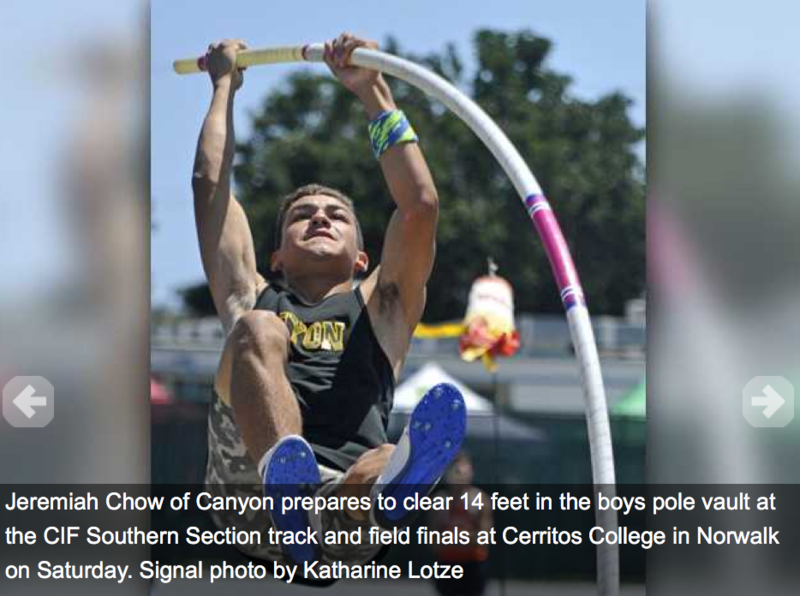 No, this in not Jeremiah Chow clearing 15-0, but rather Jaime Ortega, a freshmen "Decathlete" learning to appreciate how pole vaulting isn't as easy as it looks. 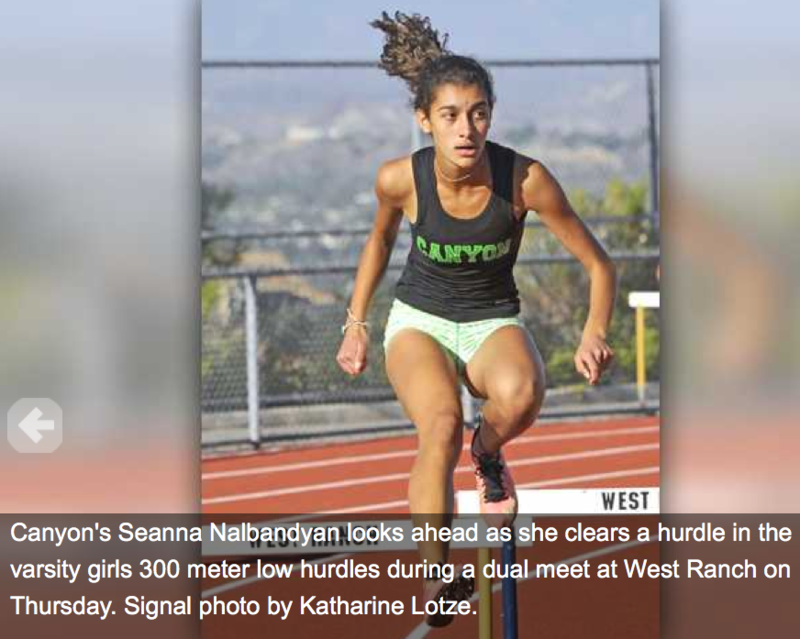 Seanna Nalbandyan improved from #9 "All Time" to #3! She does now hold the junior record. 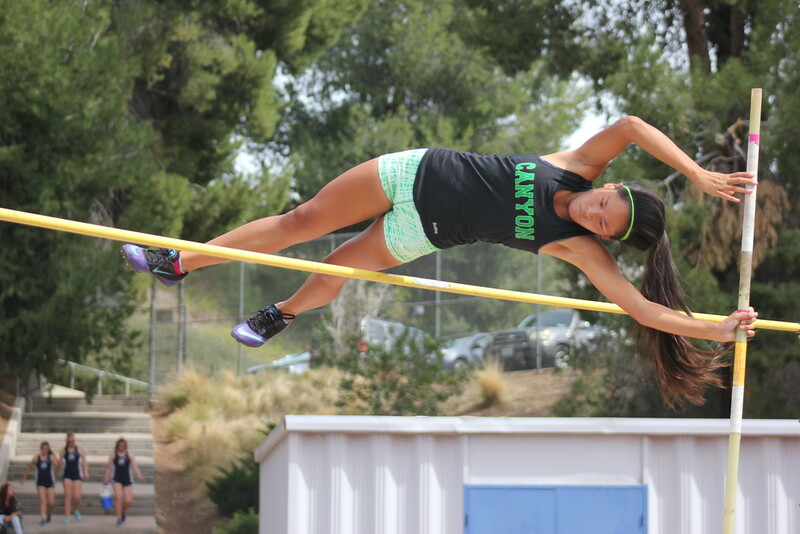 The school record is 4366 set by Pilar Dizon in 2010. Krista Lemeus set the Freshman class record with 2,940 points. Shane Oliver Wins the boys competition with 3899 points. 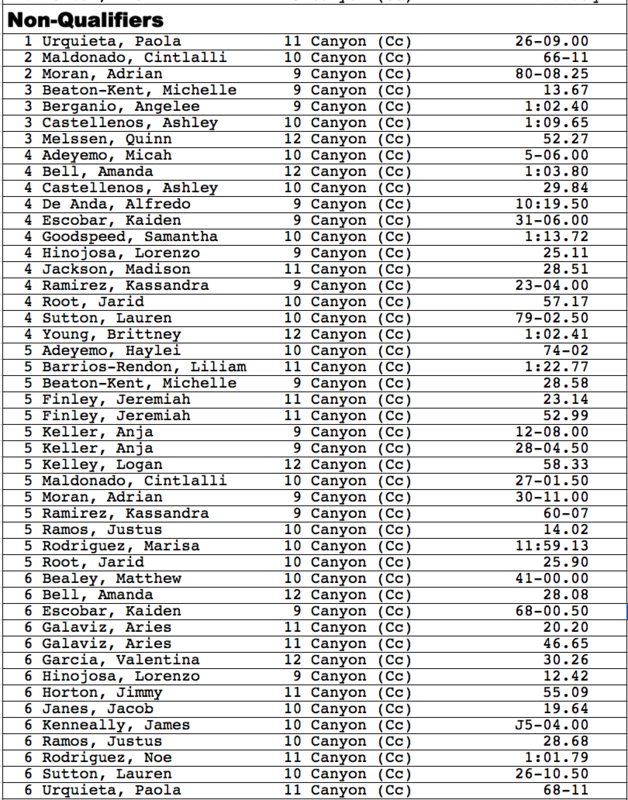 In all 14 boys and 4 girls competed and 13 boys and 3 girls completed all ten events and will receive a Canyon Decathlete shirt tomorrow. Congratulations! 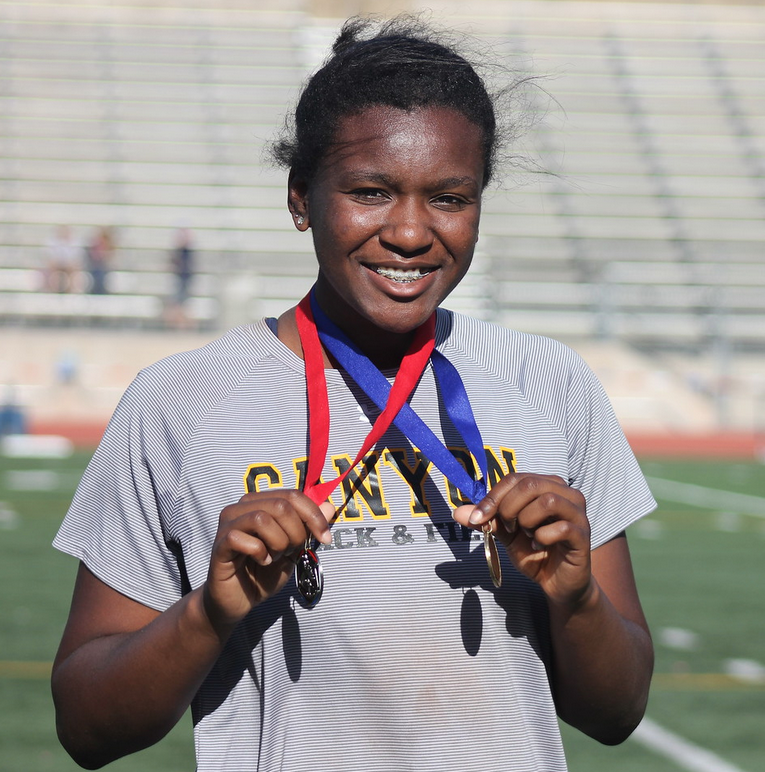 Day 2 events: 110/110 Hurdles, Discus, Pole Vault, Javelin, 1500 m.
Alysia Montano (Cal - 2005-2008) was named to the PAC 12 All-Century team in the 800. Lauren Fleshman (Stanford 2000-2003) made THE LIST in the 5,000. The Physicals scheduled for today are postponed until Thursday. We will meet in S-4 this Friday 7th period and after school! ALL lockers need to be cleaned out no later than Friday May 27th by 3:30 pm. All items left in the lockers will be emptied and donated to Goodwill that same day and will not have the ability to be returned to students. PE Teachers are not responsible for any student items left in lockers after the locker clean out deadline. Gabby Sanchez with her 3rd place CIF medal and MOM! qualified for the Masters Meet next Friday! 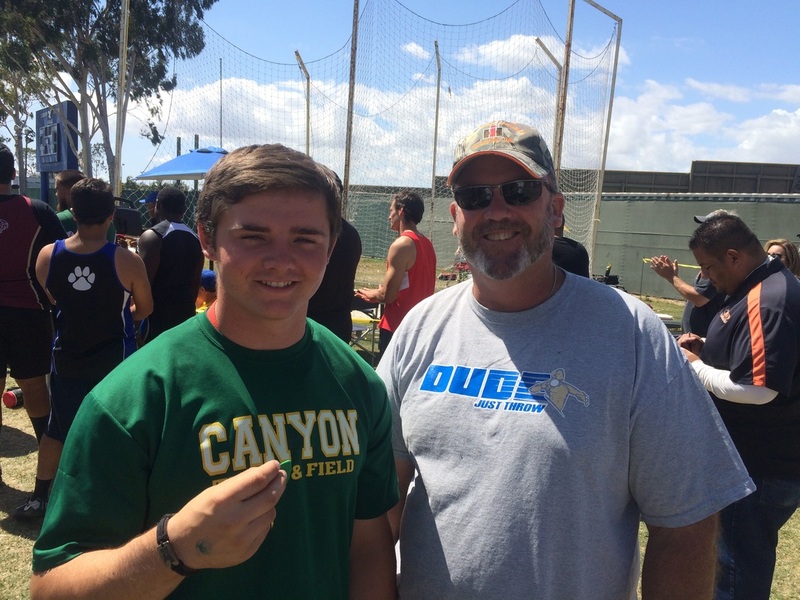 John Elam with coach Quam with his 4th place All-CIF medal! This just in John Elam had a Personal Record 162-7 in the Discus Throw! He took 4th place in Div. 2. John finished 12th overall and did qualifying for the Masters Meet next Friday. 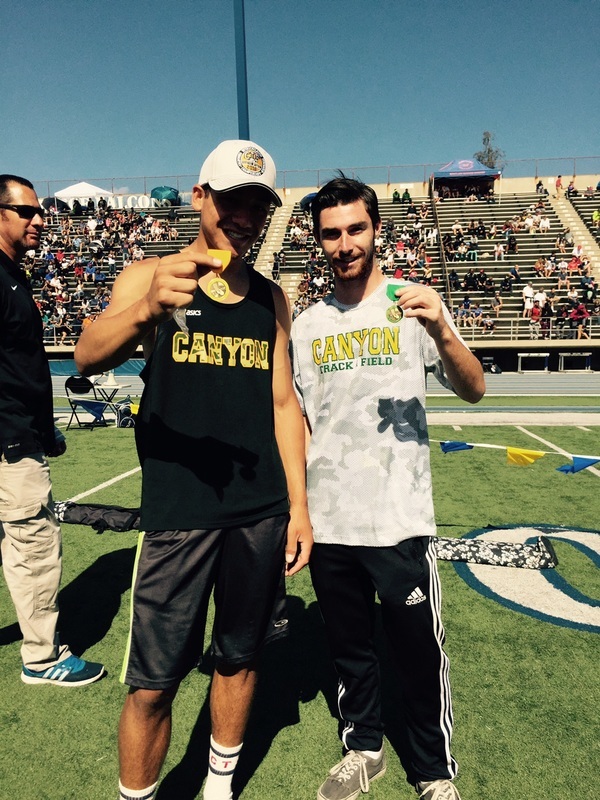 Jeremiah Chow (left) and Jake Bennet with their All CIF Medals! This just in Jake Bennett cleard a Personal Record, 14-6 with no misses to place 4th in the Division 2 Pole Vault. 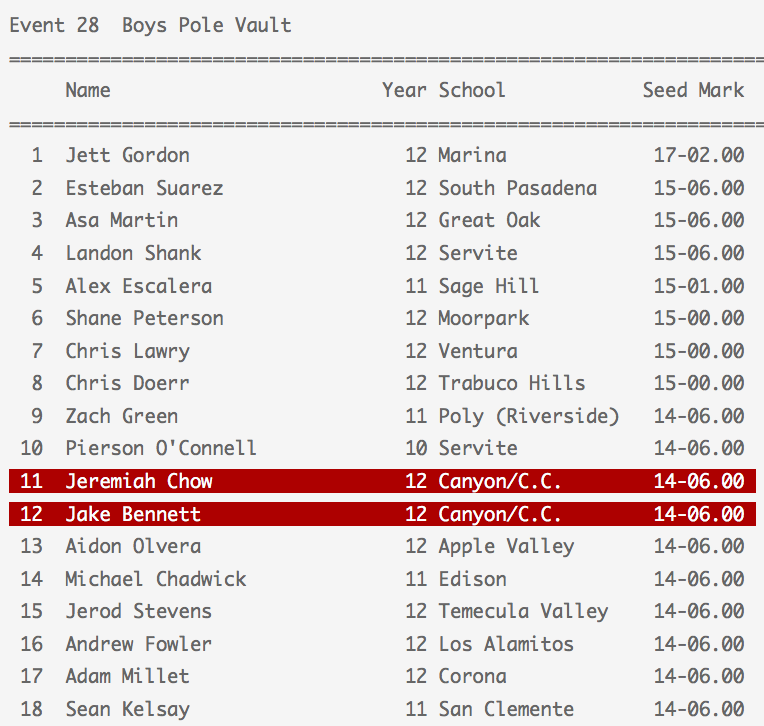 Our School Record hoder, Jeremiah Chow, placed 5th, also at 14-6 but with a miss. Both had good attempts at 15 feet. Both Jake and Jeremiah qualified for the Masters meet next Friday! 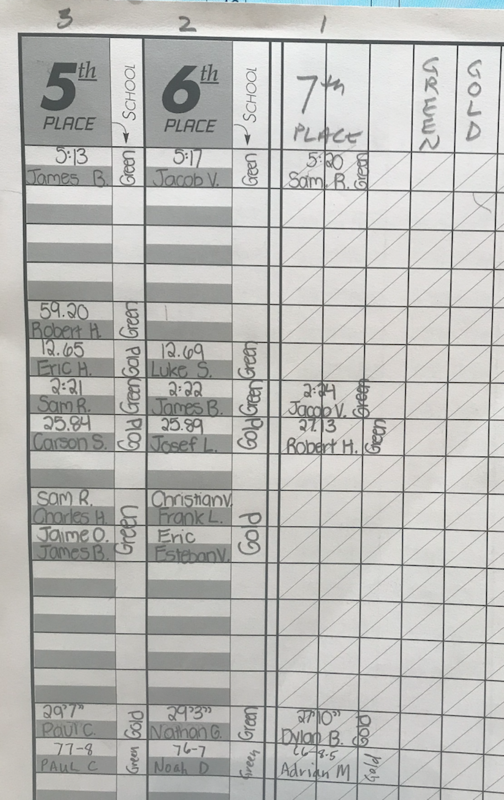 Our boys 4x100 team (Taylor Tepesano, Steven Arrington, Troy Chairz, and Connor Holcomb) almost missed their race due to a team member arriving to the meet 45 minutes late. The meet officials ended up allowing us to run, but we only managed a 43.60 and a 9th place finish. Connor Holcomb placed 8th in the 400m in 50.30. 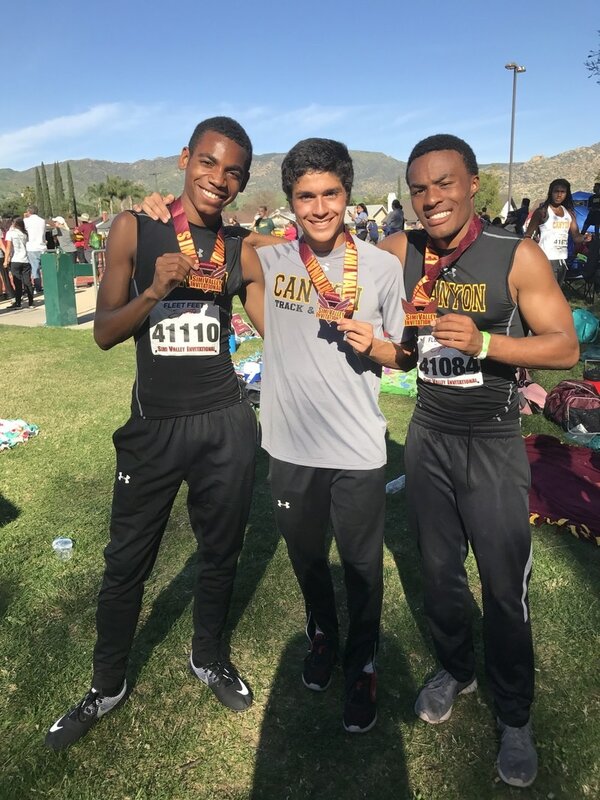 Our boys 4x400 Relay team (Taylor Tepesano, Steven Arrington, Troy Chairz, and Connor Holcomb) made the podium and earned All CIF Honors by placing 6th in 3:26.35. 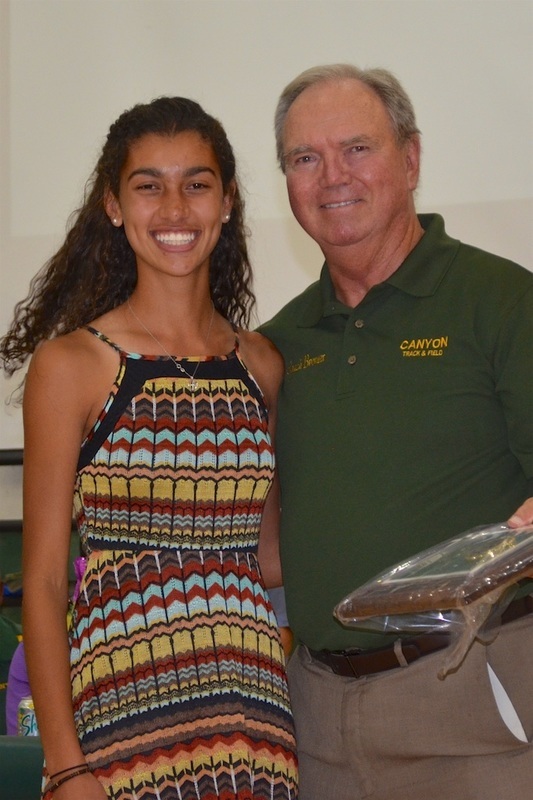 Congratulations to all 8 Canyon Athletes! 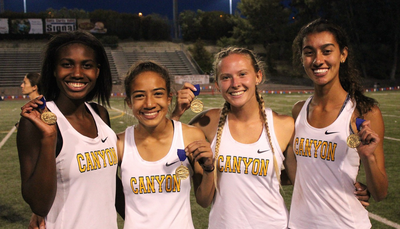 Each of you earned ALL CIF HONORS!!! Our Boys team finished 11th in Division 2 with 18 points. 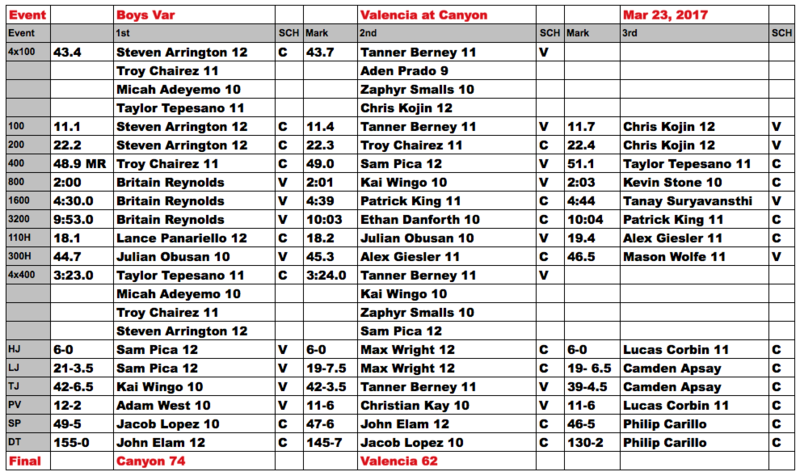 (Golden Valley was 31st - 6 points, Saugus 39th 4 points) West Ranch, Valencia, and Hart did not score a point. 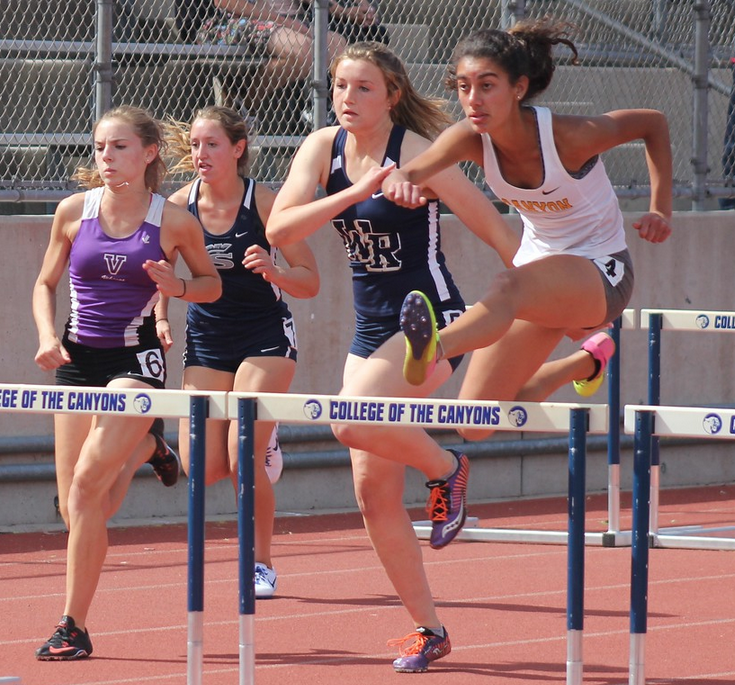 Our Girls Team (Gabby Sanchez) finished 28th with 6 points. Golden Valley was 5th with 35 points, West Ranch 13th with 14 pts. and Saugus 42nd with 2 points. Hart and Valencia zero. Alumni Update (May 20th) Jason Hillquist (COC) Won the Junior College So. Cal Finals in the Steeple Chase. His time was 9:28.01. 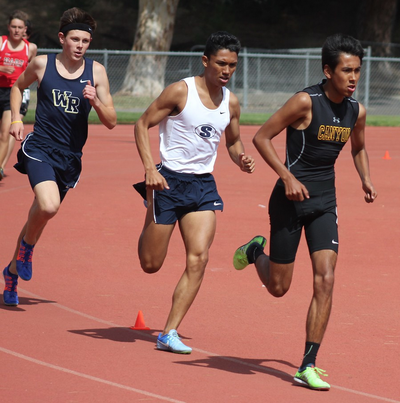 Joel Estrada (COC) placed 4th in the 1500 in 4:06.76. Cole Mears (COC) was 5th in the Javelin. Jeremy Kimmer (Glendale Col) qualified for State in both the High Jump - 3rd at 6-7.5 and Pole Vault - 3rd at 15-10. 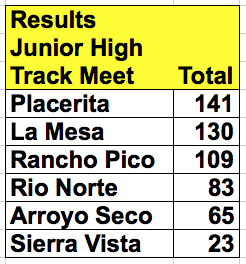 Every year we find Sierra Vista at the bottom of the results sheet for the Junior High Track meet. Last year they only scored 12 points, so I guess they are improving? My granddaughter, Emma, threw the shot for Placerita. They actually have a team! They hold tryouts, practices, and make a big deal about this meet, and make it about school pride. REMINDER- Team physicals are Monday in S-4 from 2:00 to 6:00 pm $25 Cash! 63 of our "STUDENT" Athletes earned Academic Medals for earning a 3.5 GPA or Higher. 25 had a 4.0 or higher. and one, Yee-Lynn Wong (first girl in the picture on the right) achieved a perfect 5.0. Congratulations to Coach Richardson! 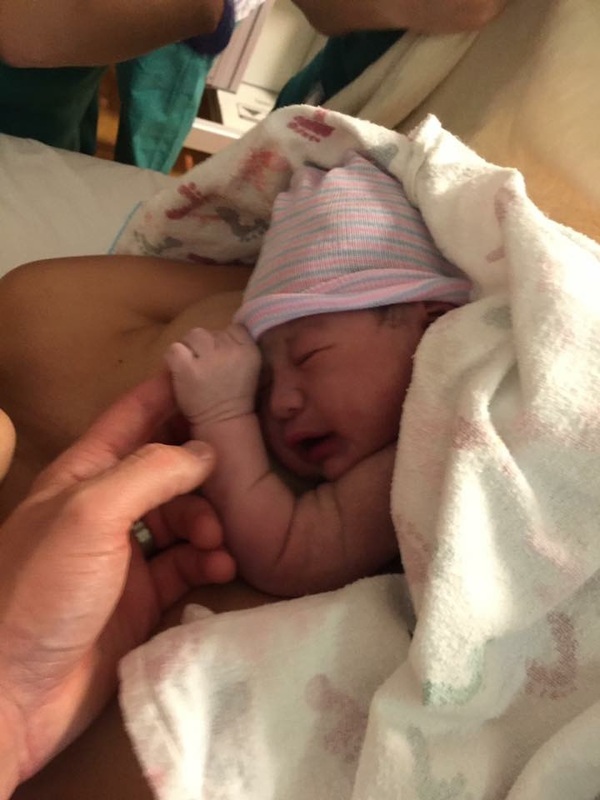 Yesterday he became a grandfather! Meet Milo Richardson, 9lbs 9oz, 21 inches! Candidate for a future thrower! 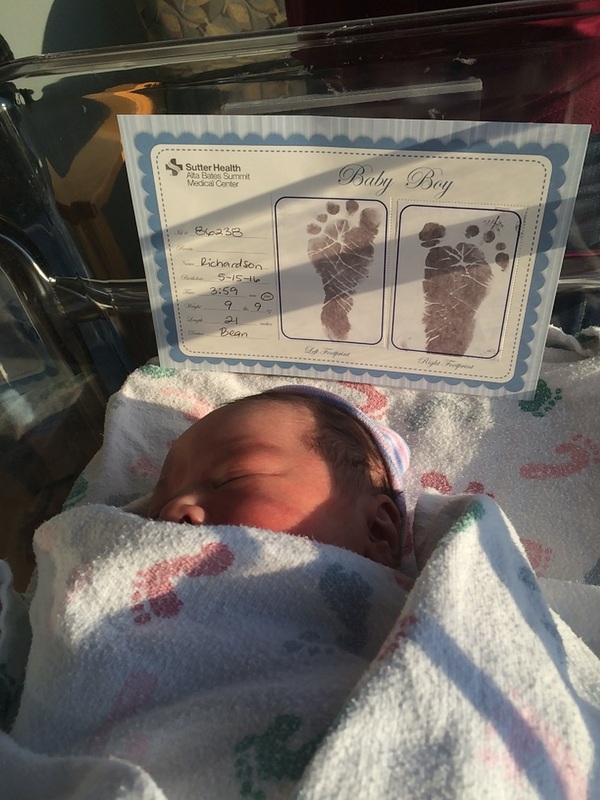 His son, Preston, is now a proud dad. So, Coach informed me that he is in San Francisco today, and will miss today's workout! Next Saturday! Below is Jeremiah Chow easily clearing 14-0 to advance. 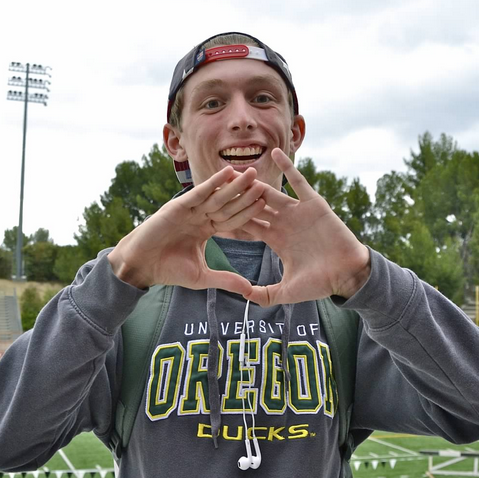 (Hart) Cool Interview on FloTrack about his dream of becoming an Oregon Duck. Natalie Rodriguez (Cal State San Marcus) set the school record in the 1500 at 4:31.75. Alumni Update (May 14th) Caleb McClain (San Francisco) placed 7th out of 43 runners in the West Coast Last Chance meet runnning a 14:44.0 PR in the 5,000m. Jeremy Kimmer (Glendale Col) PR'd in the Pole Vault at 15-10 and High Jumped 6-7 to qualify for the State Meet in both events next Saturday. Alumni Update (May 7, 2016) Chris Low won his 800m heat at the Oxy Invite in a time of 1:48.47. Jeremiah Chow & Jeremy Kimmer 15 footers! 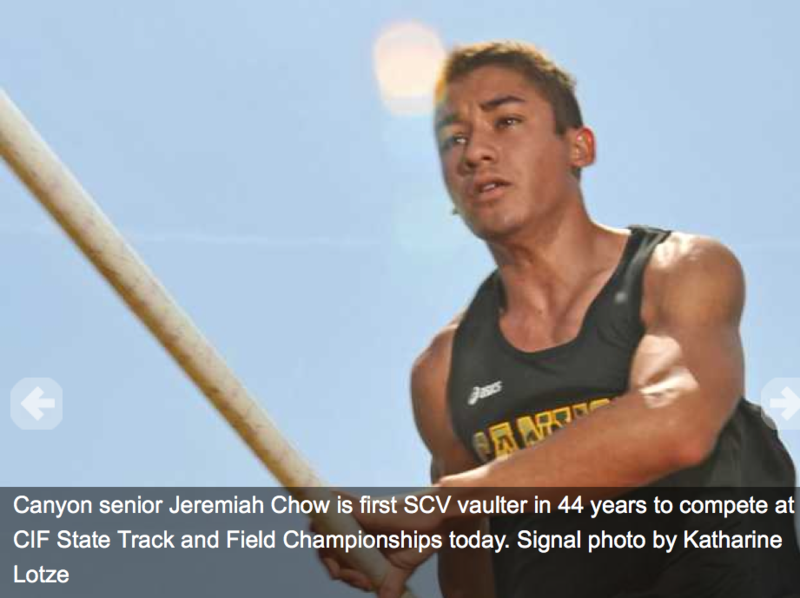 Here is a video of Jeremiah Chow's 15 foot vault which tied the school (and League) record held by Jeremy Kimmer. Above the co-record holders celebrate on the pit! 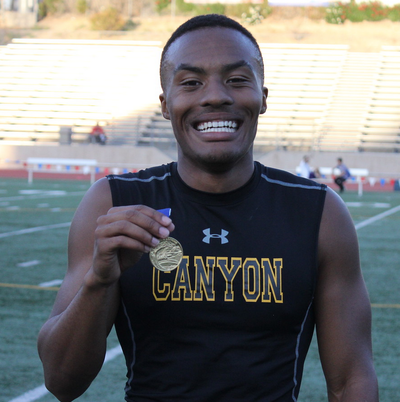 3rdIt was a good day to be a Cowboy at the Foothill League Finals at COC. 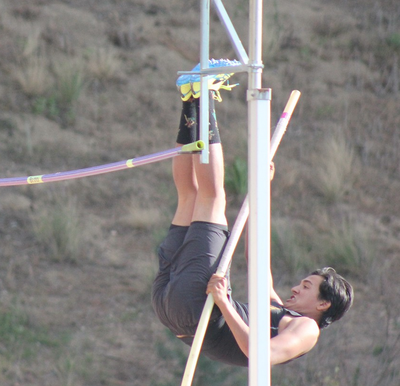 Jeremiah Chow won the pole vault at 15-0 which tied the League Record, set by Jeremy Kimmer in 2014. Jake Bennett took 2nd at 14-0. 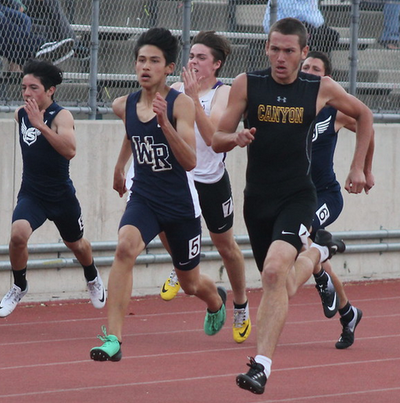 Connor Holcomb also placed 2nd in the 400m in a pr 49.07. Jacob Lopez had a good day placing 3rd in the Discus Throw 1t 141-1.5 and 4th in the Shot at 47-0. Keashon Foster, Alaycia Smith and Brittney Young. 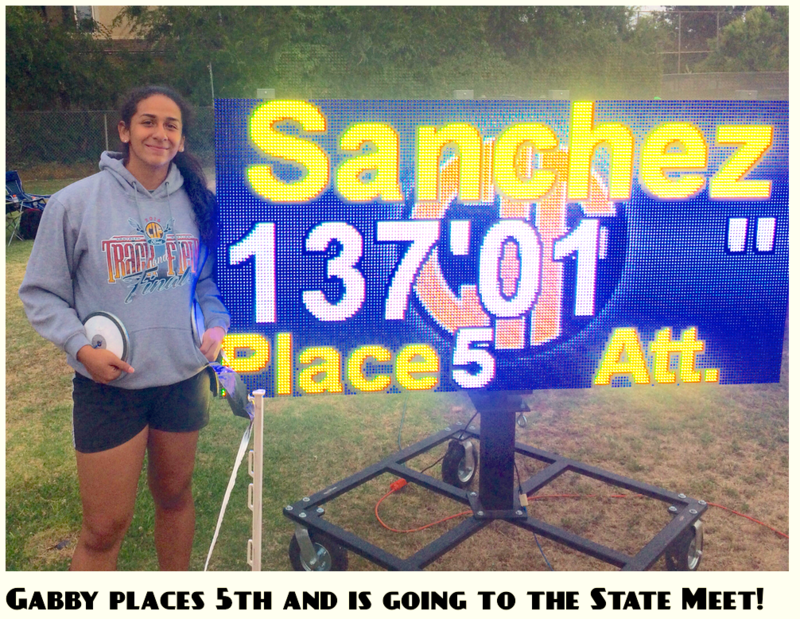 Gabby Sanchez placed 3rd in the GV Discus with a throw of 113-5.5, and 5th in the Shot with a PR 36-1. 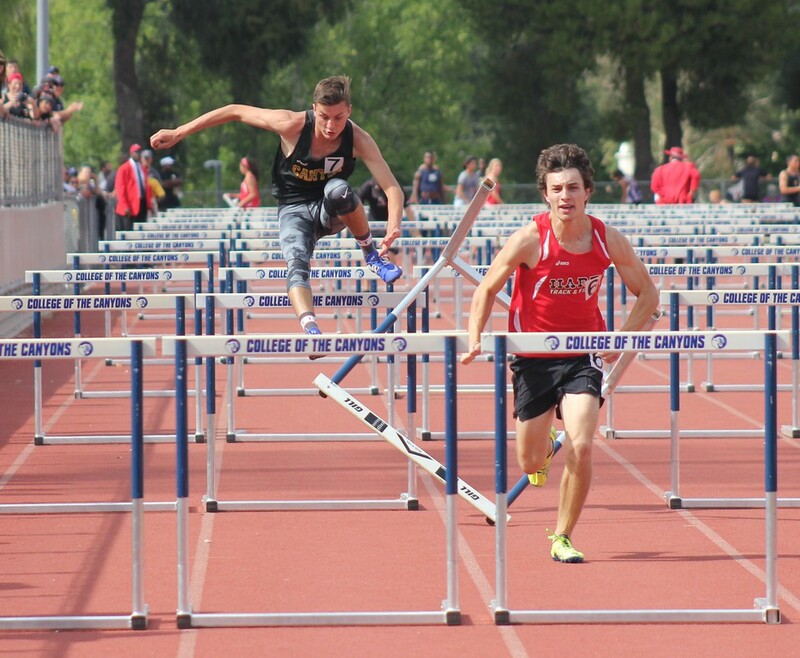 Lance Panariello 1st 300 Hurdles 43.51 and 3rd in the 300 Hurdles in 44.45. 10 of our 16 Coaching Staff relegated to the stands. At least one of us seems interested in the Pole Vault! 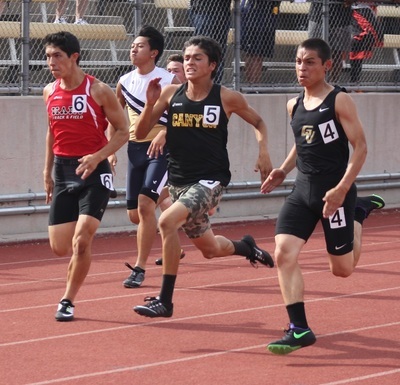 Sophomore, Troy Chairez qualfies in 100 11.65, and 200 23.33. Senior, Connor Holcomb, qualified 1st in the 200 at 22.41 and 400 at a PR 50.03. Sophomore Jacob Velarde PRs in the 1600 at 4:43.56. Sophomores, Lance Panariello and Alex Giesler, placed 1-2 in their Heat in 17.69 and 17.59 respectively. Junior Shane Oliver had to clear 11 hurdles in his 110 HH heat in 18.57. 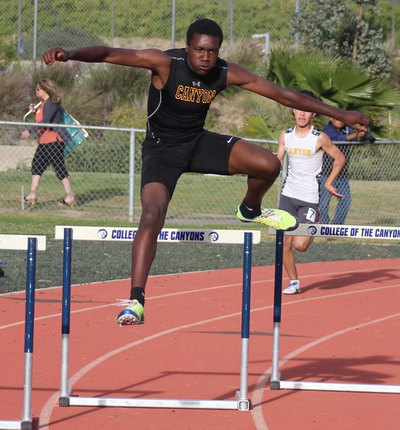 He also qualified in the 300 Hurdles in 42.66. 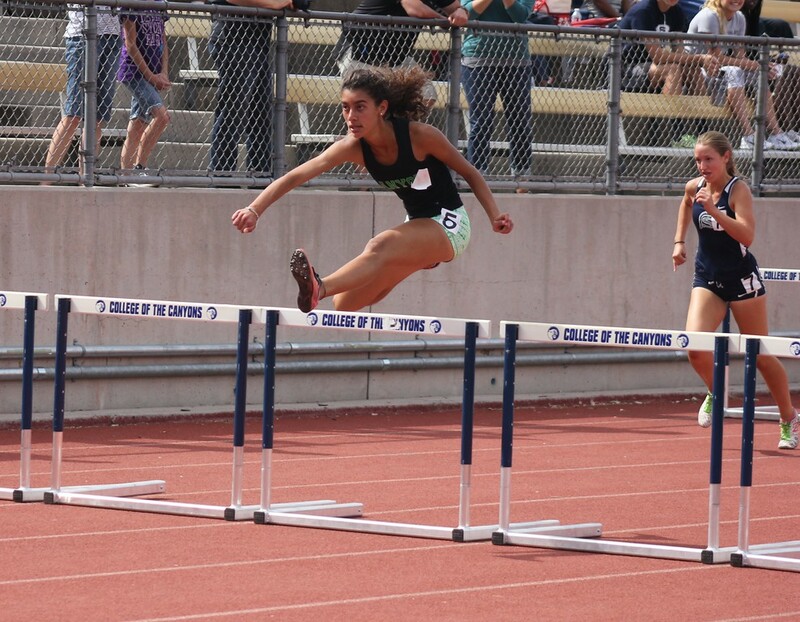 Junior, Seanna Nalbandyan, won both of her Hurdle races. 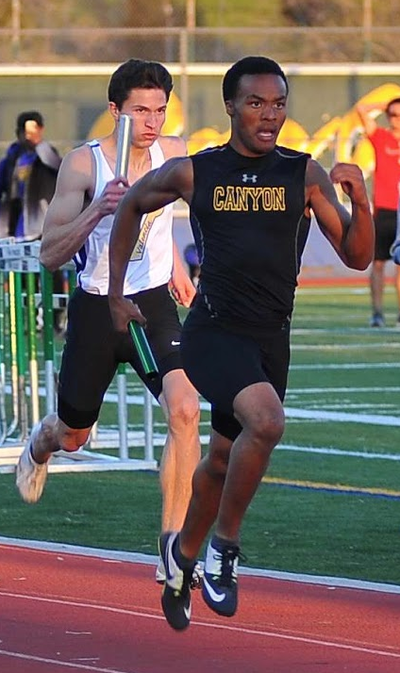 100H in a PR 15.87, and the 300H in 46.11. Sophomore, Max Wright, repeats as the FHL FS Champion in the High Jump at 6-0. 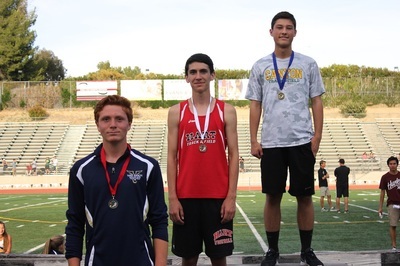 Max on the podium with his 1st place medal. Luis posing with his 2nd place medal. Freshman, Haylei Adeyemo, wearing her 3rd place medal from the shot put with a throw of 29-10. A happy Coach Frank Rock with his Champion, Sophomore, Gerardo Ruiz, who won the PV with a PR 11-3 in a jump off. Gerardo and Lucas Corbin on the podium with their Pole Vault 1st and 3rd medals. Lucas cleared 10-0. Andrew Mawhorter, was 7th 10:15, and Freshman, Ethan Danforth, was 9th in 10:20.98. Junior, Steven Arrington, winning his heat in the 100 at 11.27, and he also won his 200 heat in 22.57. 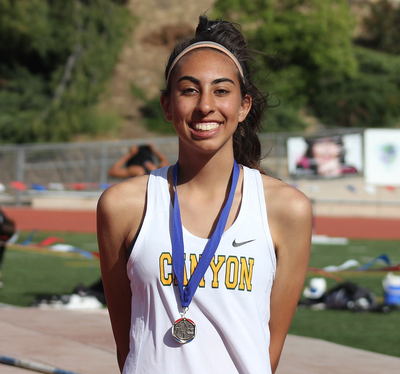 Krystal Enriquez placed 2nd in the JV Pole Vault equaling her PR at 8-6. 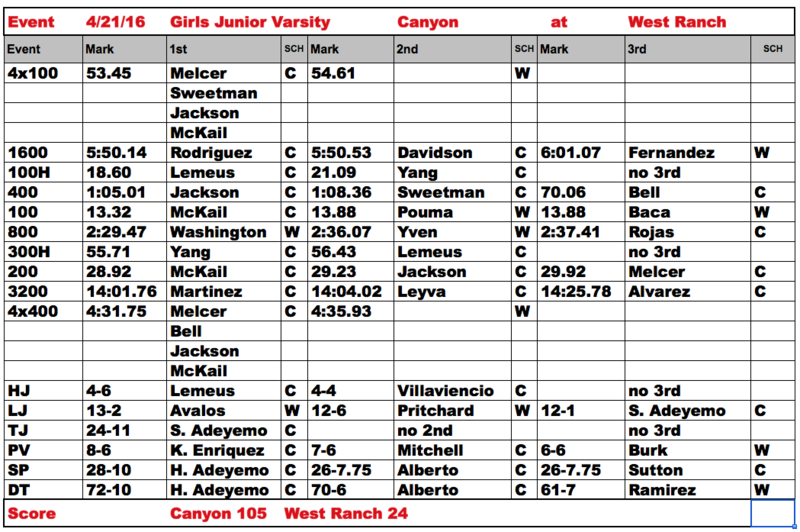 BTW the mens championship went to Questa with 139 points, COC 2nd 137, Glendale 3rd 123.
in the womens meet, the chapionsionship was won by West LA with 177.5, COC 2nd 167, Glendale 5th 54. Just how close was this meet? It takes 69 points to win. We had 64. 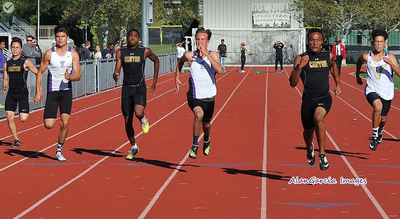 100 meters .01 between 1st and 2nd and .01 between 3rd and 4th. 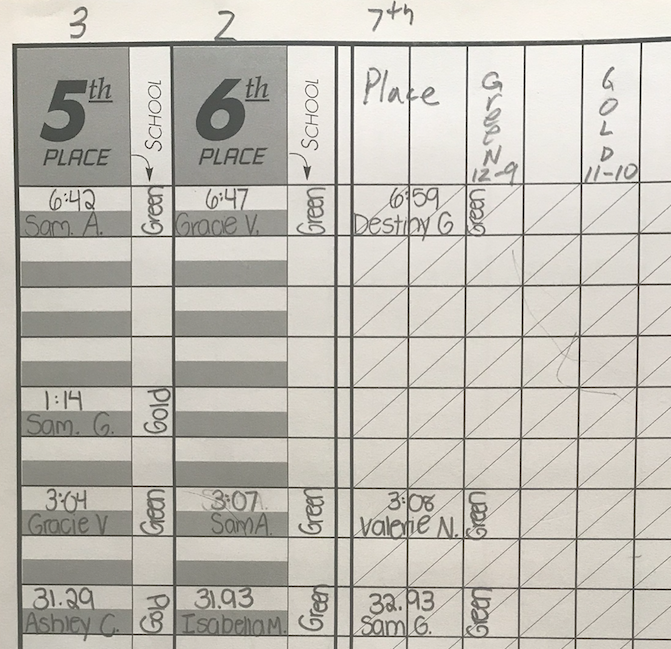 A tie in the High Jump for 3rd at 5-6 was broken on number of misses. A 10-6 vault takes 2nd place! 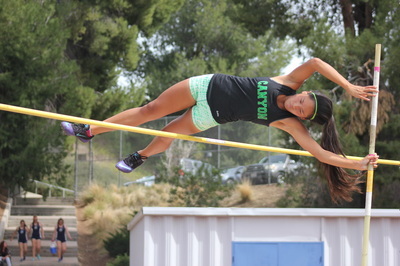 5 of our vaulters have gone that high this season. 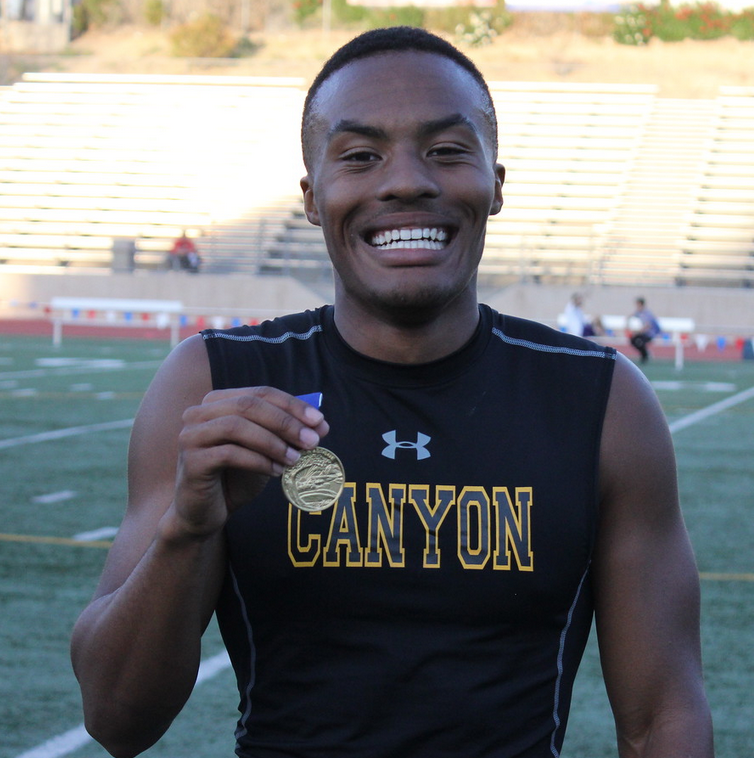 In the Triple Jump, Saugus 1st at 39-7, Canyon 2nd at 39-6. Third place went to a 38-5 effort to our 38-3. 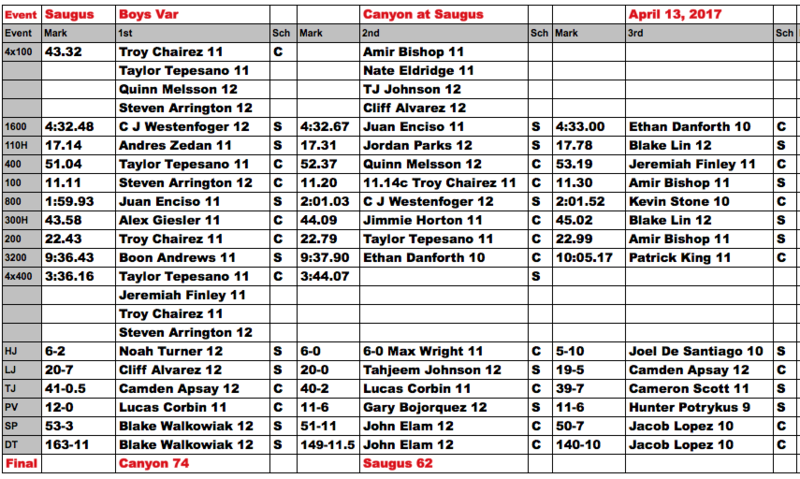 If those VERY close events all go our way, the final score would be.... Canyon 74-Saugus 63. This was Saugus's third victory over the Cowboys in the past 28 years. 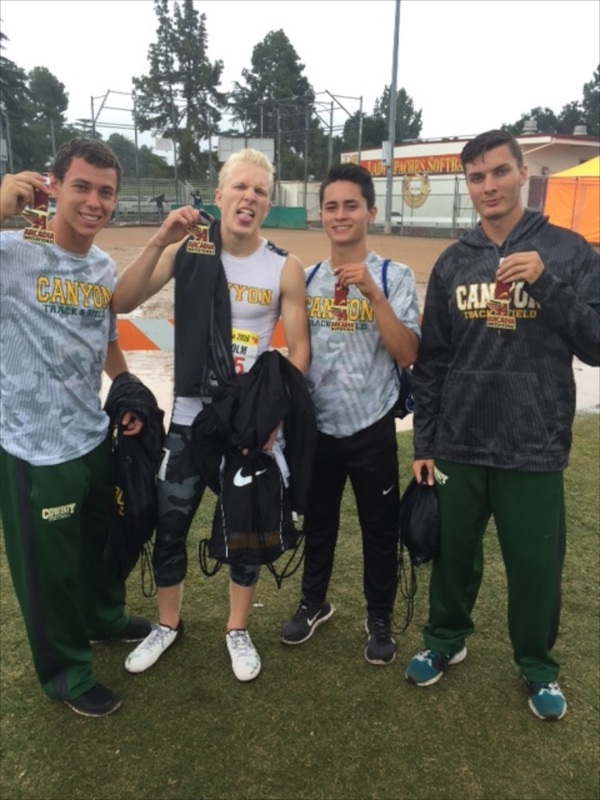 Alumni Update: Dana Bowers, Mari Kneisel, Jason Hillquist, and Joel Estrada competing for COC at the WSC Championships at COC on Friday. 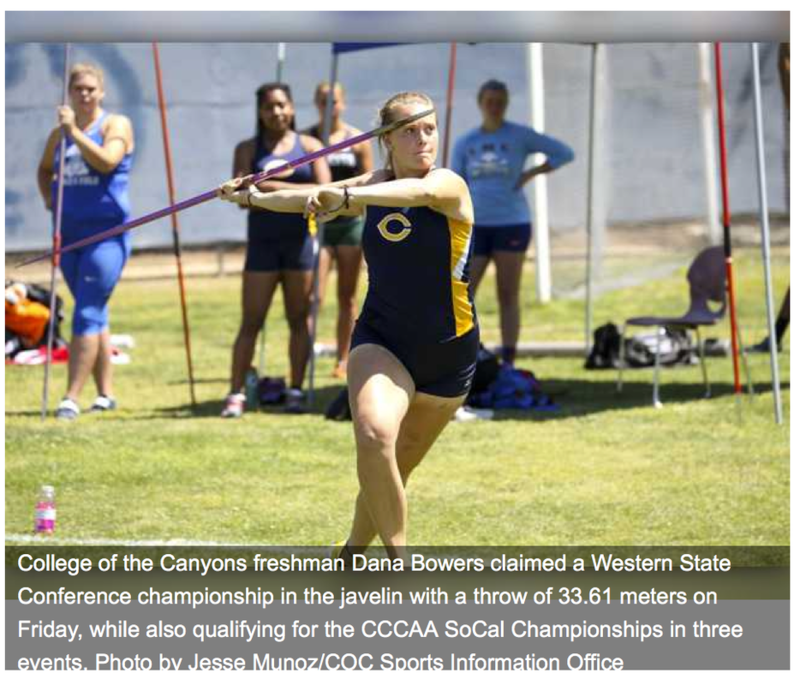 Signal Article Dana won the Javelin at 110-3, 2nd in Shot Put at 36-5, 4th in HJ at 5-1. 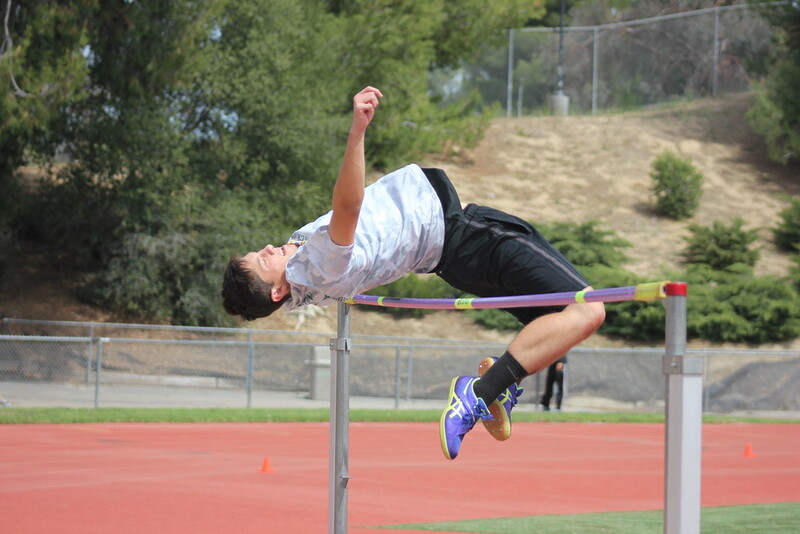 Also winning the High Jump for Glendale College was Jeremy Kimmer at 6-8.75. BFS won 83.5-52.5, GJV won 105-34. 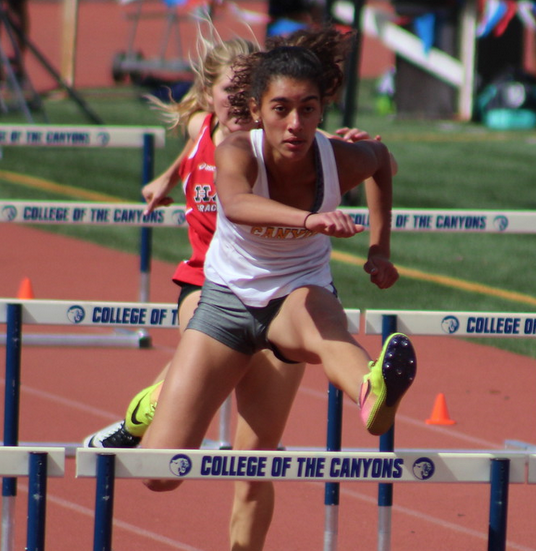 Seanna Nalbandyan ran the 300 hurdles in 46.39 and is now ranked 5th All Time and also ran the 100 hurdles in 16.06 which ranks 7th All Time. Selasi Mawube Triple Jumped 33-7 to become 9th best All Time. 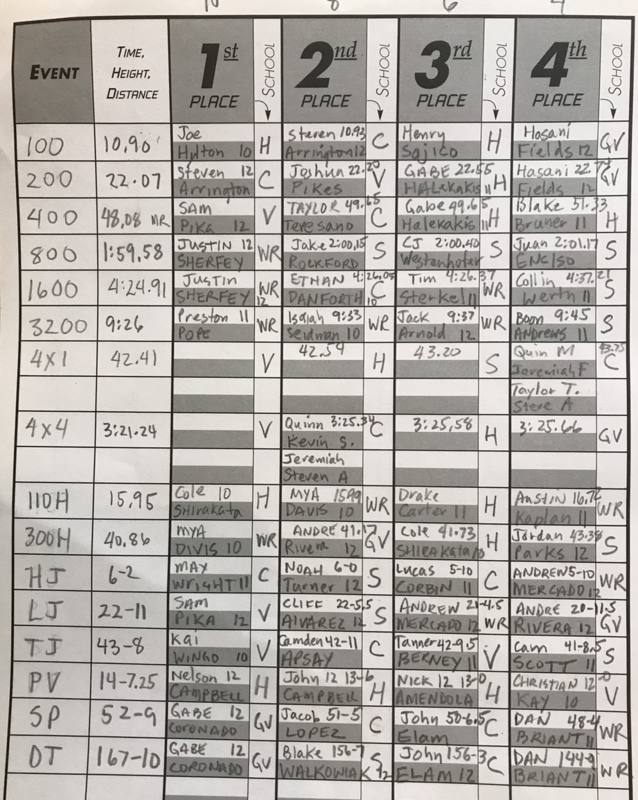 and our dual meet record and scores. and 6 of those are Connor Holcomb's! 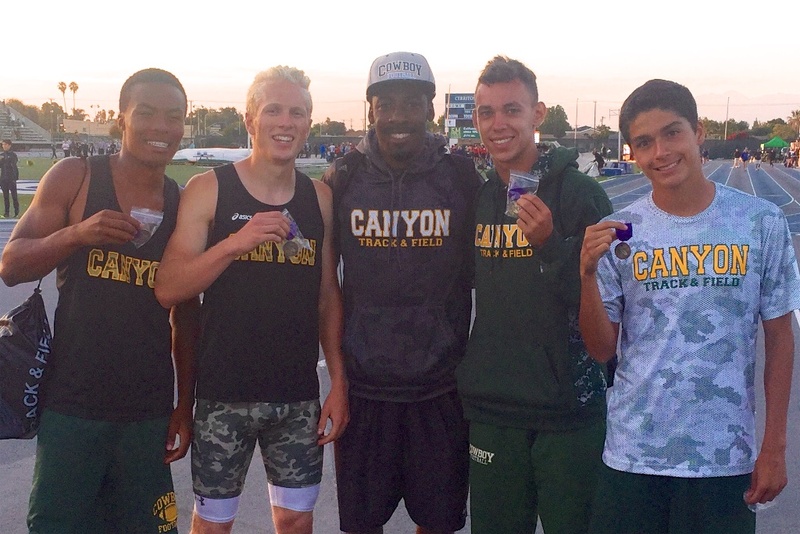 The future of Canyon Track is bright! 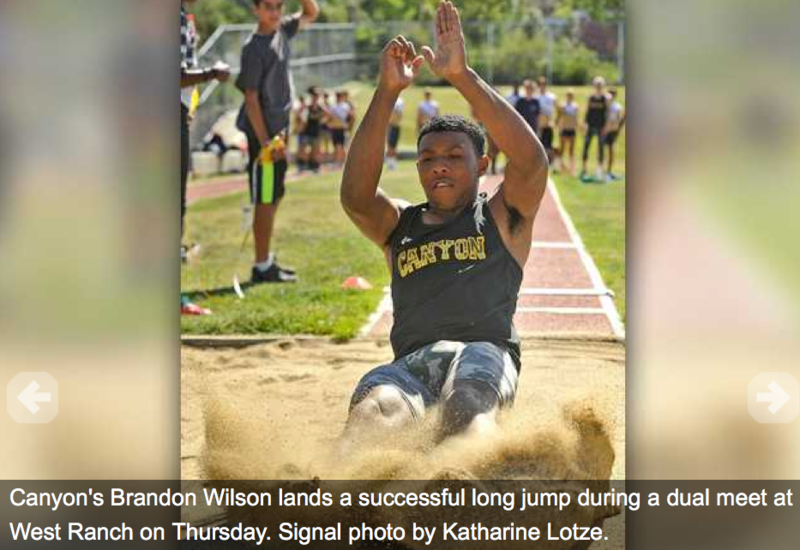 Signal Article by Erik Boal, on yesterday's meets. John Elam had a good day! 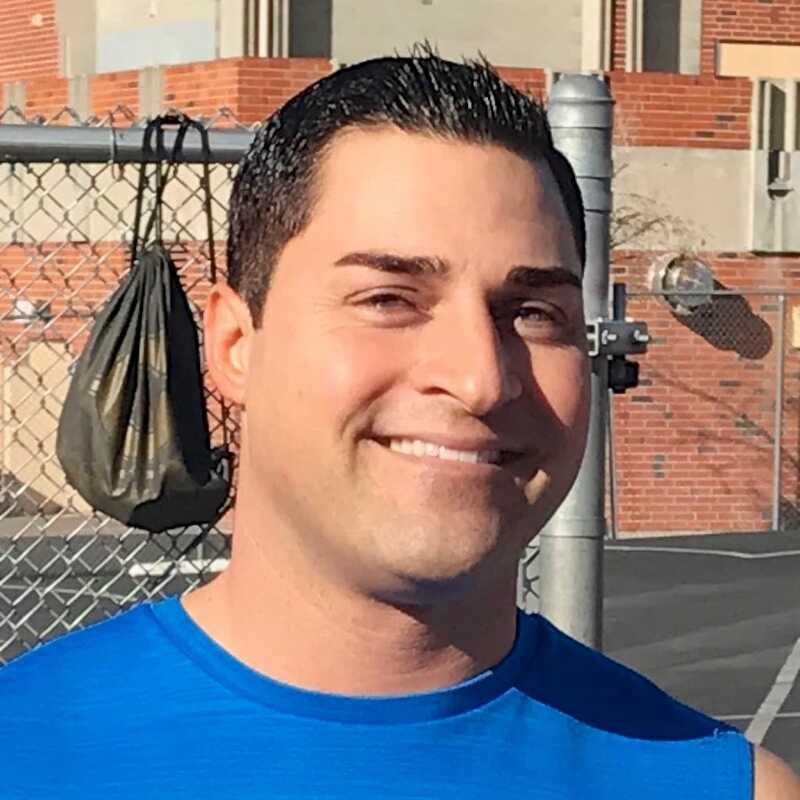 He set 2 meet records: Shot Put 53-7 (broke Jordan Sykes year old record 51-1) and the Discus Throw 146-10 (broke Ricky Bergeron's record 138-9.5 set in 2009). This marks the 15th consecutive win for the boys varsity over Valencia. Unfortunately, we did not beat them at their best. They were missing multi-event man, Sam Pica who was sick. We told our team yesterday that it was important to win both relays. Connor Holcomb ran a great anchor leg running down Valencia's anchor and winning by a few inches. 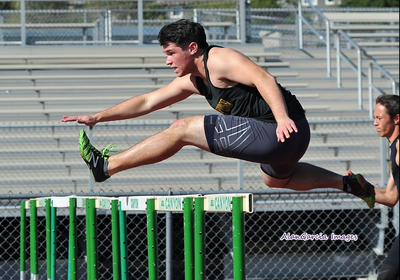 We outscored Valencia 38-16 in the field events. Big PRs by Max Wright HJ 6-0, Brandon Wilson LJ 21-3.25 and John Elam's 2 throws. We also outscored them 24-13 in the sprints. We scored 12 of 27 distance points as well. Our girls varsity suffered a 20 point loss, however we had MANY PRs. See Below. 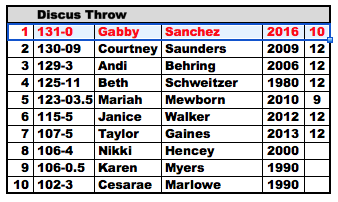 Gabby Sanchez PR'd in both the Shot Put 34-4.5 and Discus Throw 114-10 which are both All Time Top Ten marks. Brittney Young's 26.52 PR also made the "List." 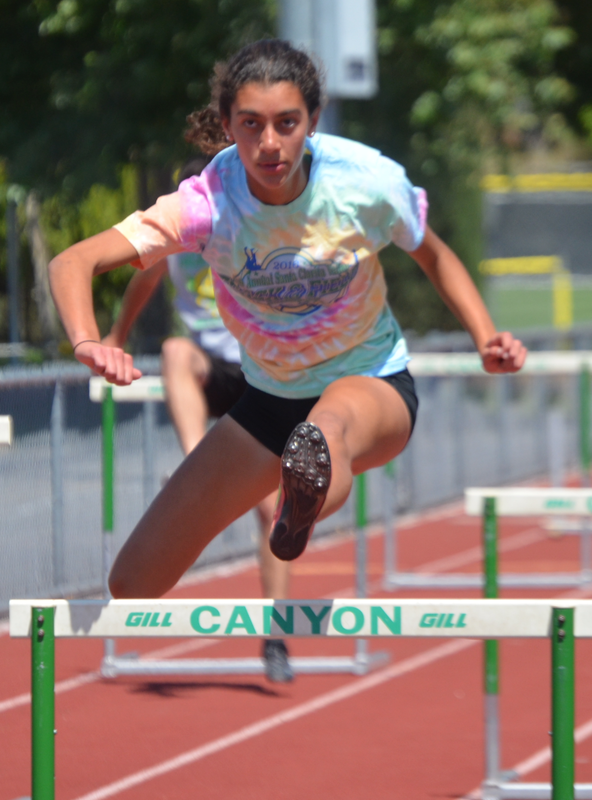 Seanna Nalbandyan remains unbeaten in league in both hurdles with times of 16.48 and 47.71. Our Boys FS team also improved to 3-0, while our girls JV team dropped to 2-1. 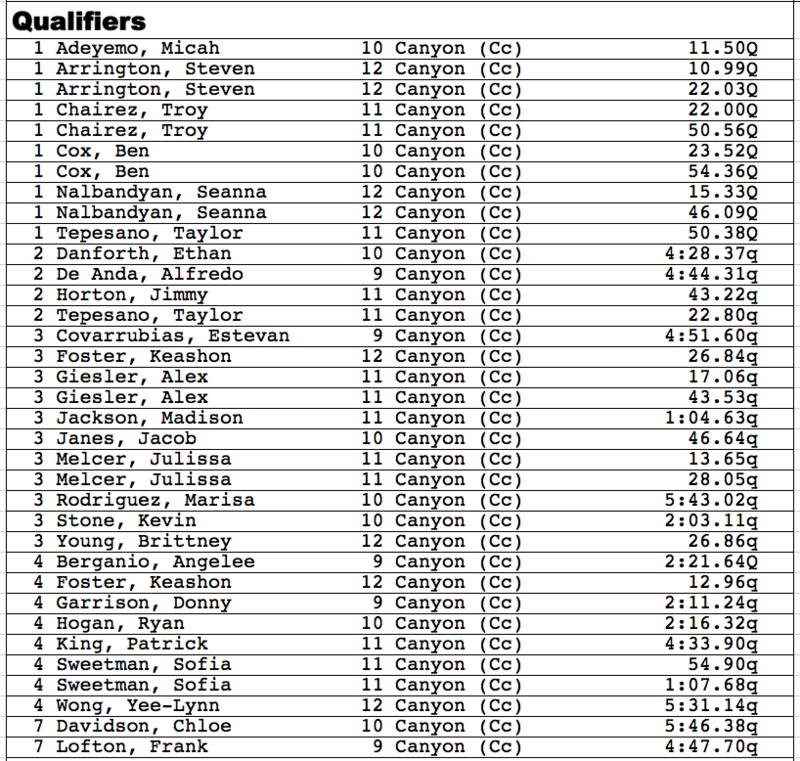 I count 87 PRs (Personal Records) highlighted in yellow below!!! The Cowboys Showed UP to COMPETE today! Gongrats. 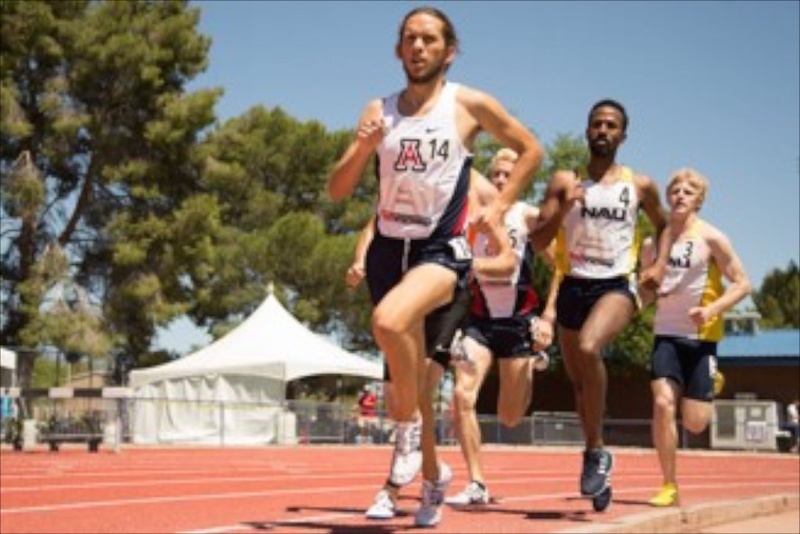 Sam Willis ran a PR 3:48.94 1500m Saturday for the University of Arizona in the Jim Click Shootout. 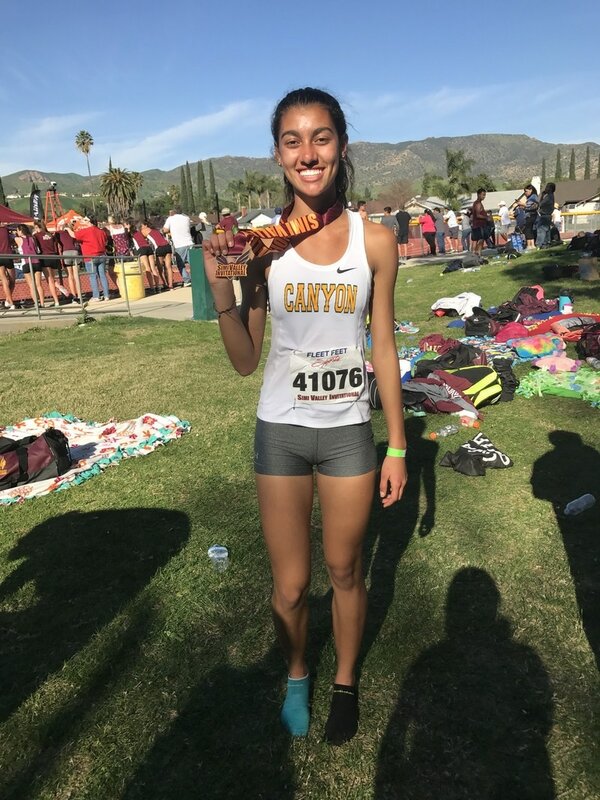 This just in from the Arcadia Invitational. Jake Bennett placed 4th in the pole vault with a PR 14-2! This puts Jake at #7 on our "All Time Top Ten List"! Jeremiah Chow also made the podium, placing 5th at 13-8. The competition was scheduled to start a 4:30pm, but had to be delayed until 7:00pm because only one pit was available. Saturday, at the ARCADIA INVITATIONAL, Steven Arrington placed 3rd in the 200 at 22.44, and 6th in the 100 at 11.15. Our boys 4x400 relay team of Taylor Tepesano, Connor Holcomb, Andrew Quezada, and Shane Oliver, placed 3rd in their heat with a season best 3:27. This was without Arrington! Connor had a PR 48.56 split! Matt Nali has VIDEOS of the 4 varsity hurdle races. More PHOTOS of Hart meet. 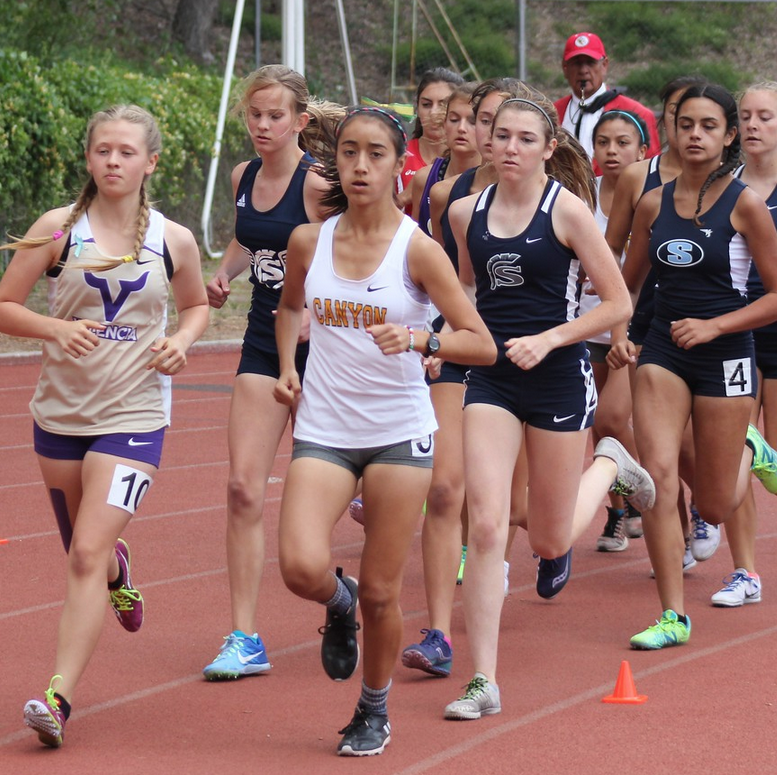 Golden Valley's girls beat Saugus yesterday 77-59! Signal Article. Hill and Tinoco interviewed by Erik Boal.GV went 1-2 in the 3200 in 12:00.3 to clinch the meet. Saugus has 7 girls who have run faster than that so far this season. Saugus's 3rd girl has run 11:06! It goes to show, that times mean nothing! It's all about who wants to WIN! Congrats to the GV Girls. The Saugus boys remain unbeaten winning 87-49. 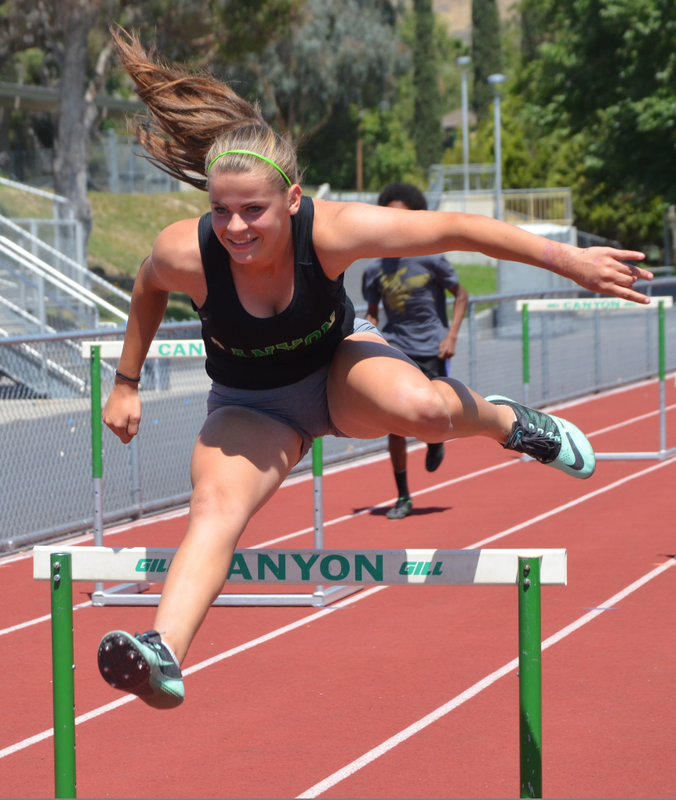 Canyon Hurdlers - Check this out! 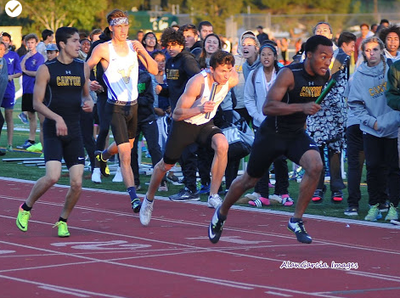 Friday and Saturday April 8-9 is the Arcadia Invitational - Entries will be posted HERE on Thursday evening. It was a beautiful sunny day at La Playa Stadium. Good TIMES were had by all. 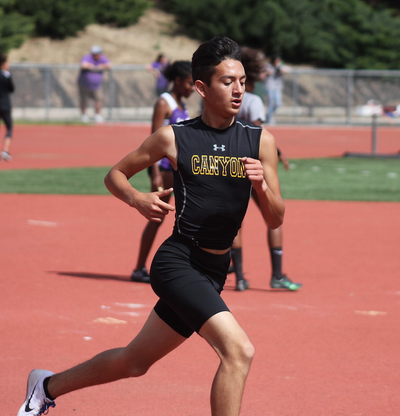 Jeremiah Chow PR'd in the PV with a 14-3 meet record. Our Throwers traveled to Desert Christian HS Saturday and brought home some Medals: Gabby Sanchez won the Discus Throw at 95-11 and placed 2nd in the Shot at 33-0. Rachel Bowers placed 3rd in the Shot at 32-5. Megan Backley was 4th at 2909. Sasha Thomas placed 2nd in the Discus at 92-1. 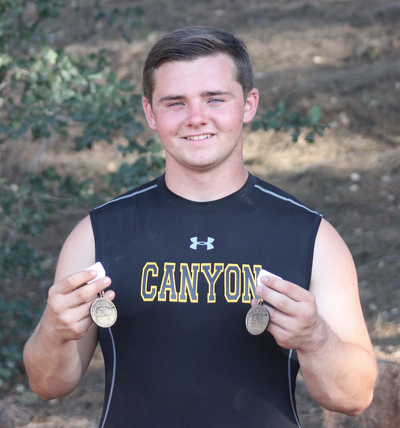 John Elam won the Discus Throw with a PR throw of 146-9 and placed 2nd in the Shot Put with a throw of 45-5. Jacob Lopez placed 3rd in the DT at 118-3. 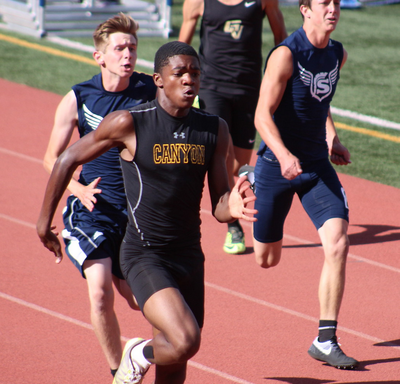 It was a good day for Canyon Track at CV yesterday. There were 10 meet records set, 8 by Canyon Athletes. 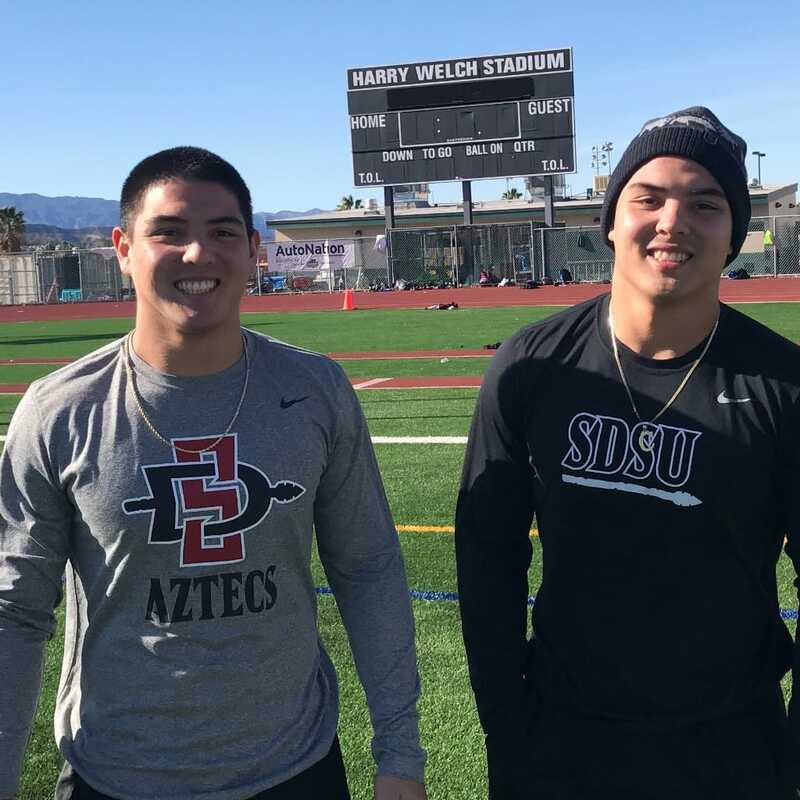 Jeremiah Chow and Jake Bennett each went 14-0 in the pole vault! 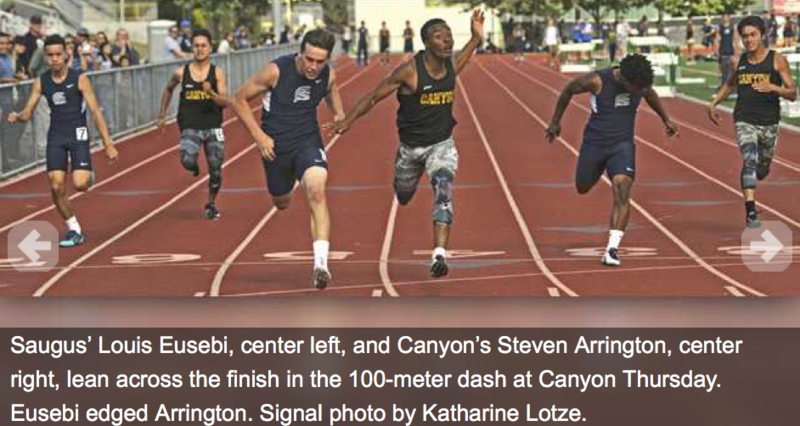 Steven Arrington set marks in the 100 at 10.7 and 200 at 21.9. Seanna Nalbandyan set the MR in the 300 hurdles at 47.8 and joined Keashon Foster, Alaycia and Brittney Young to set the MR in the 4x100 Relay at 50.2. John Elam broke his own meet record in the Discus Throw at 146-7.5. And finally, our boys 4x400 relay team of Shane Oliver, Jordan Henry, Connor Holcomb, and Taylor Tepessano ran a 3:26.6 to set another meet record. 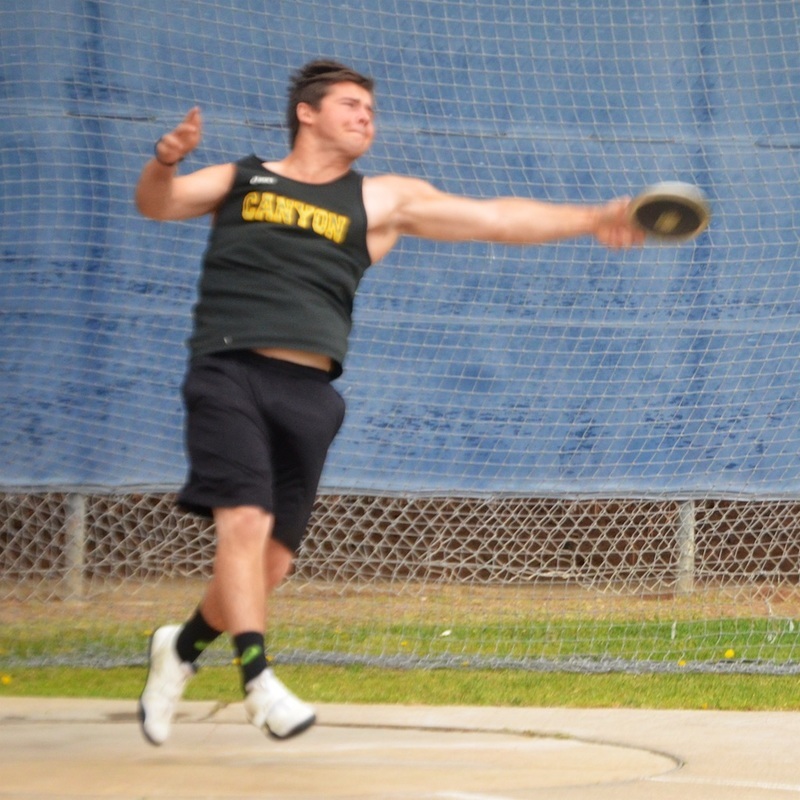 Saturday, our Throwers will travel to Desert Christian/Eastside Invitational. 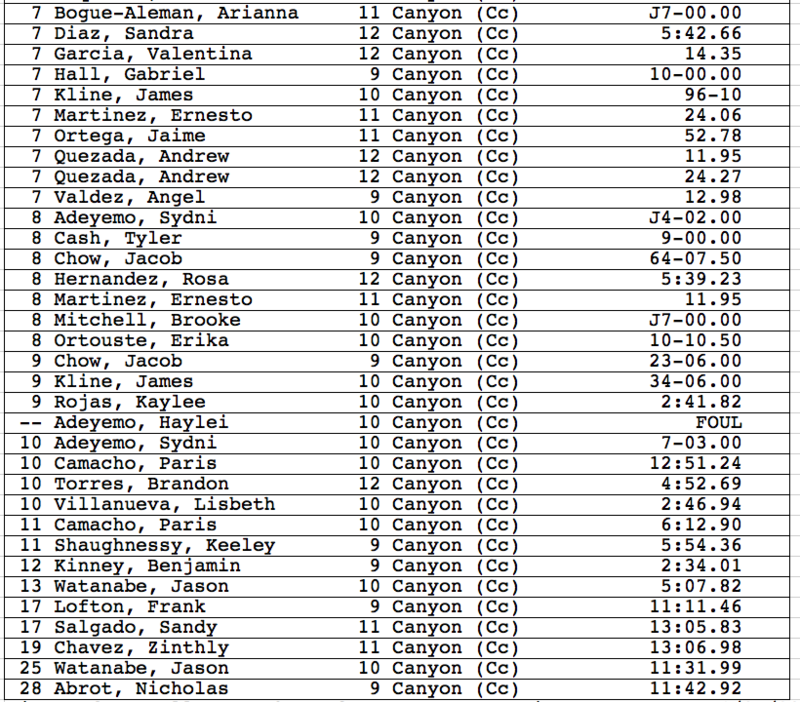 Distance team will have a mandatory workout at Canyon at 8:00 am. 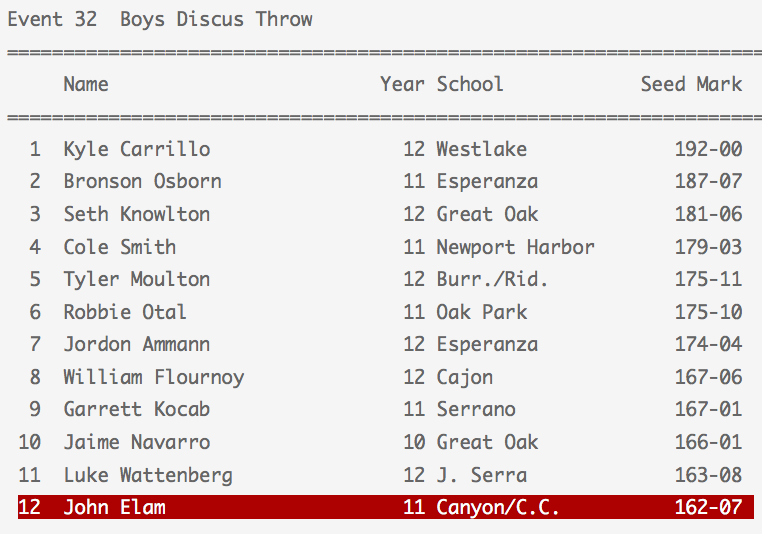 John Elam added his name to the All Time Top Ten List by throwing the discus 146-9 at Redondo Friday night. 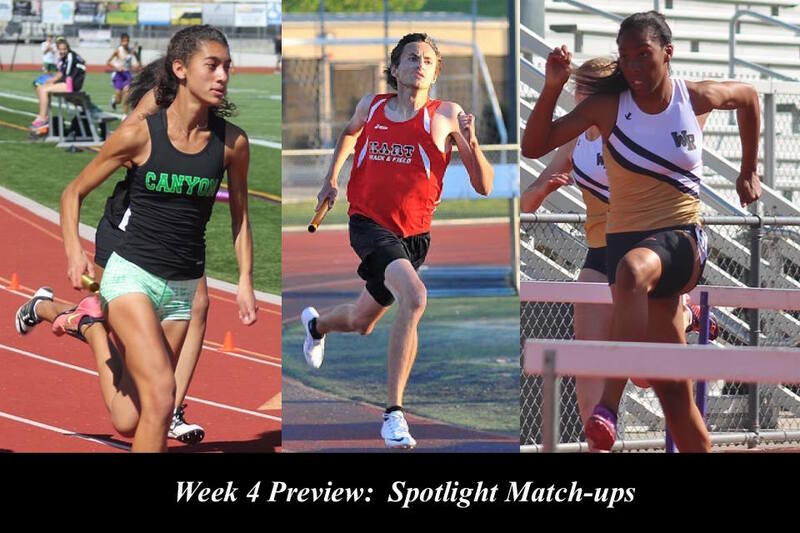 Daily News Track Season Preview Article - Not much said about the Foothill League. 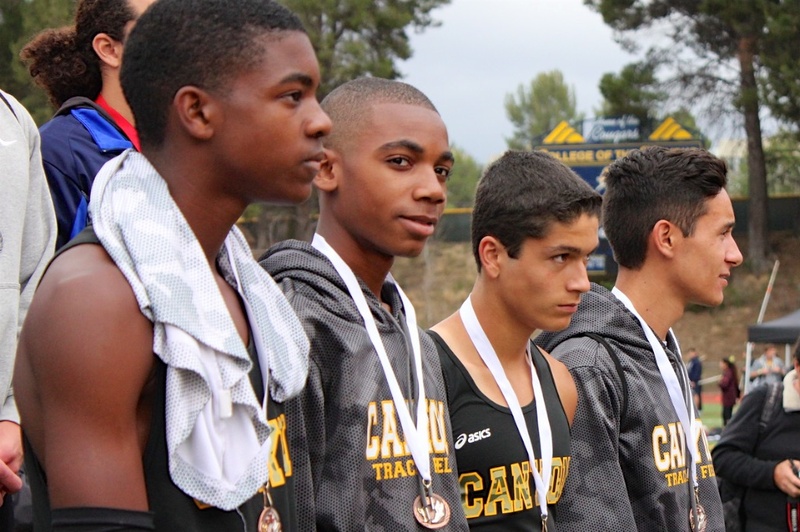 Would you like make a tax deductible donation to the Canyon Track team? Scroll down the right side to "Canyon's Student Store" Select "Track Contributions"
Follow directions to register. THANK YOU! We had an outstanding first meet of the year. 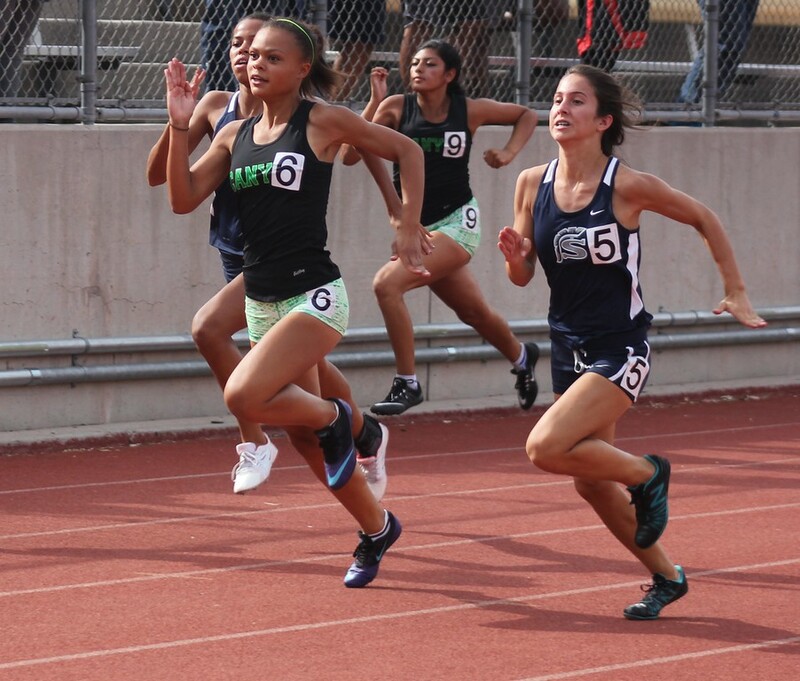 Brittney Young PR'd in the 200 and 400 and both times made our Top Ten List. Seanna Nalbandyan had a big PR in the 100 hurdles and also made our Top Ten List. John Elam had a huge PR in the shot throwing 50-7 which puts him 10th on our "All Time Top Ten List". 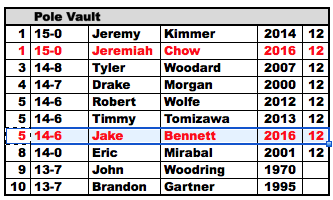 Despite being a bit under the weather, we had two vaulters clear 13-0, Jeremiah Chow and Jake Bennett. Saturday, after our SCV Invite, take the family out to dinner at Panda Express of Sierra Hwy and Via Princessa! 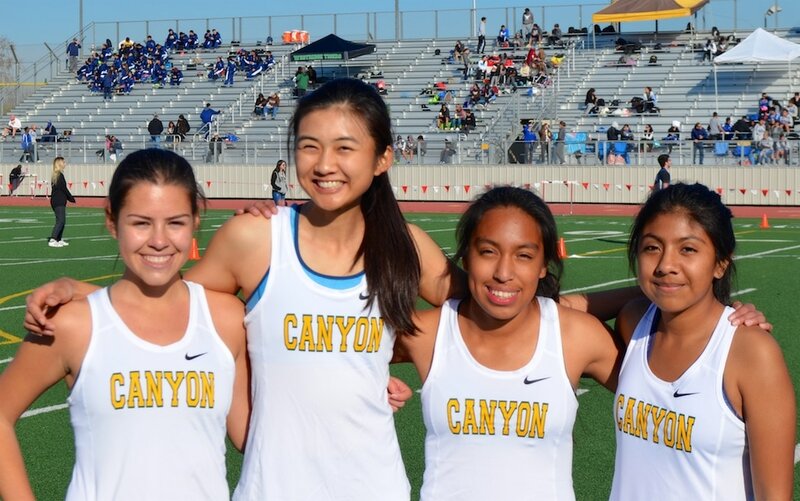 Shannon Murakami runs a 10:09.29 3200 meters to break the 17 year old record set by Canyon's Lauren Fleshman. 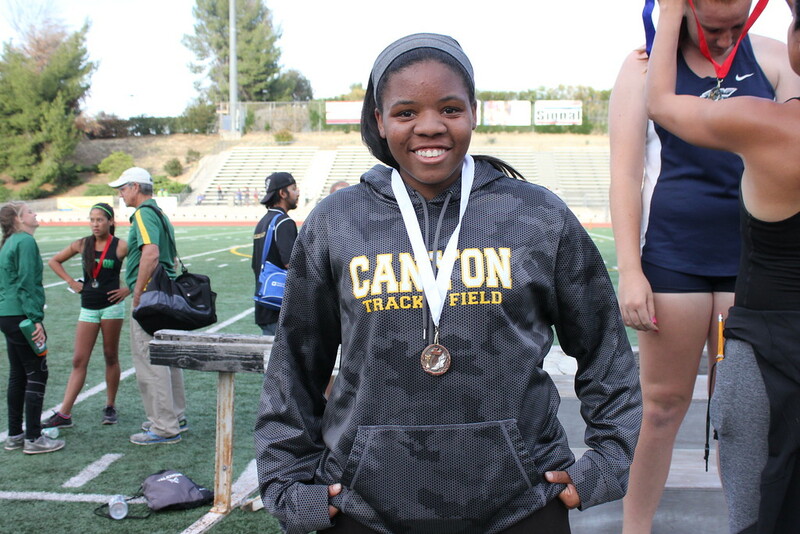 Miki Barber runs the fastest 100 meters 11.57 ever run by a female on the Canyon Track. She was a member of USA's Gold medal World Championship 4 x 100 team in 2007. Lance Panariello featured on the SCV Hurdles website.